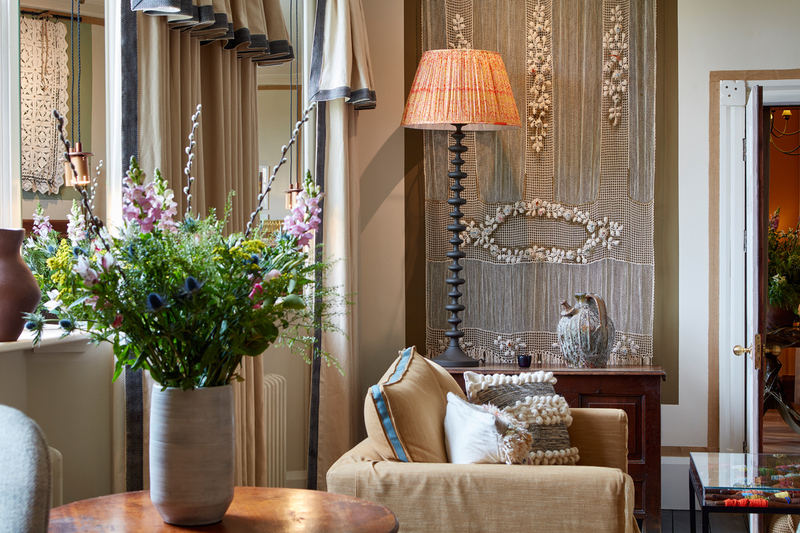 It’s been a delight to be working with Yvonne Jones at Chameleon Interiors again throughout this year. 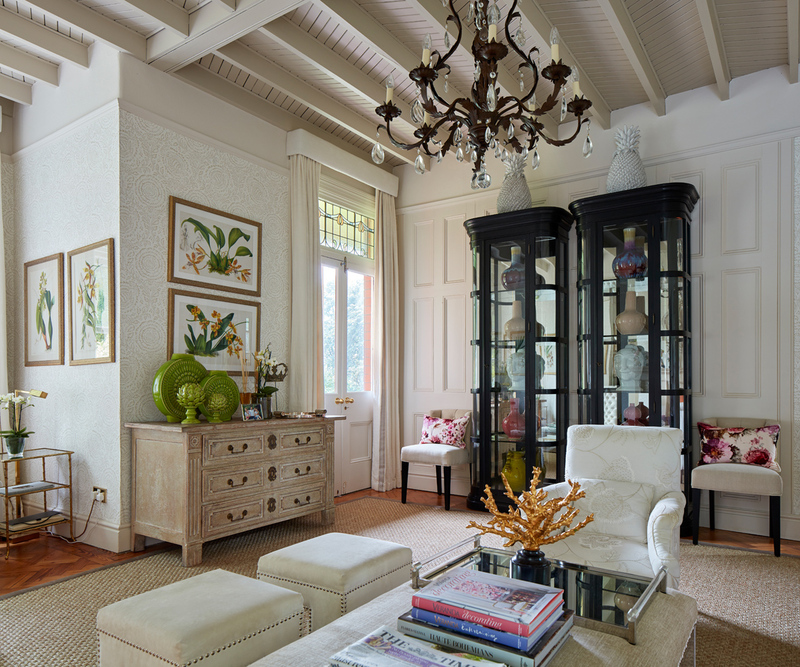 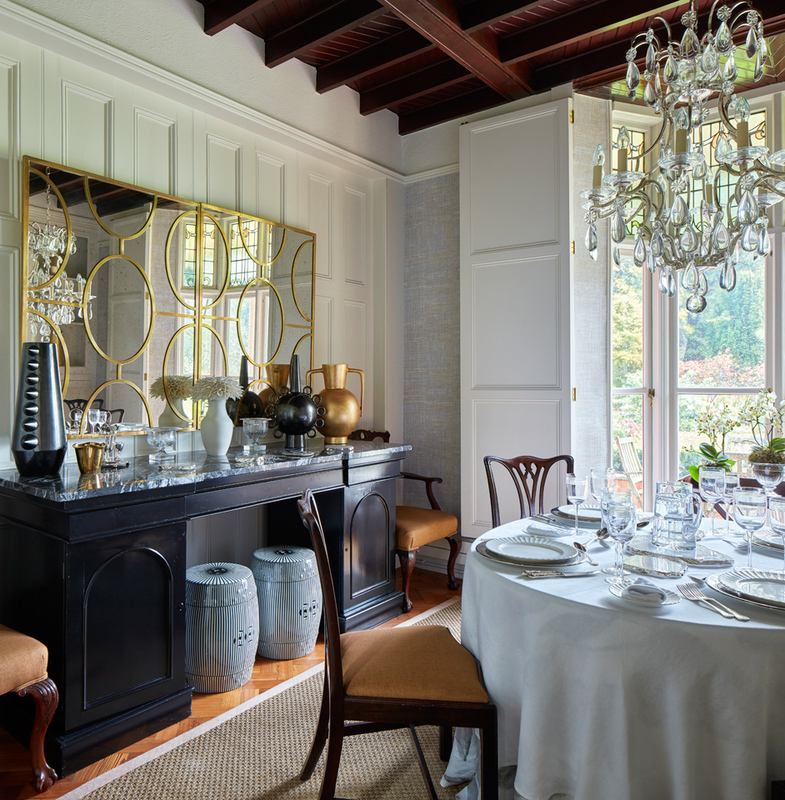 It’s always a pleasure visiting the beautifully appointed homes that she designs. 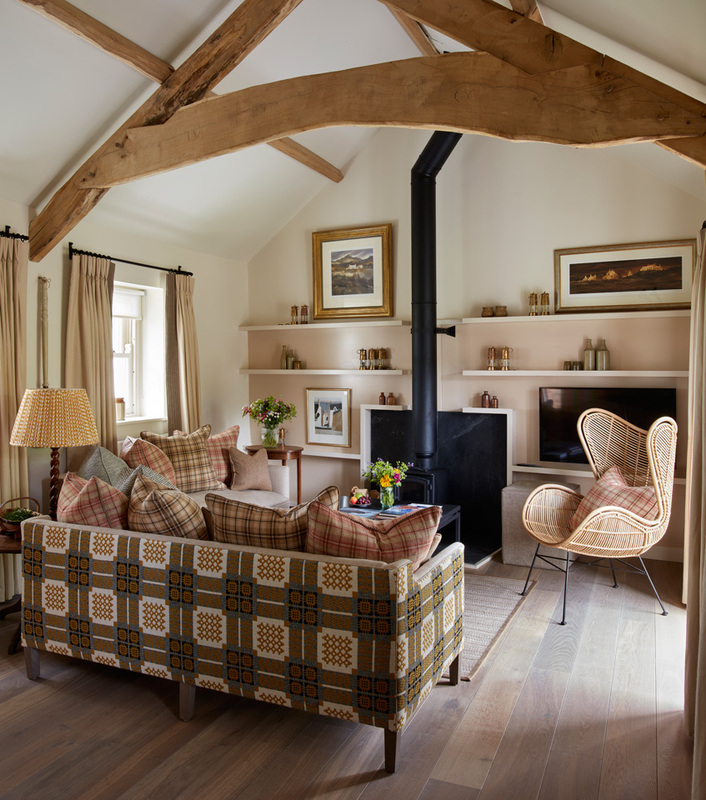 These are a small selection from two recent projects. 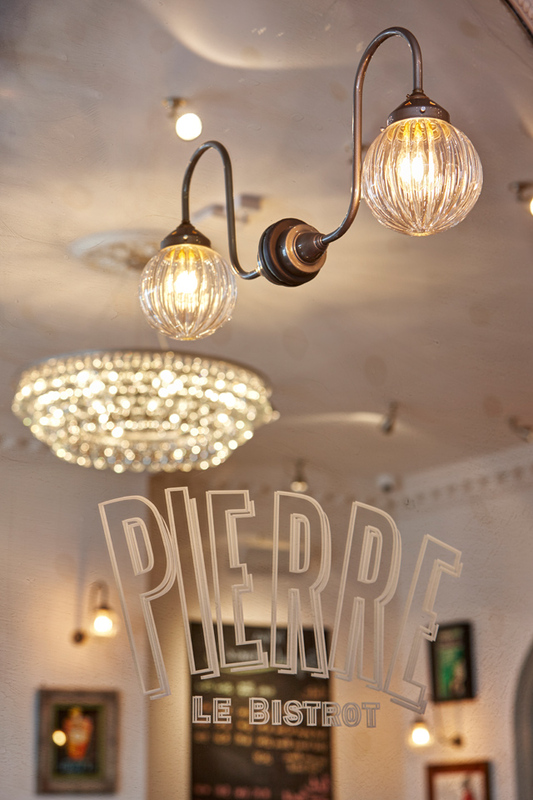 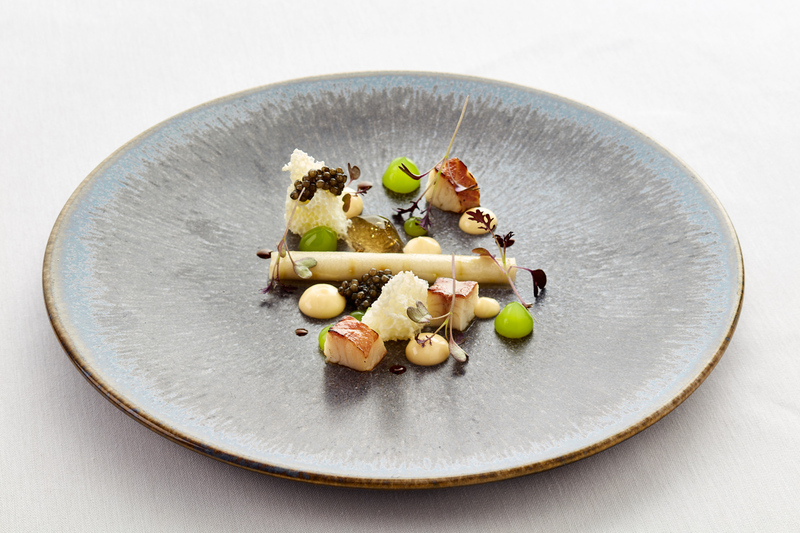 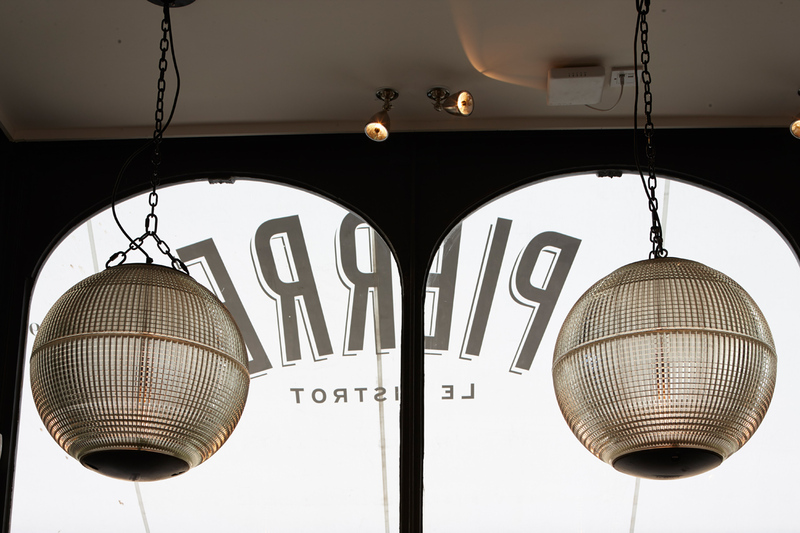 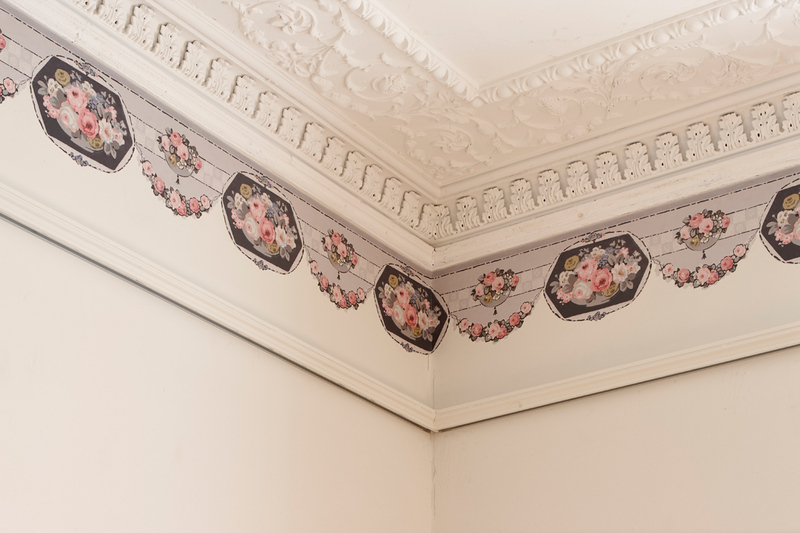 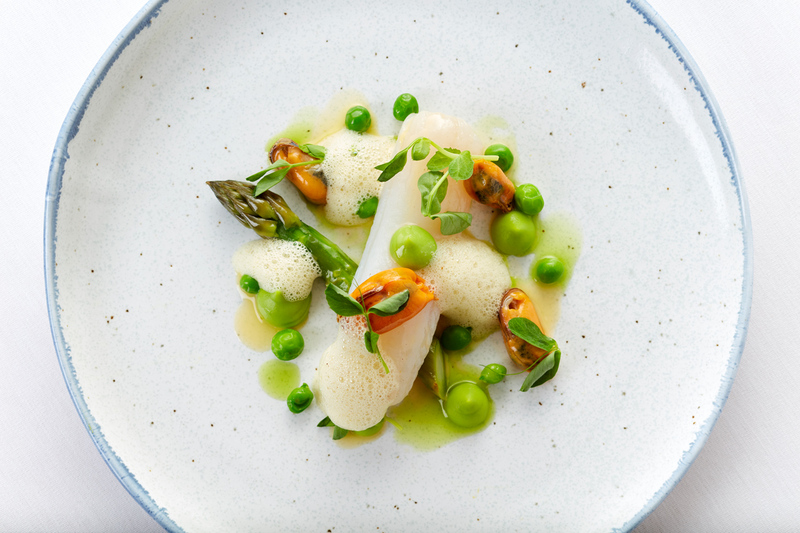 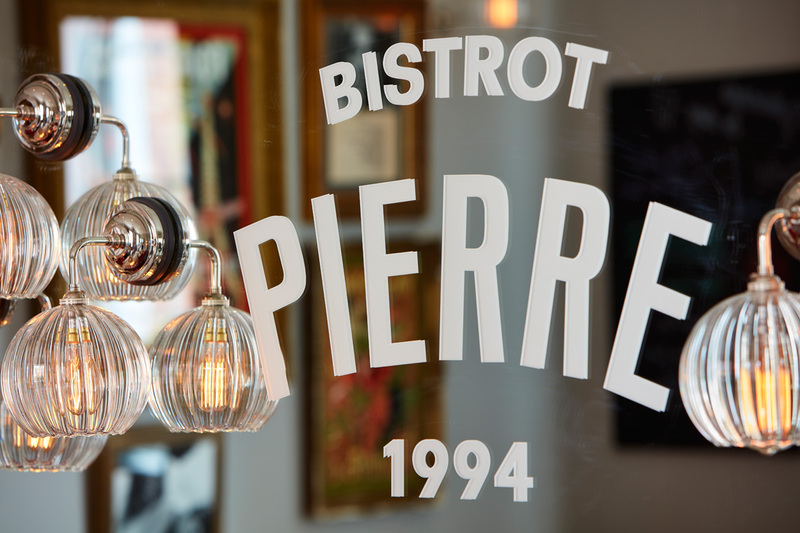 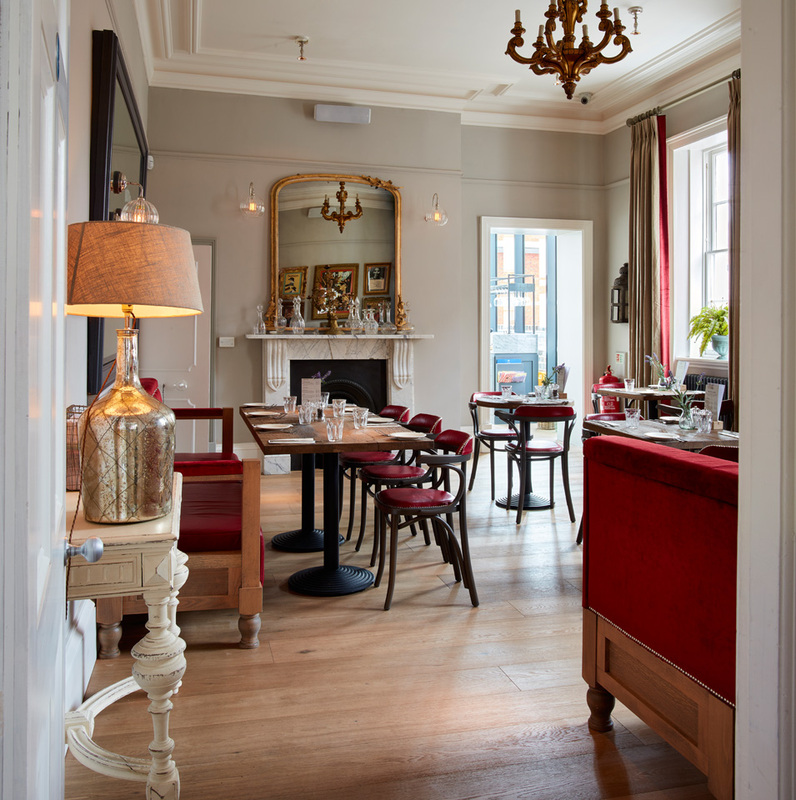 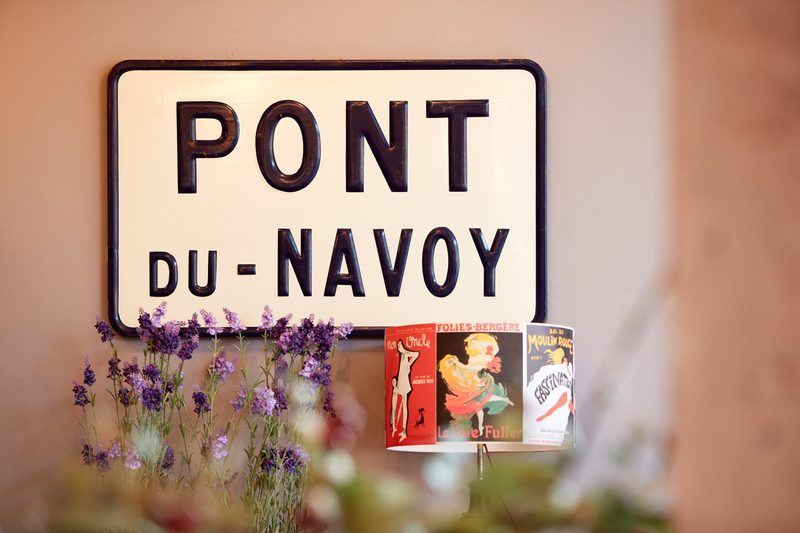 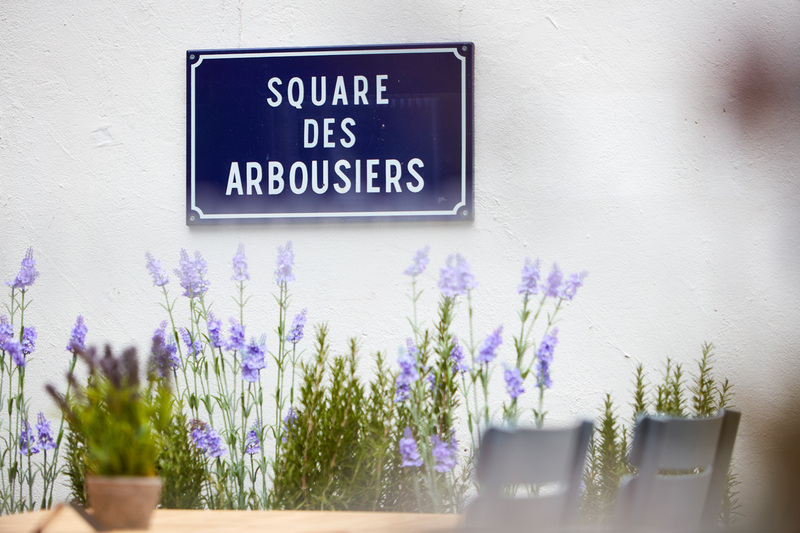 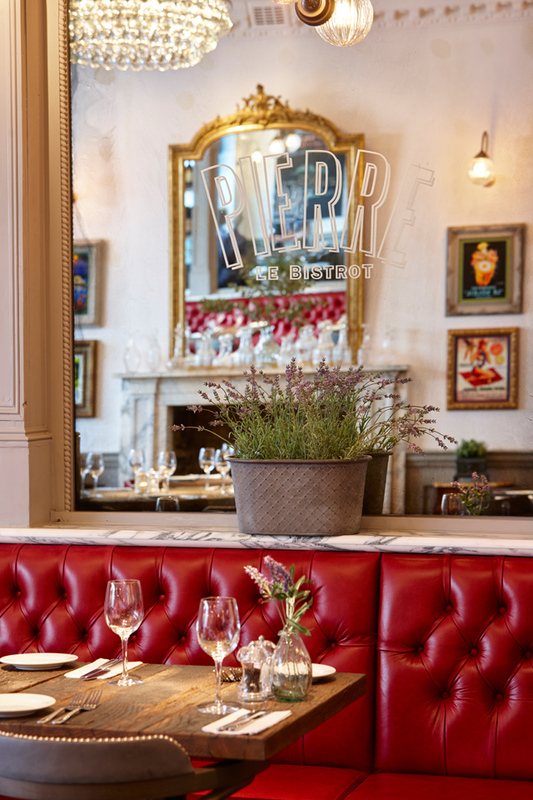 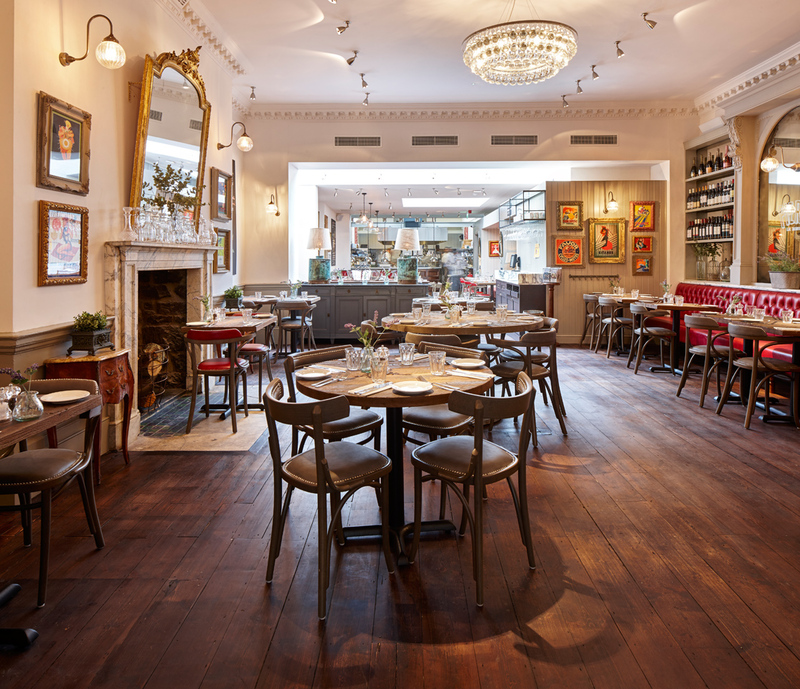 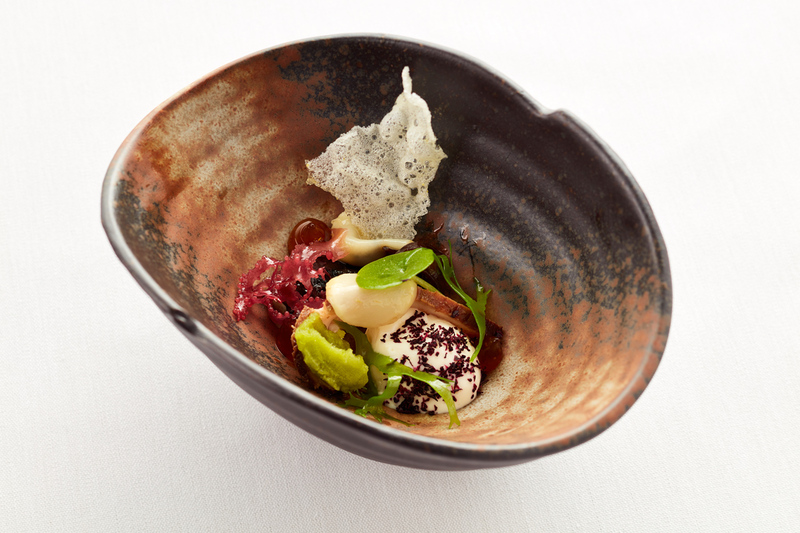 A small section of images from some of the other shoots of new openings and refurbishments for Bistrot Pierre this year. 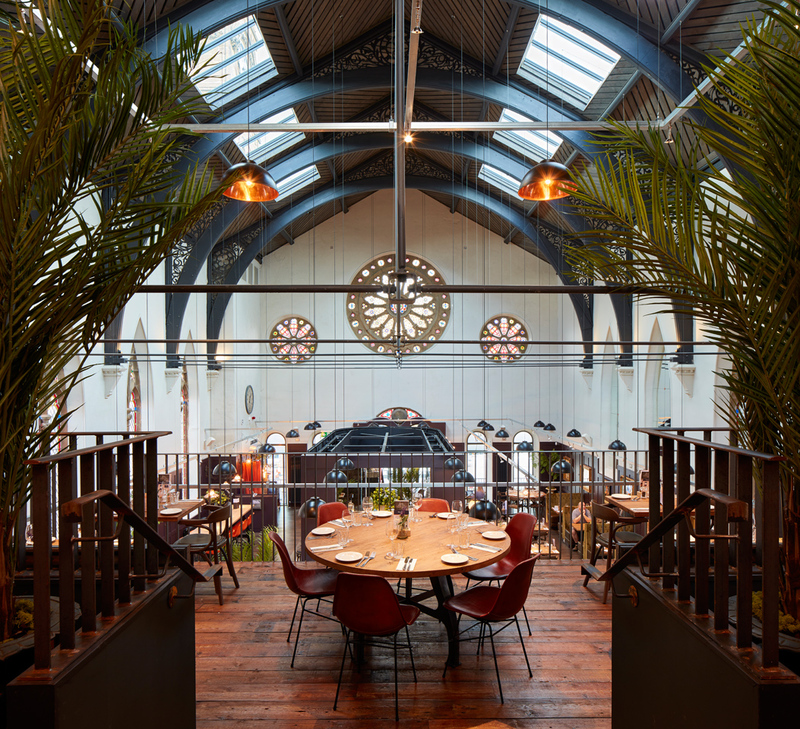 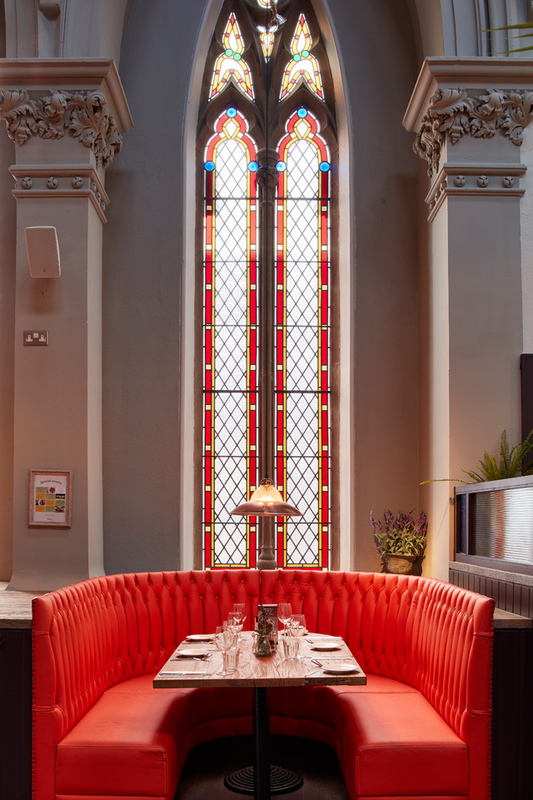 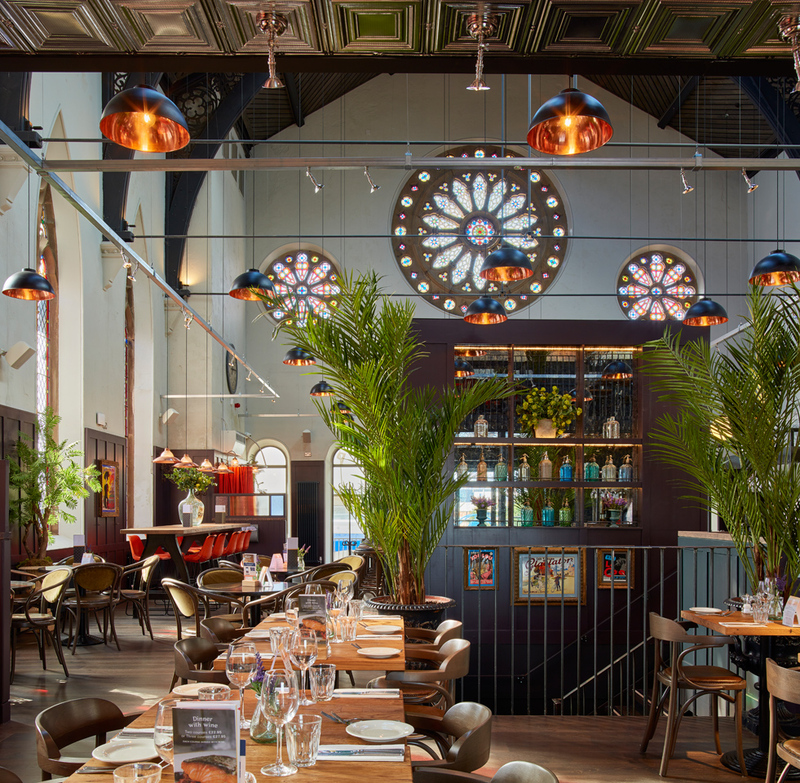 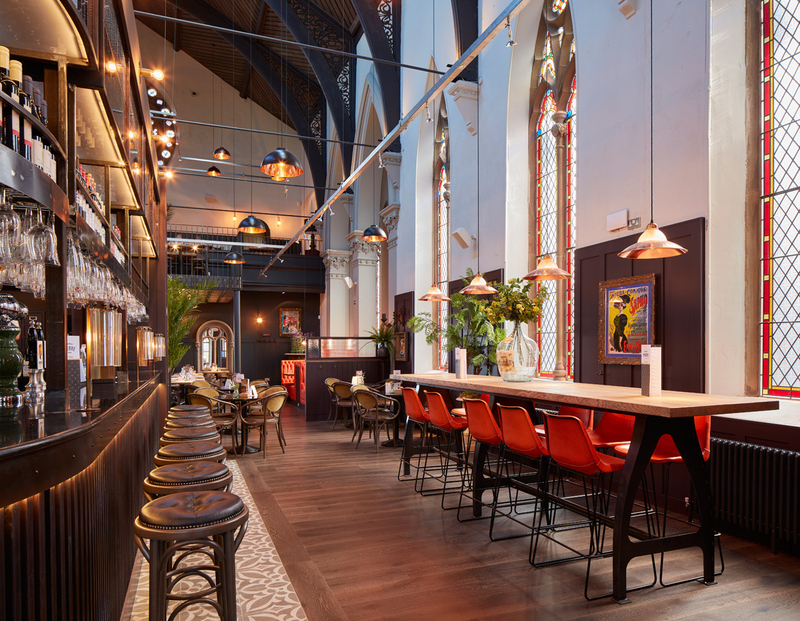 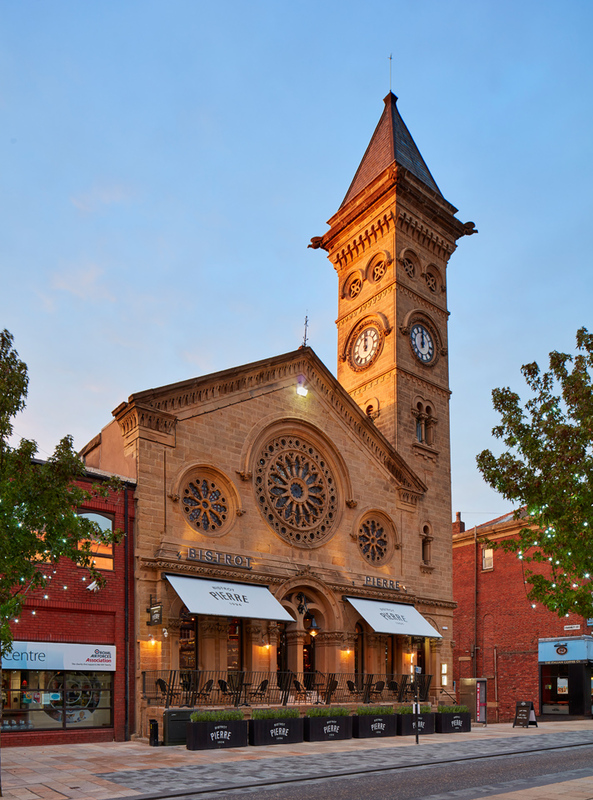 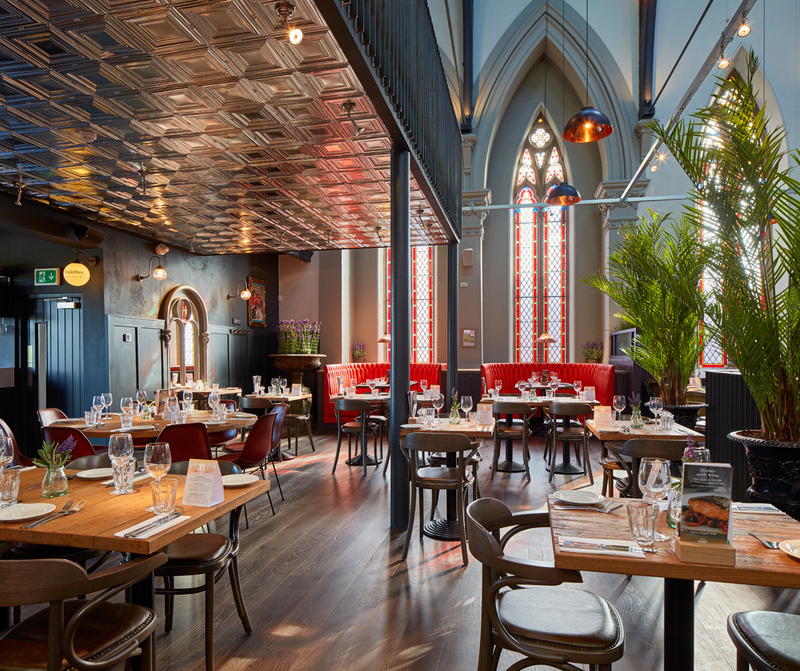 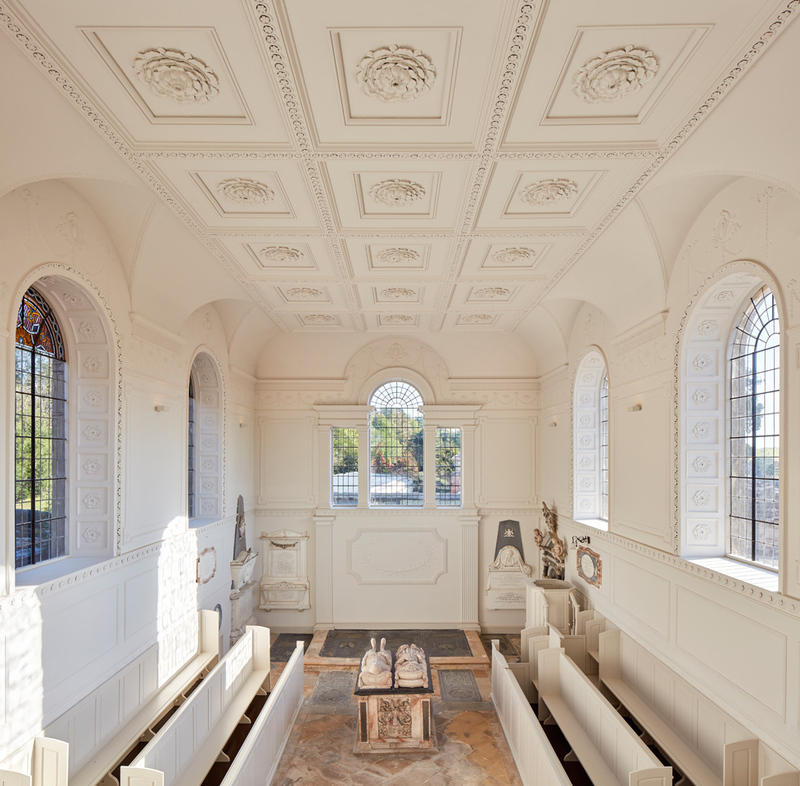 One of the most interesting restaurant shoots this year is this stunning conversion of an old church for Bistrot Pierre’s latest excellent restaurant. 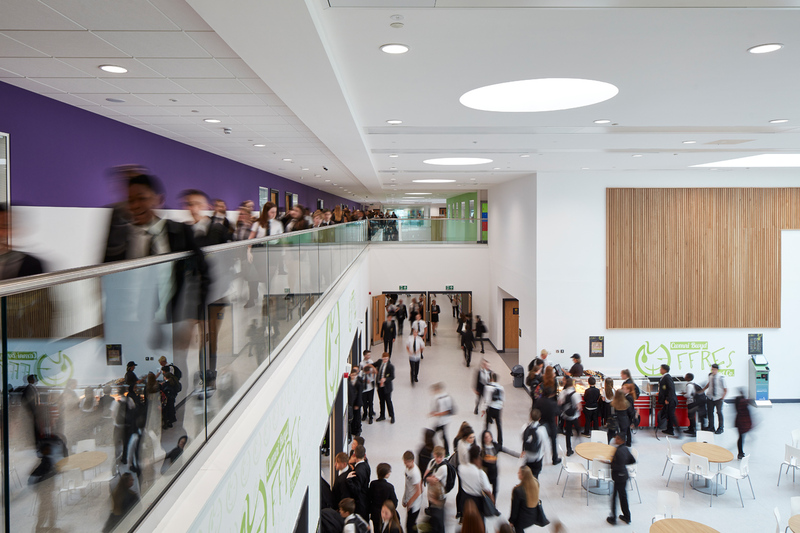 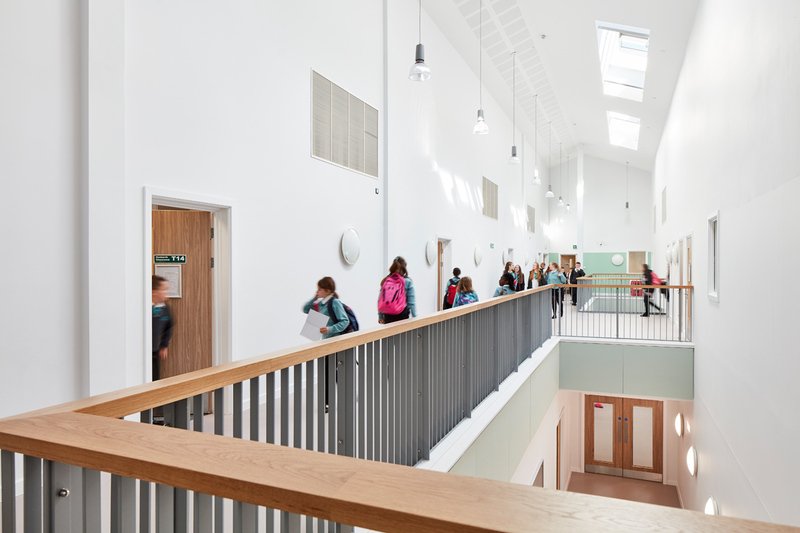 Enjoyable day photographing this fantastically light and airy new school and enjoying the banter with the schoolchildren! 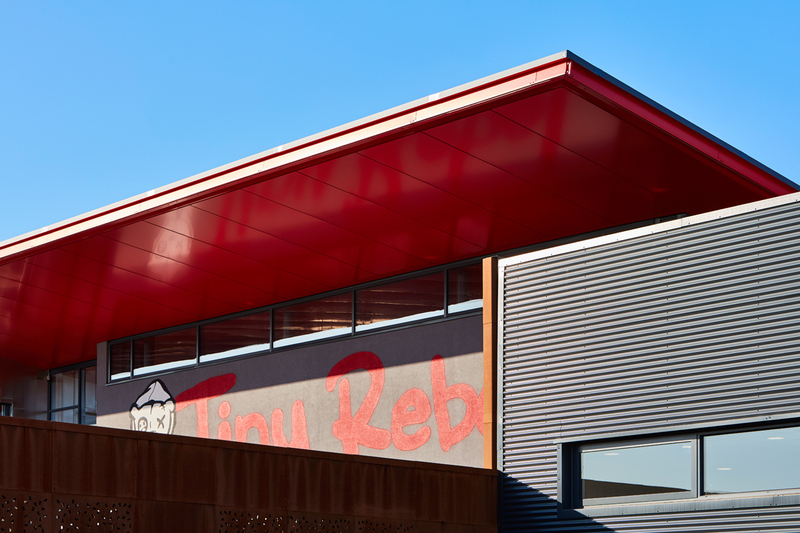 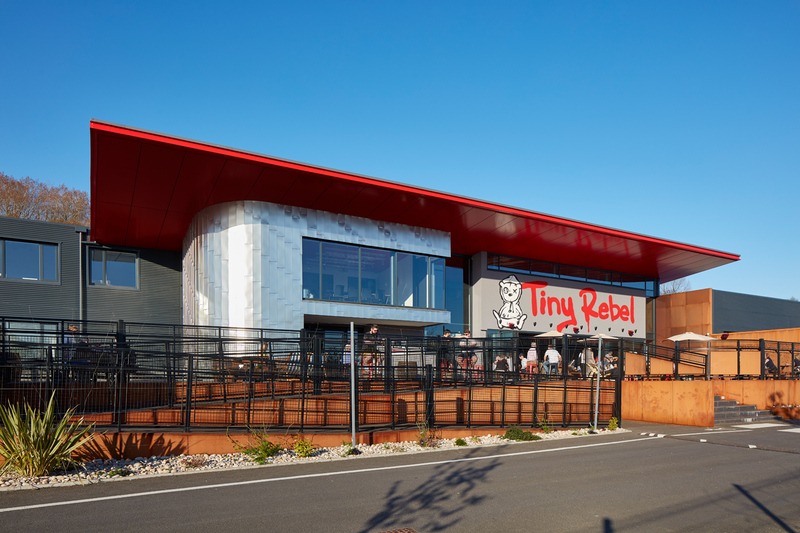 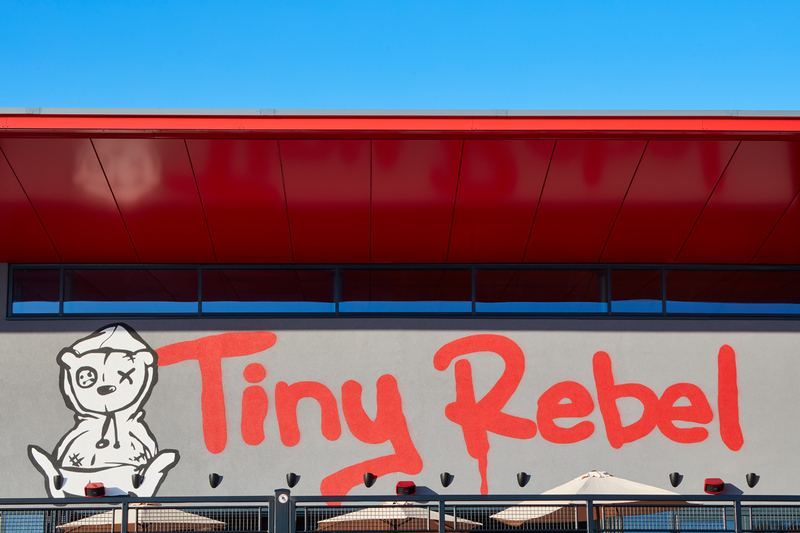 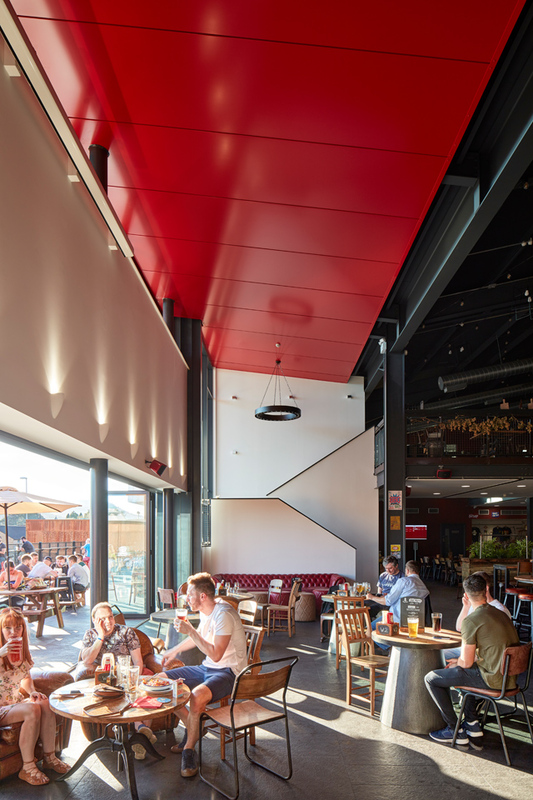 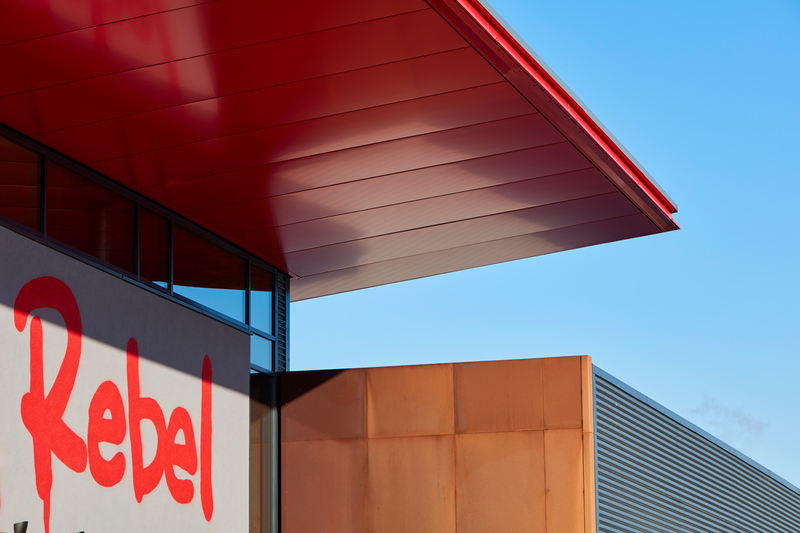 Effective and bold use of cladding at the Tiny Rebel Brewing Company near Newport for a worldwide cladding manufacturer. 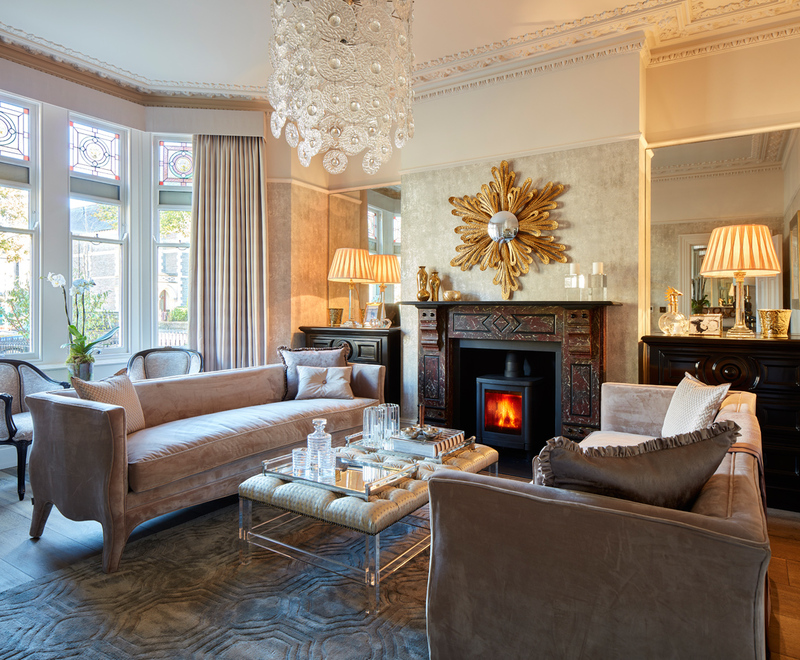 A return visit to fabulous The Grove hotel located just outside Narberth to photograph the refurbished reception, lounges, bar and restaurant. 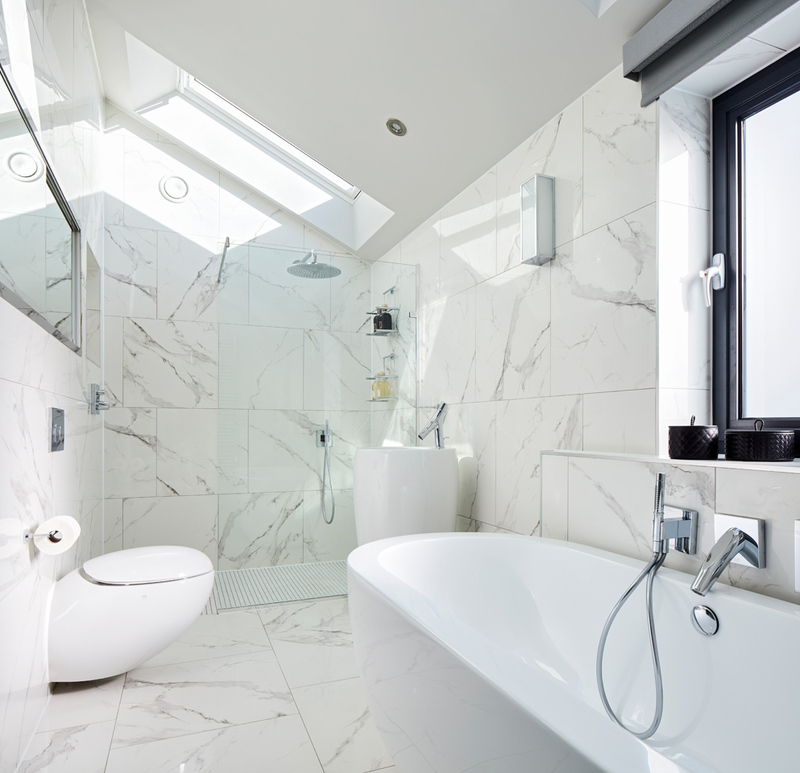 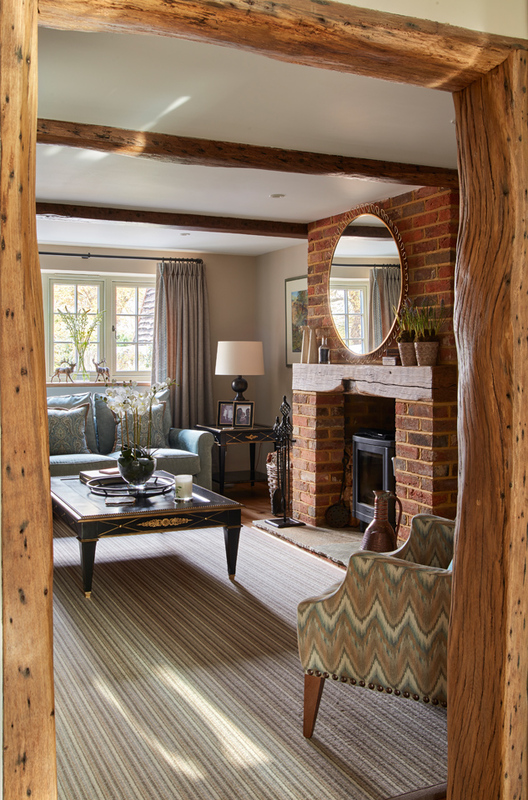 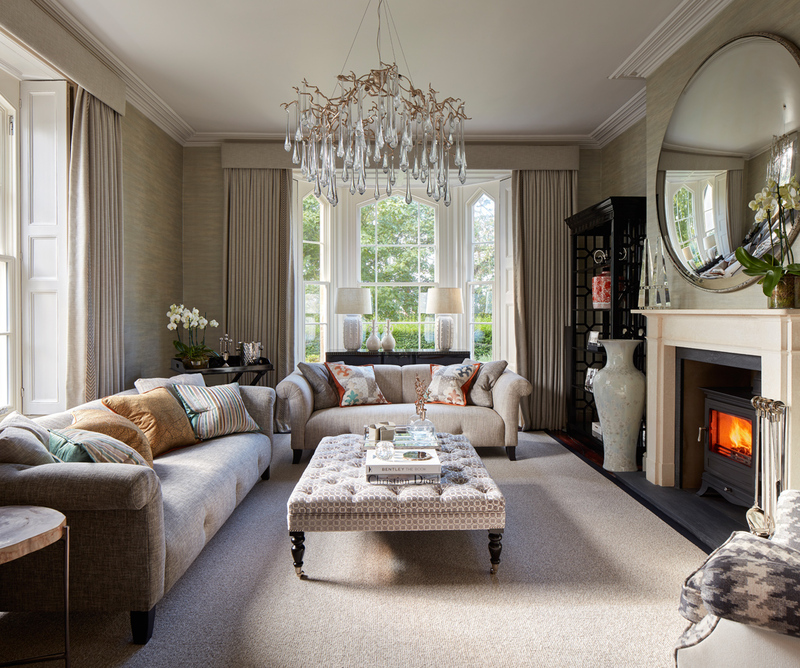 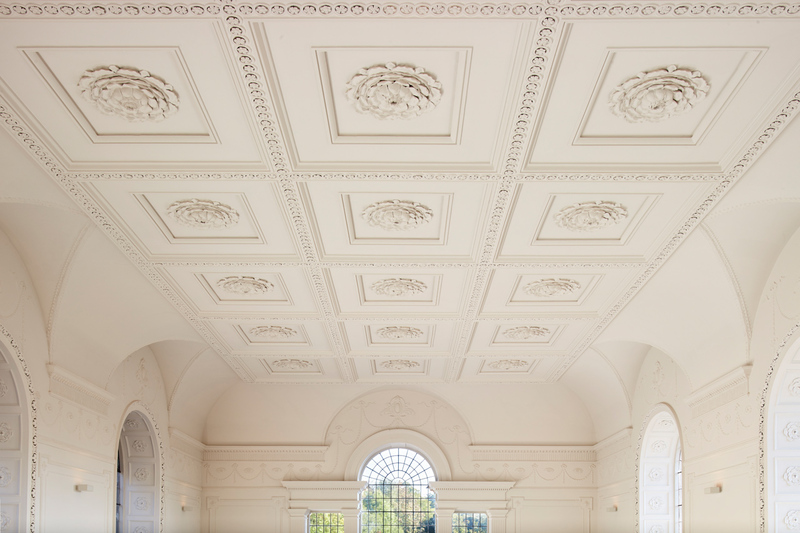 A stunning refurbishment! 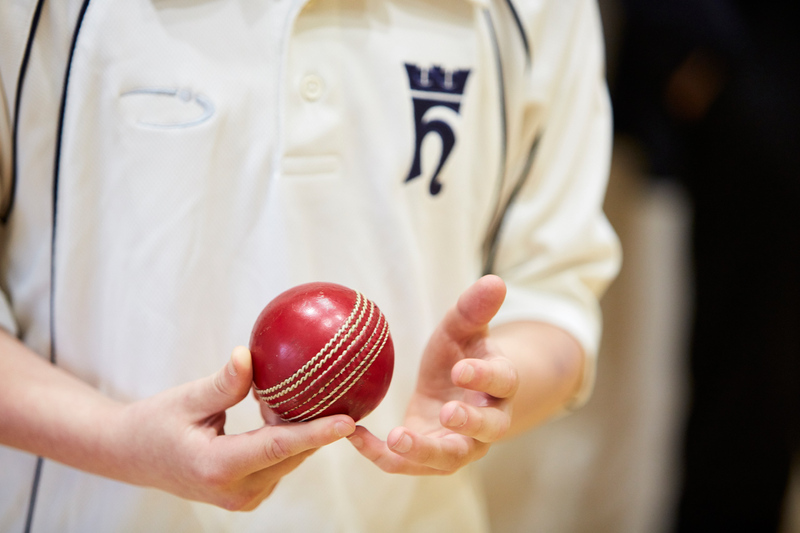 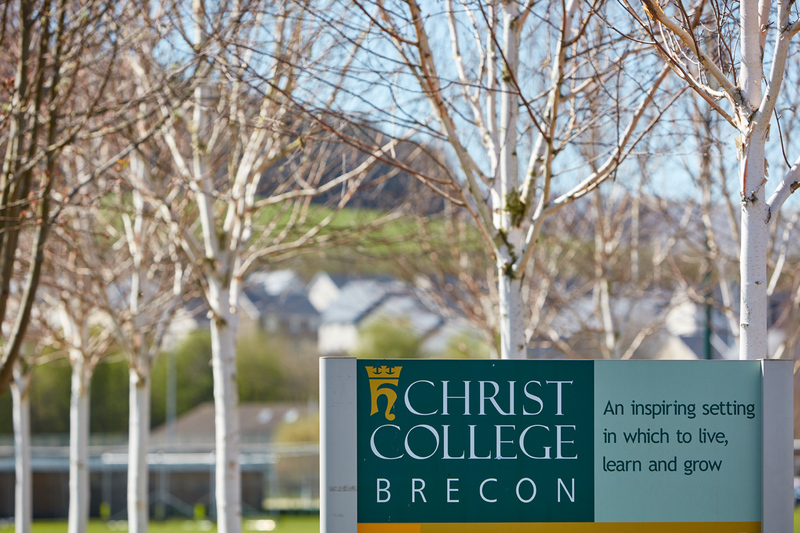 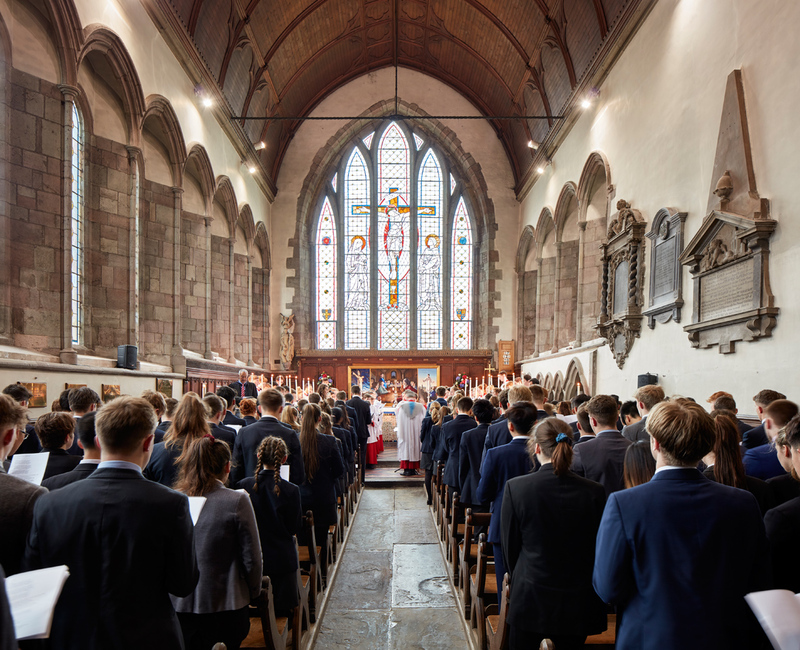 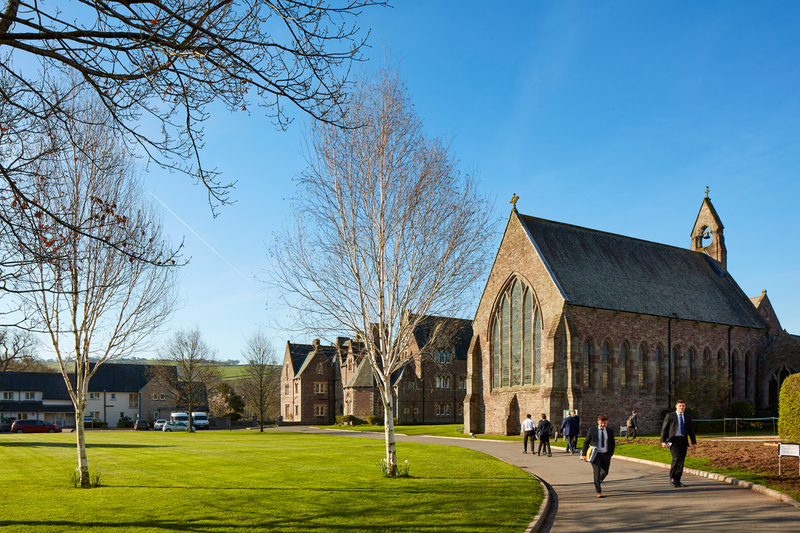 An enjoyable few days with glorious weather at the fabulously located Christ College in Brecon photographing for their new prospectus and website. 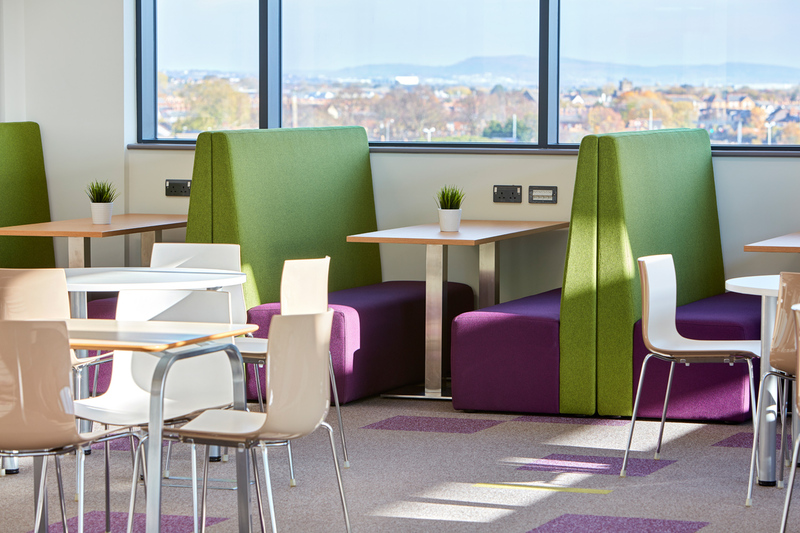 What a great place to study! 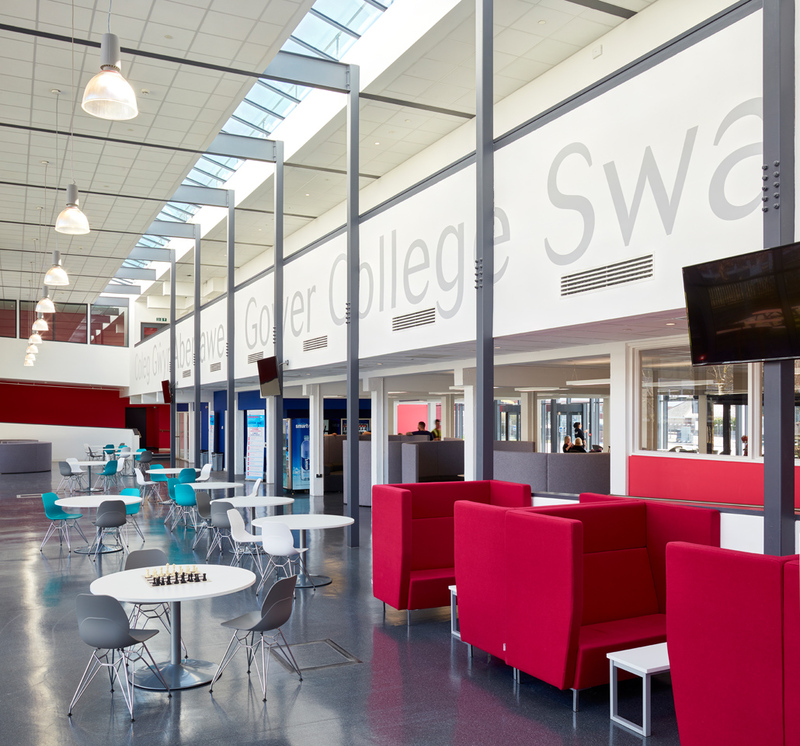 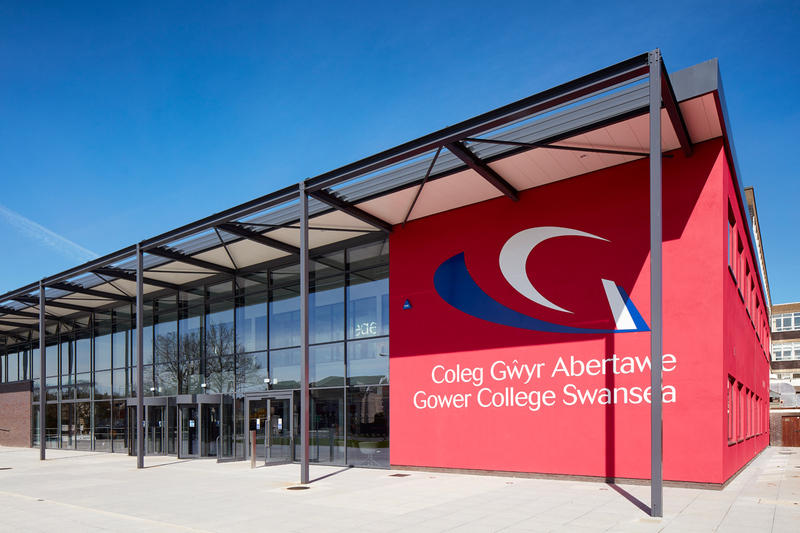 I had the pleasure of returning to Gower College where I studied in my teenage years (many years ago!!) 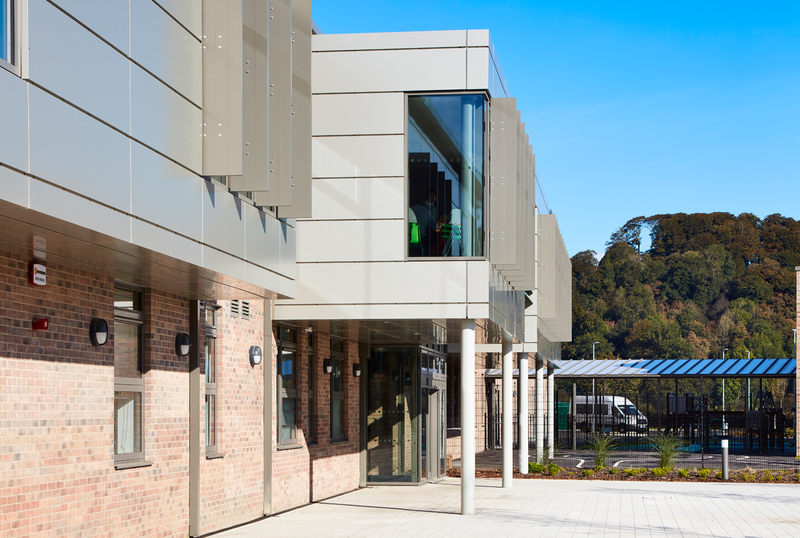 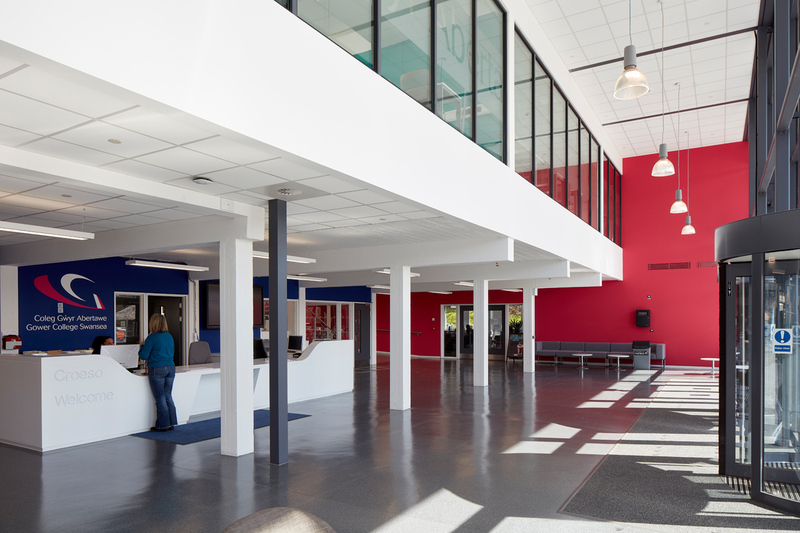 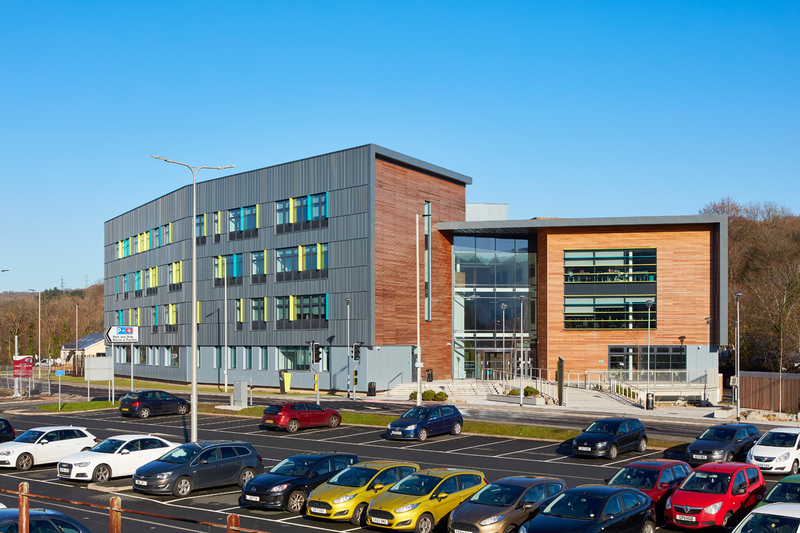 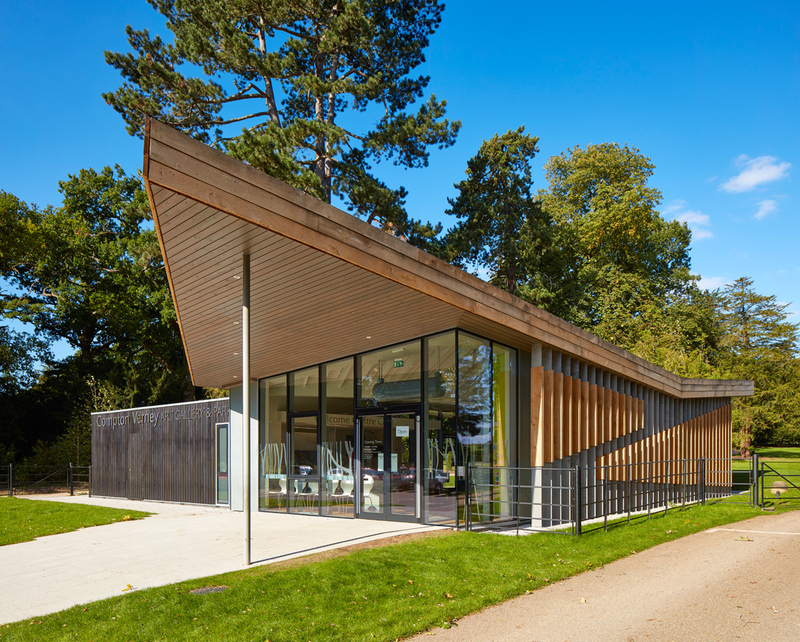 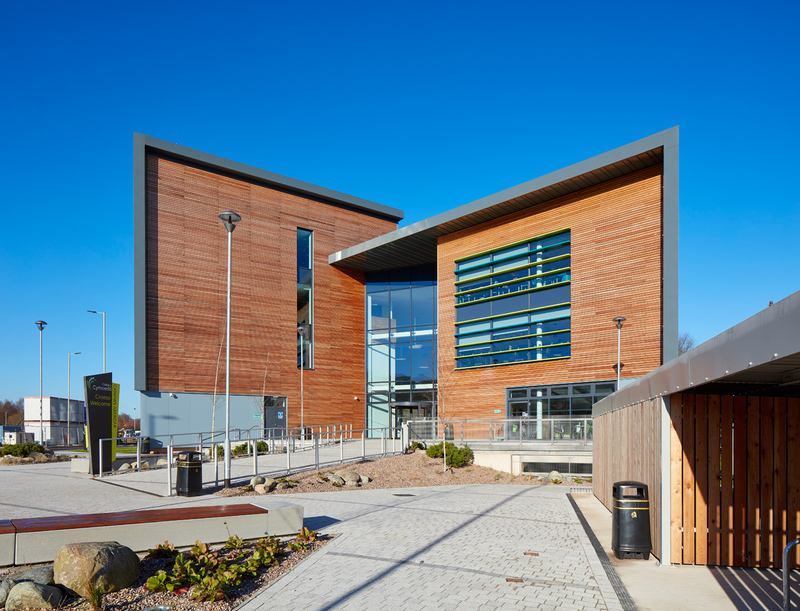 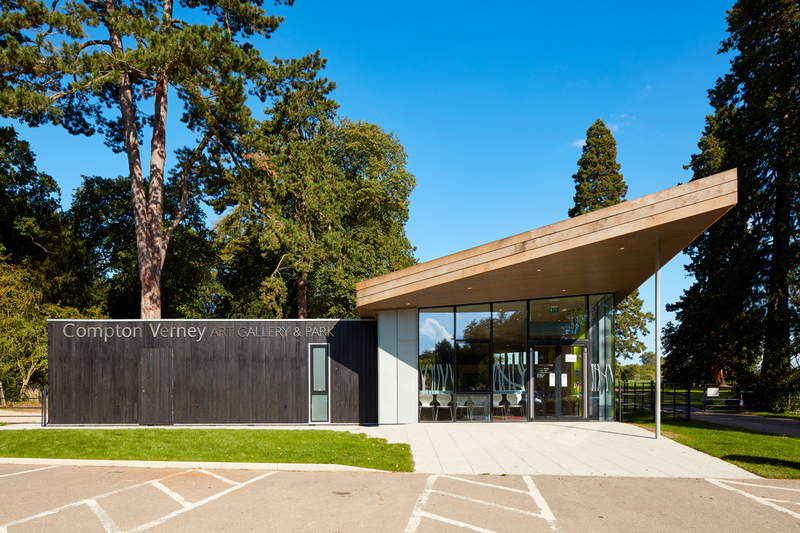 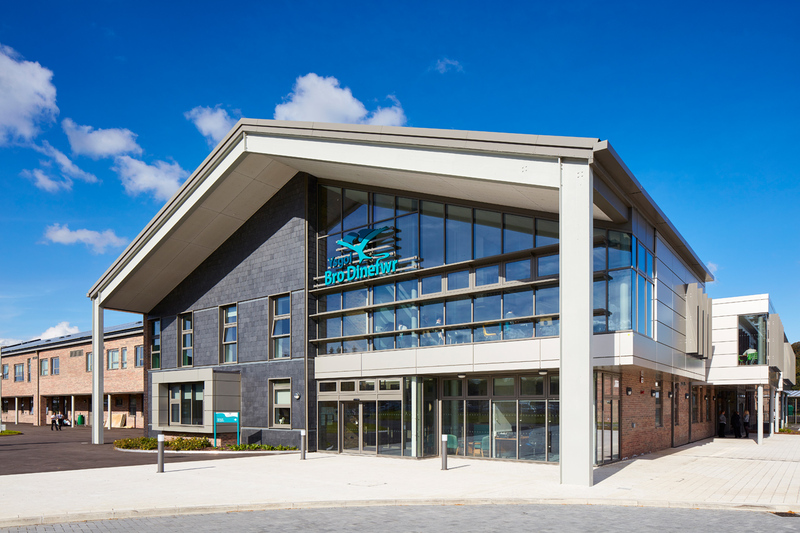 to photograph the new reception building at the college after a fire at the site in 2016. 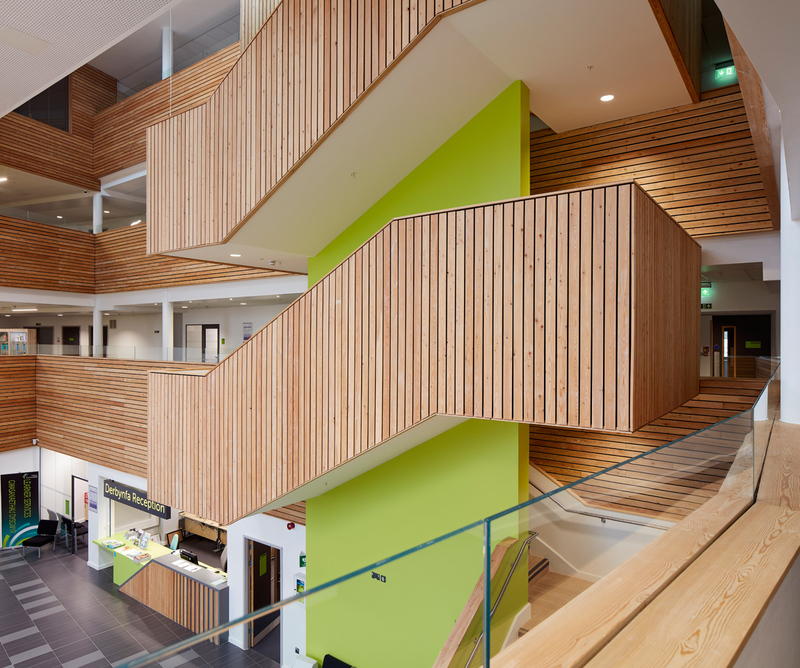 Totally unrecognisable from my time as a student there! 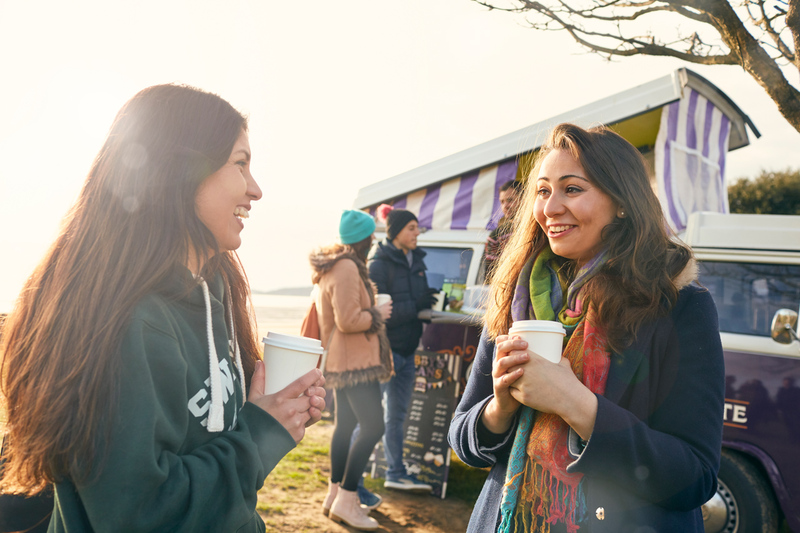 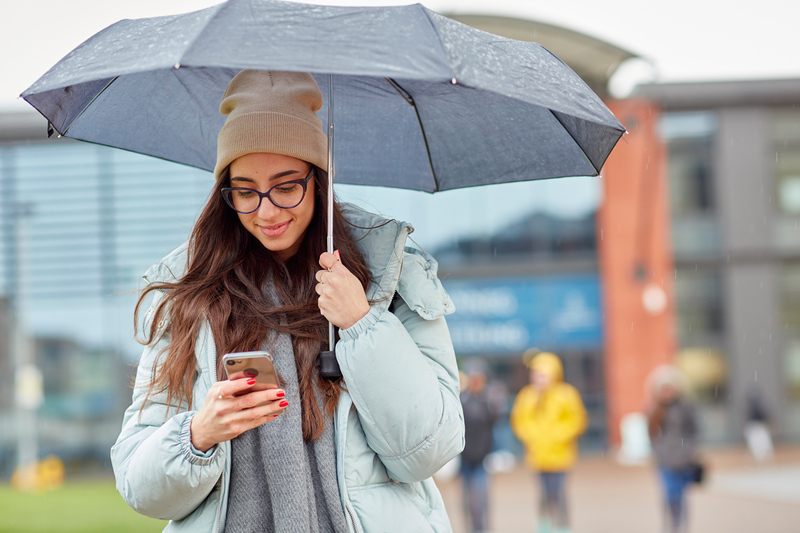 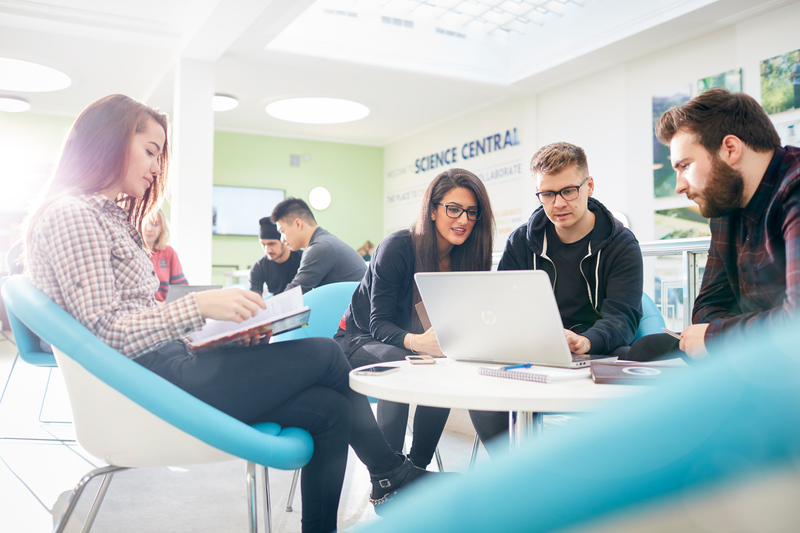 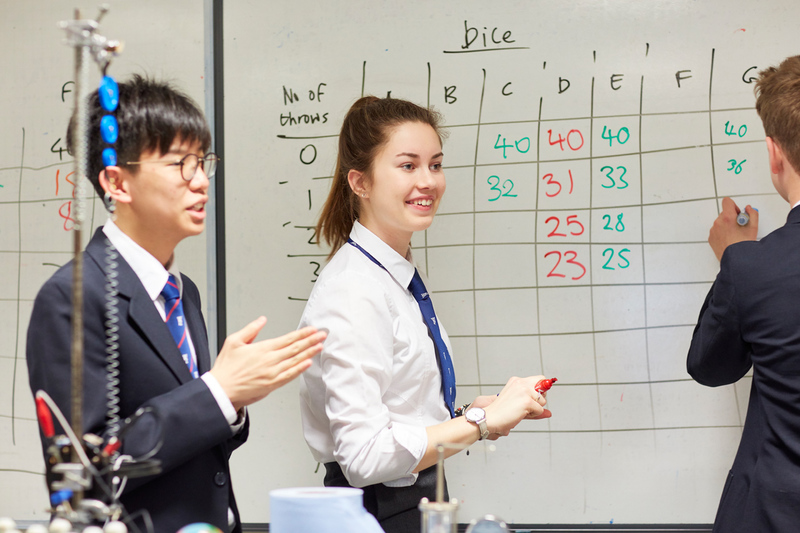 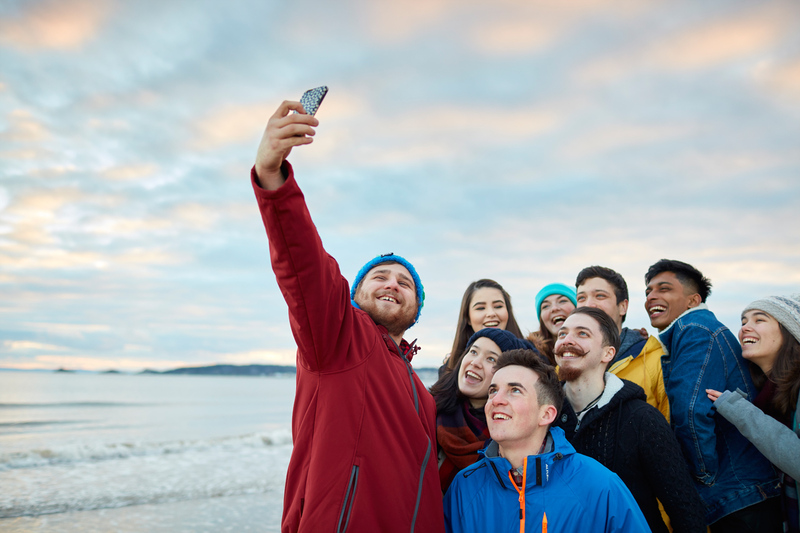 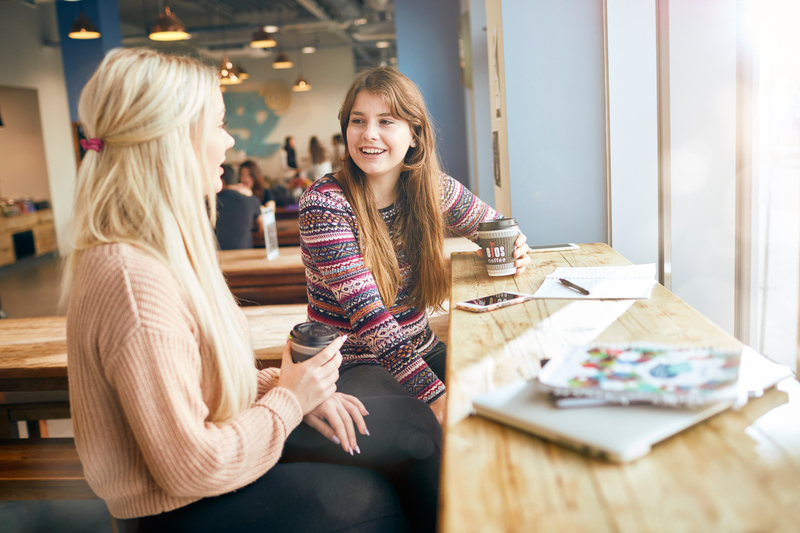 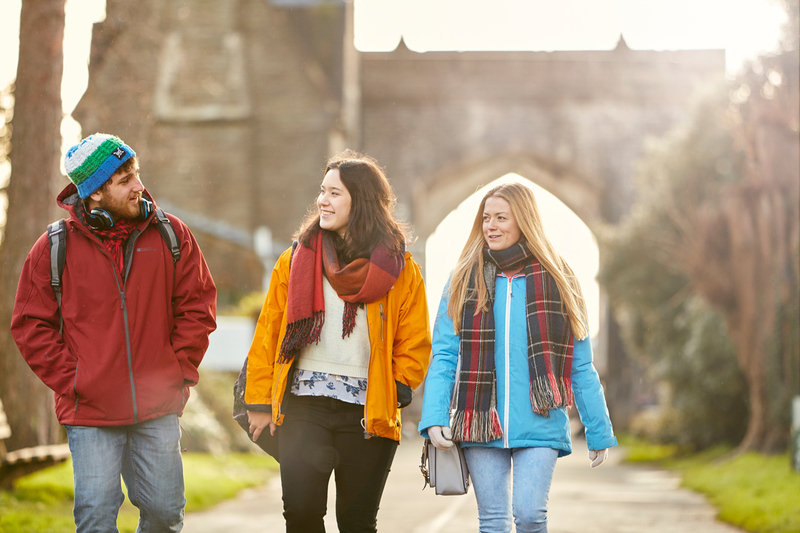 I had the pleasure of 3 days late in 2017 working with some very willing students at Swansea University’s two campuses photographing a range of imagery for their new prospectus and upcoming campaigns. 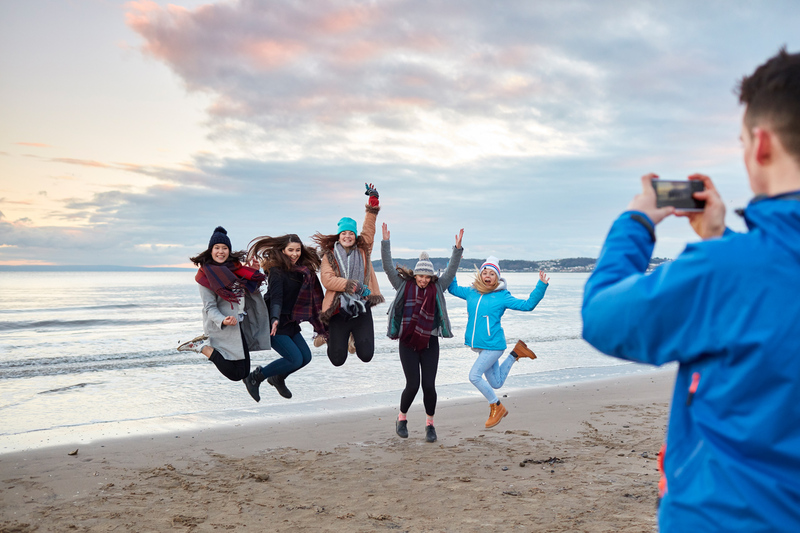 The weather was a bit chilly and changeable but Swansea Bay as a location never disappoints. 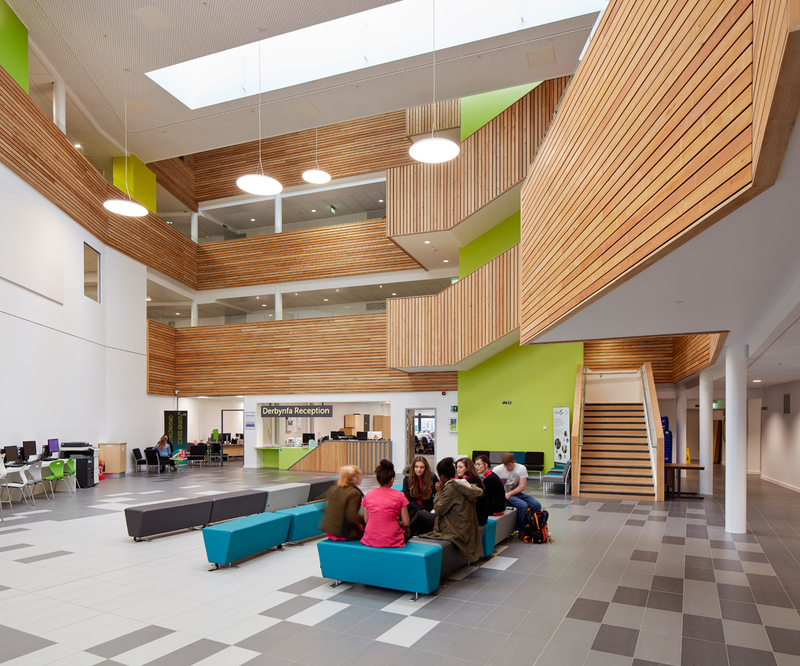 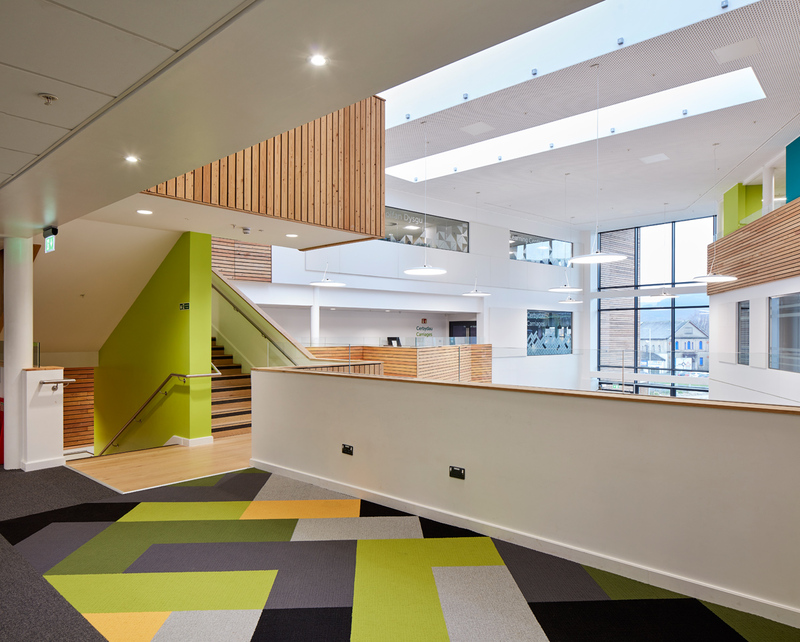 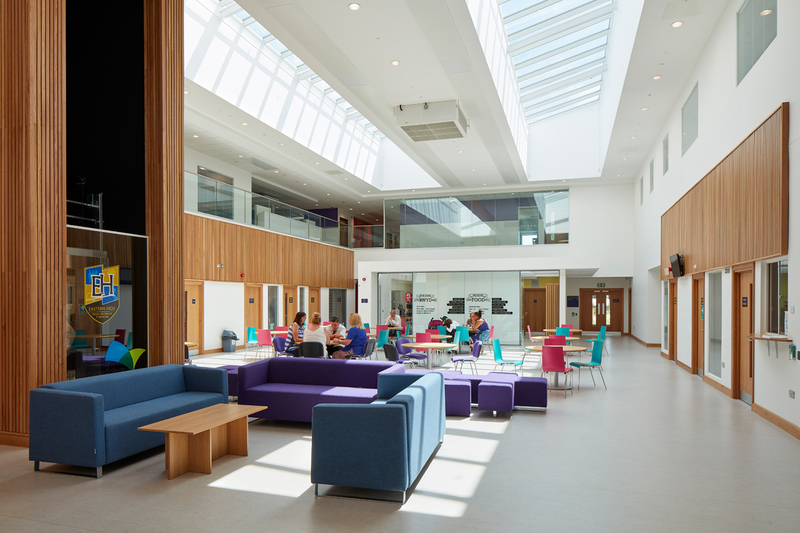 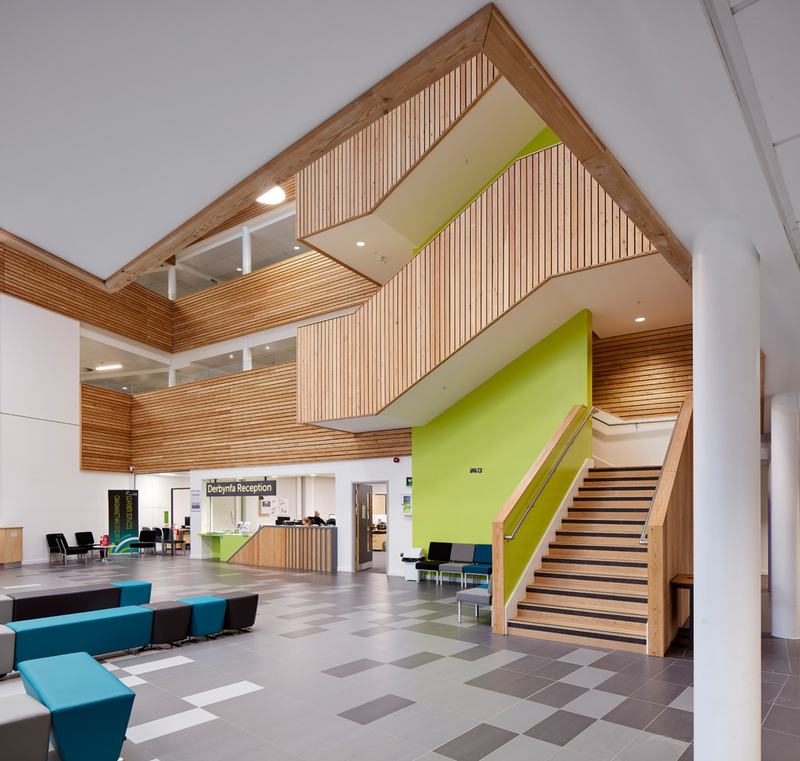 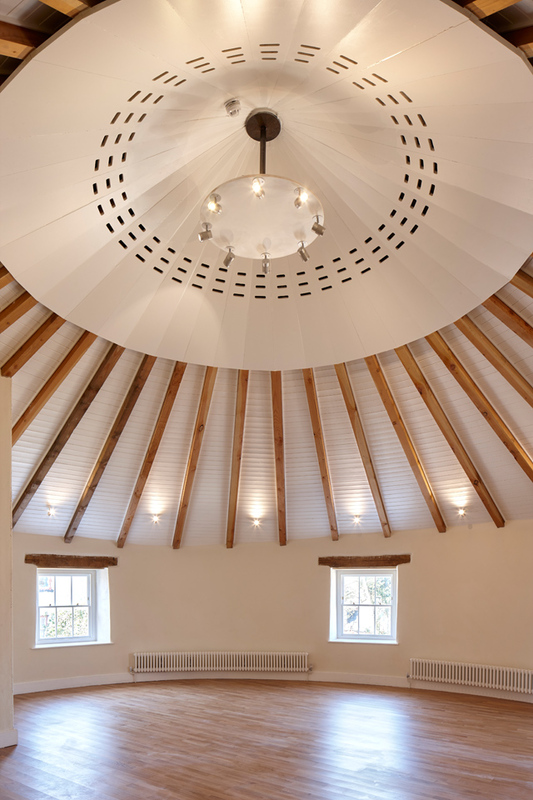 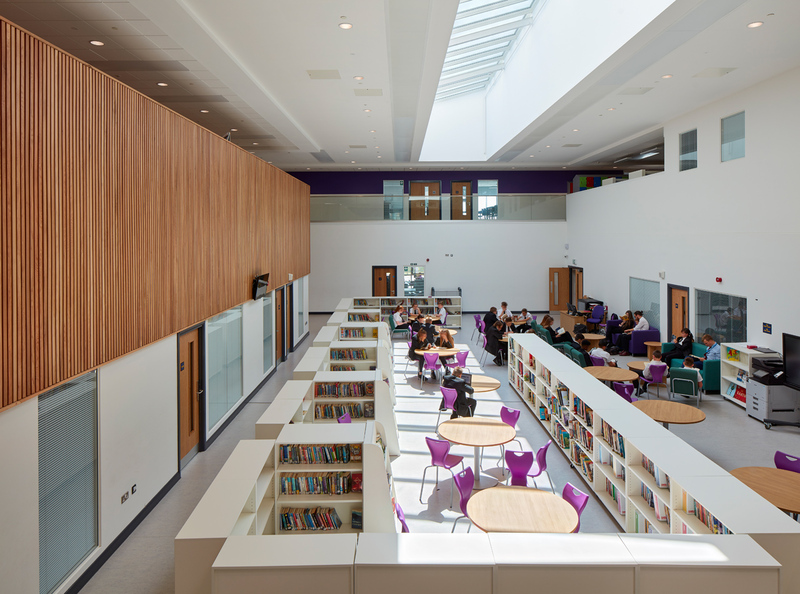 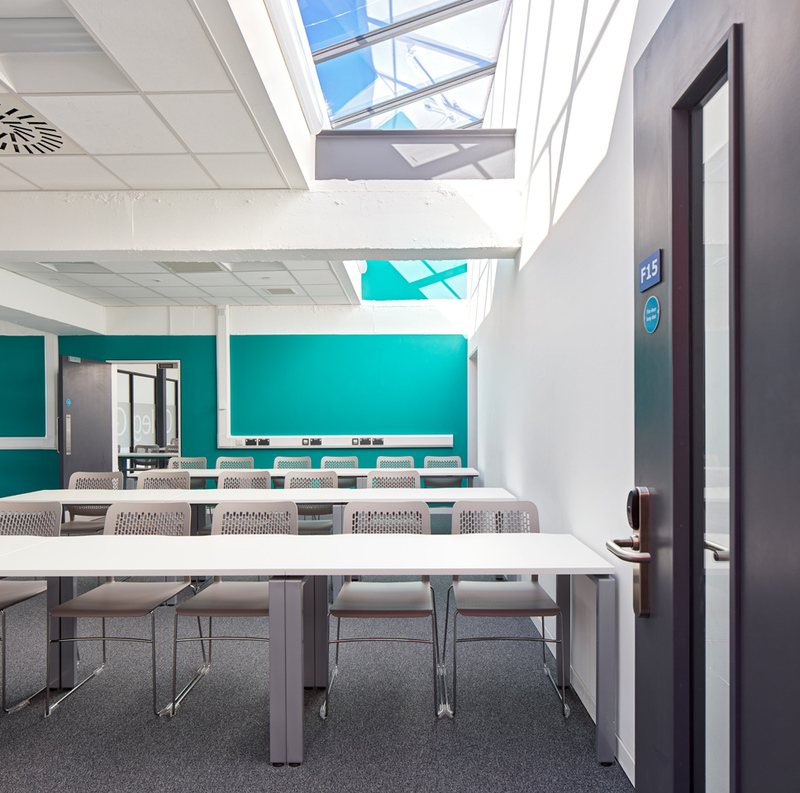 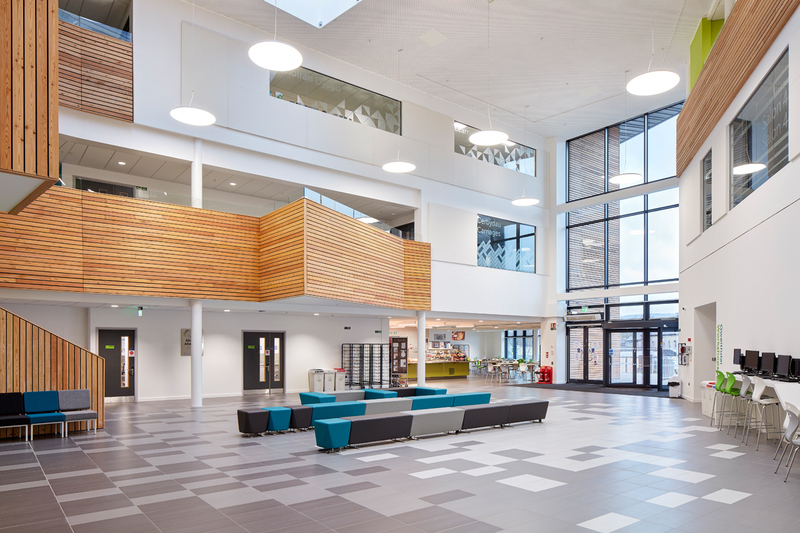 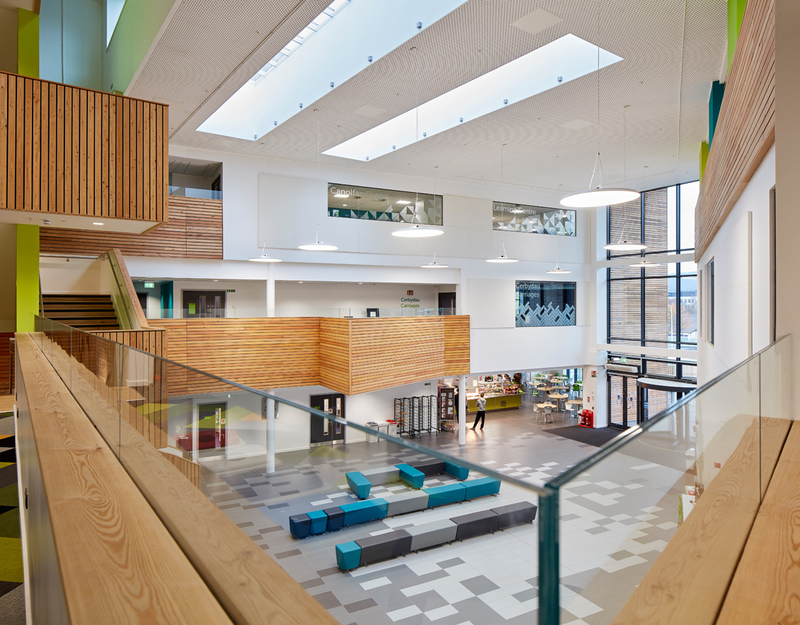 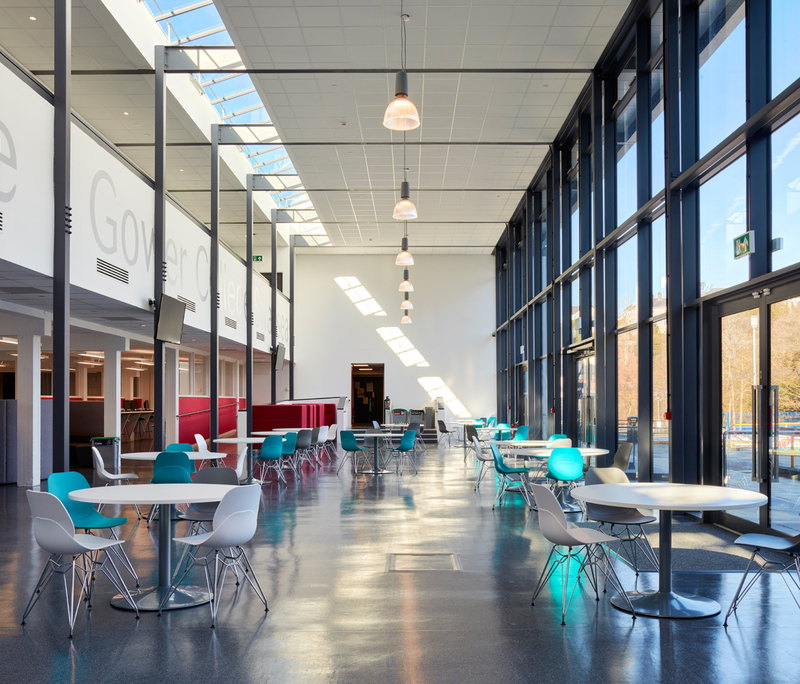 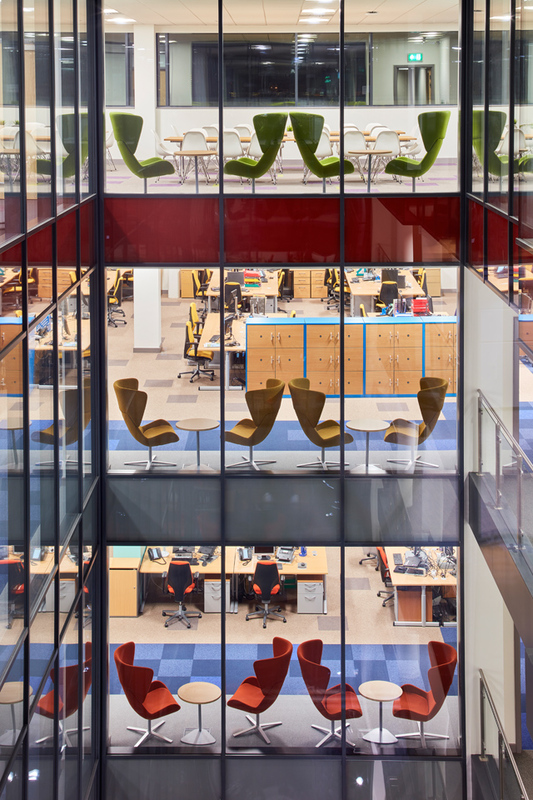 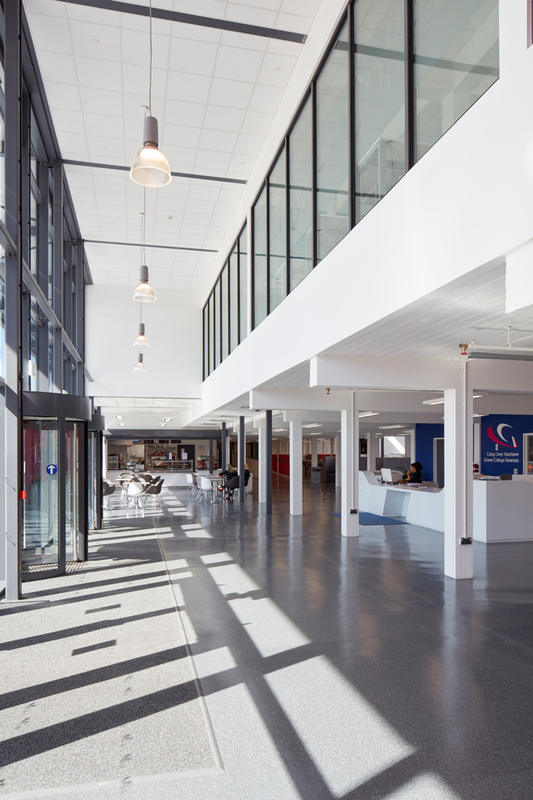 It was a pleasure photographing the great airy spaces in this new higher education college recently completed by Austin Smith Lord which seemed to be equally enjoyed by the students. 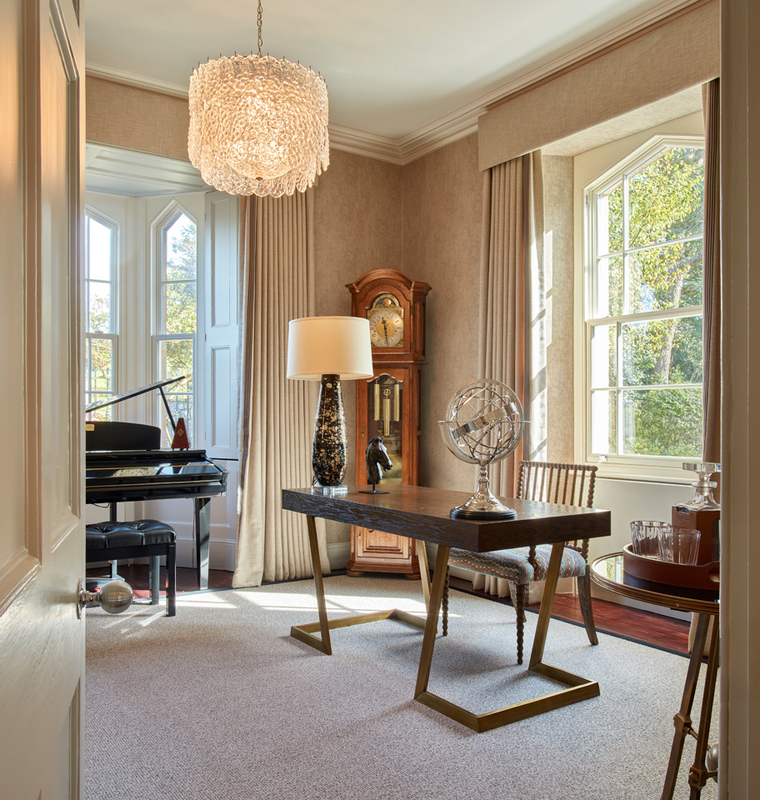 It was good to be working again late last year with the lovely and amazing interior designer Yvonne Jones from Chameleon Interiors on a couple of her recent projects. 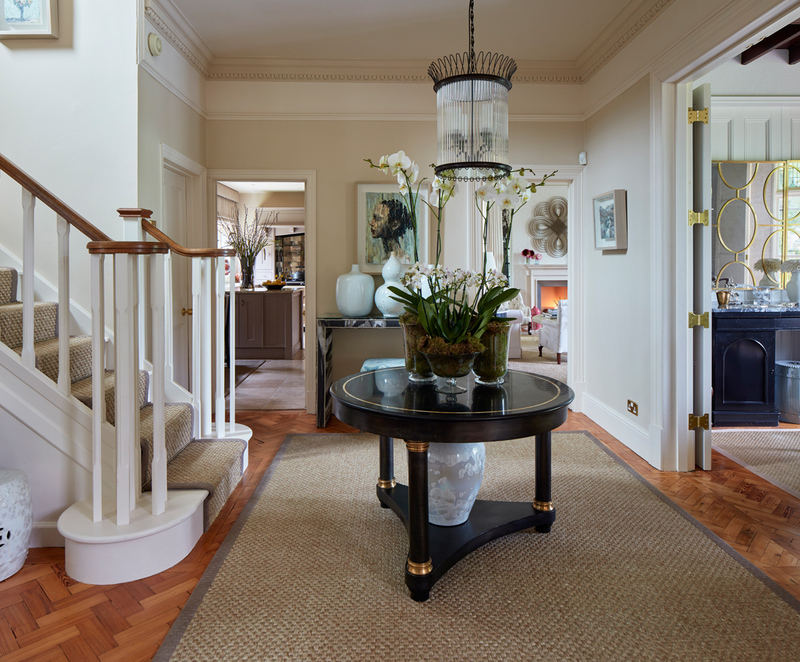 As usual stunning interiors and a delight to photograph. 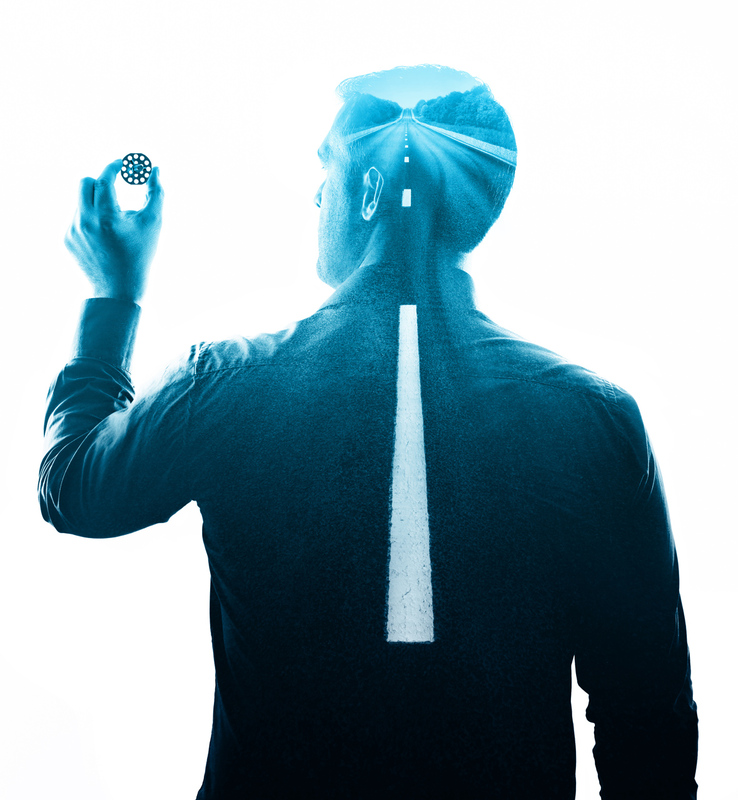 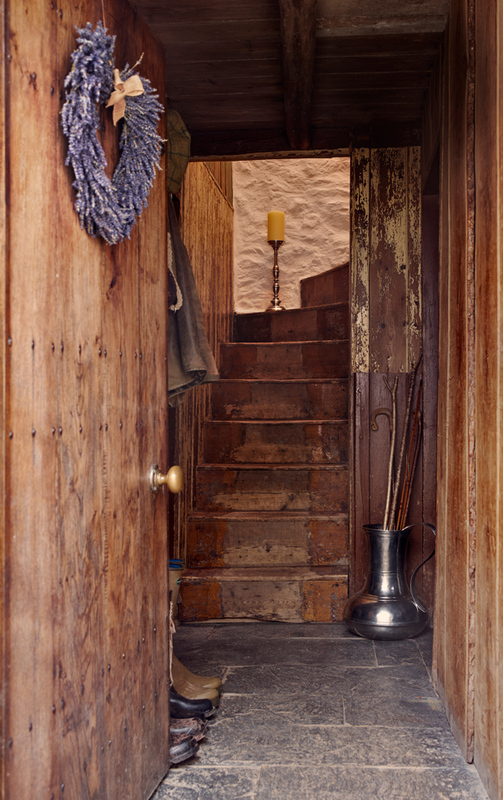 After over 20 years in the business, it’s not often that I’m totally taken aback by a project. 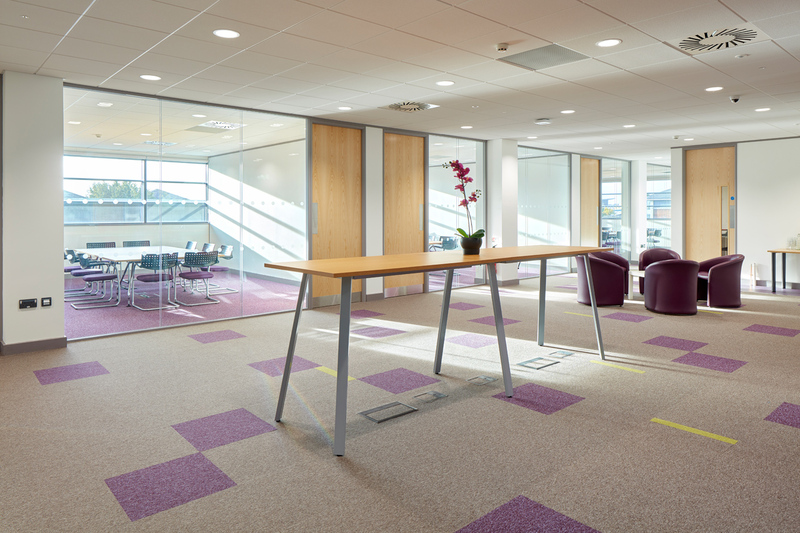 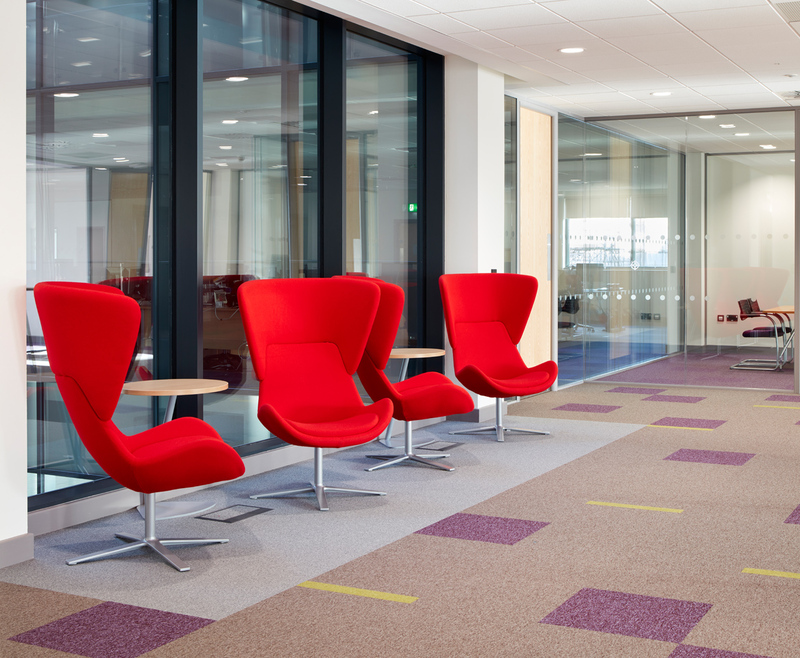 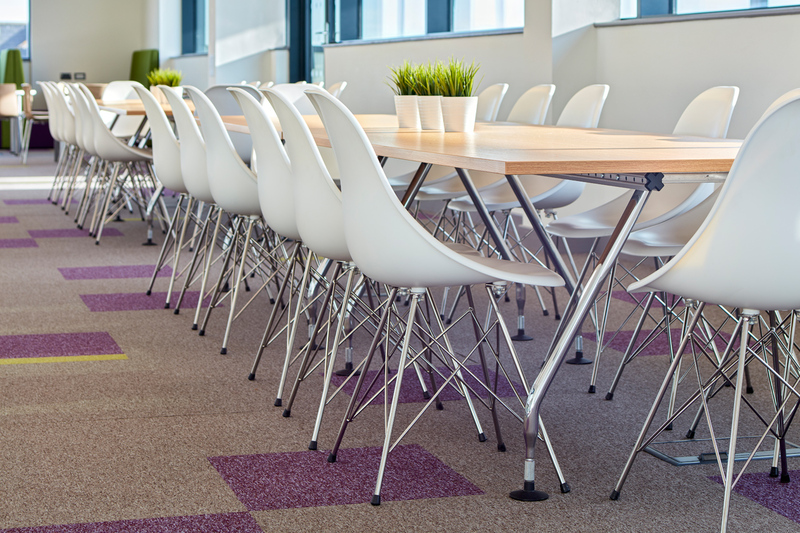 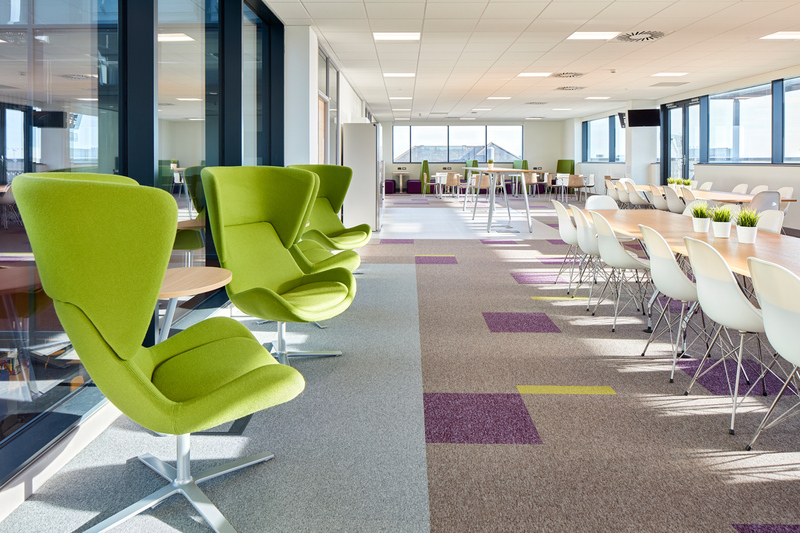 I was contacted late summer by Rype Office regarding an upcoming office fit out they had coming up in Cardiff. 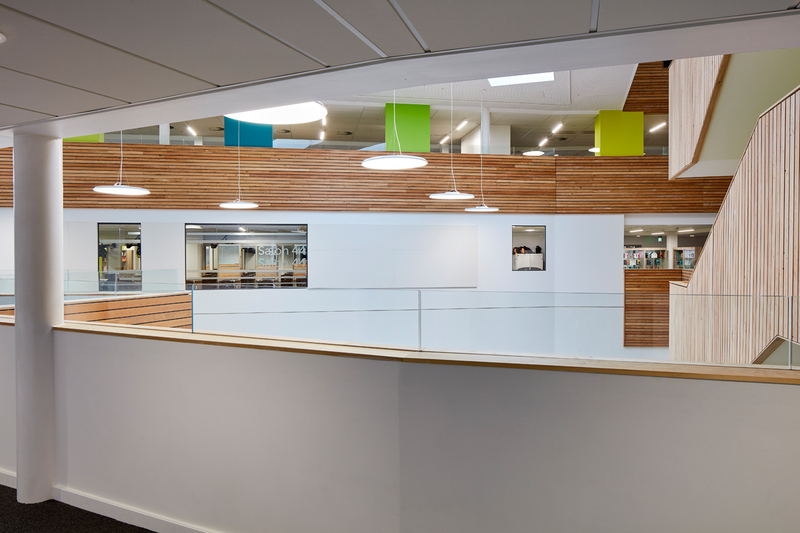 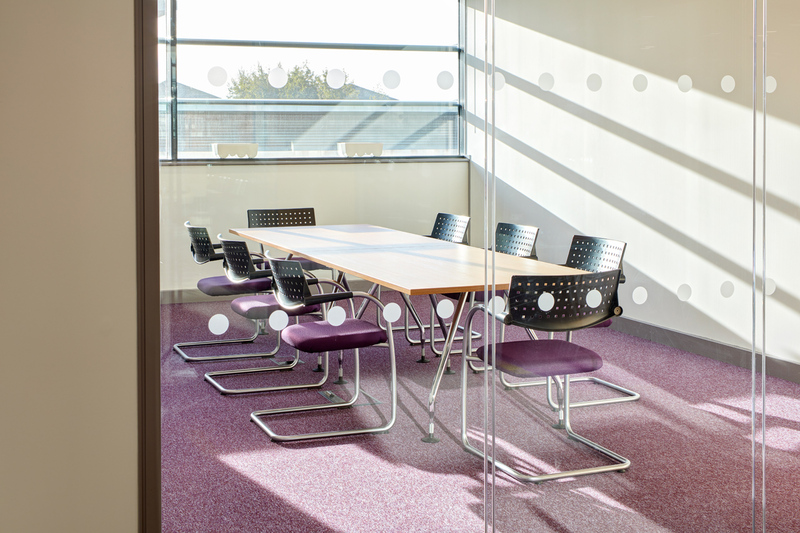 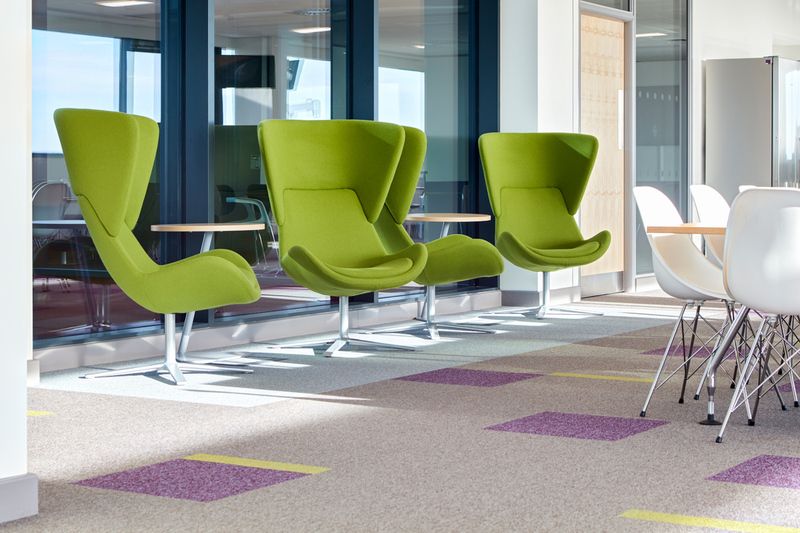 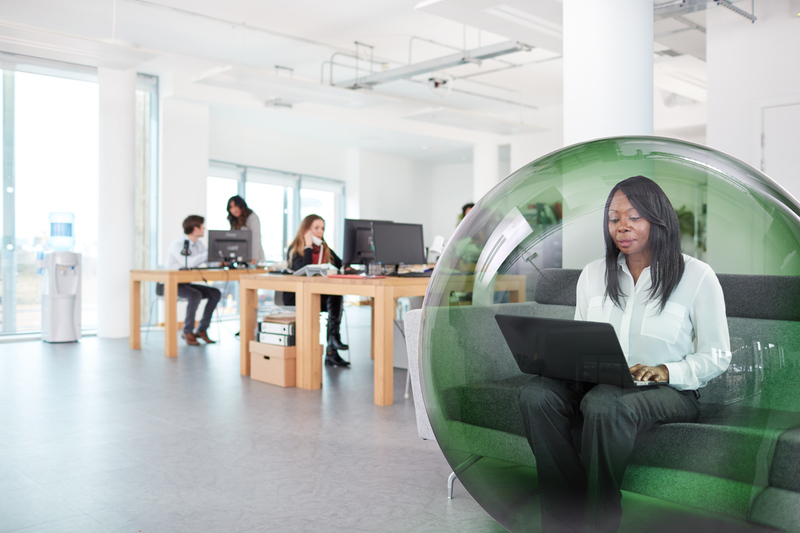 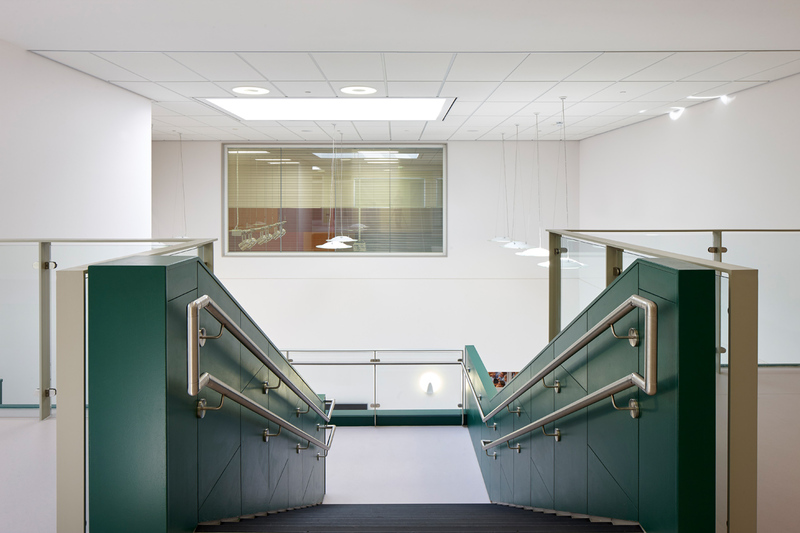 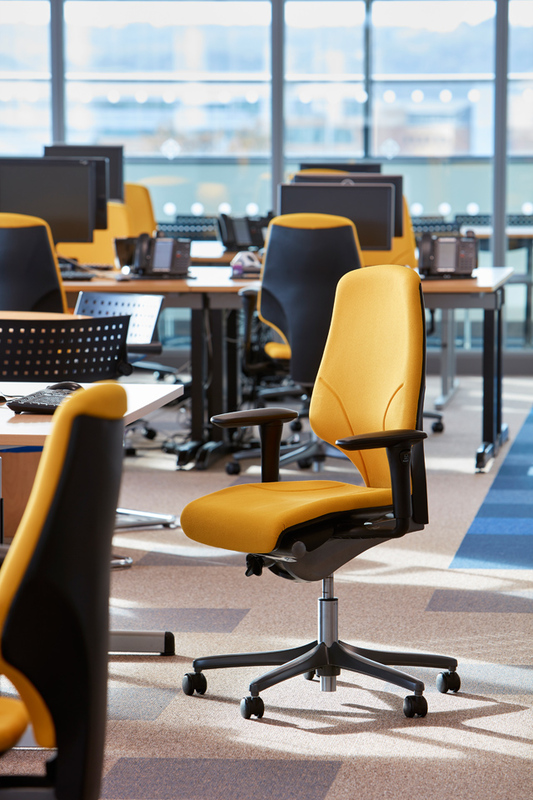 What was different here is that Rype Office take used furniture and refurbish and remanufacture it to enable an attractive, sustainable office fit out. 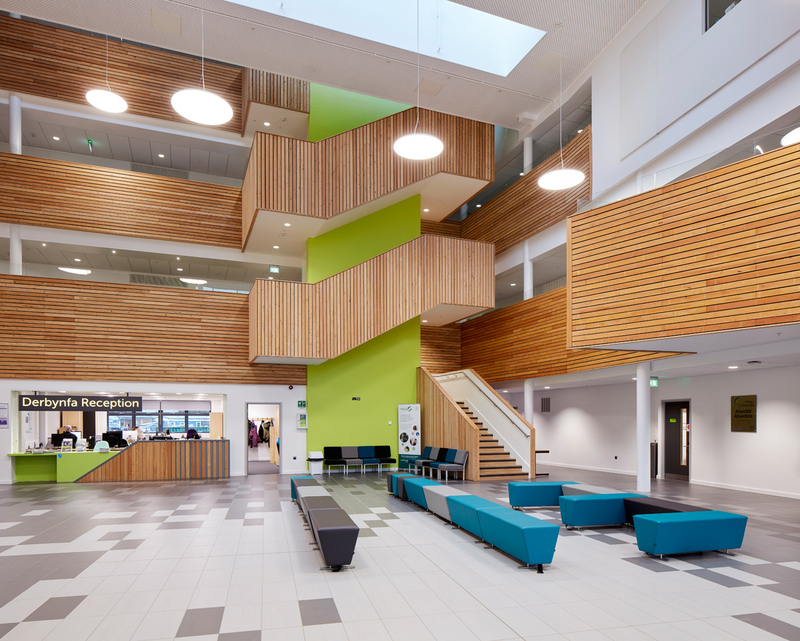 The finished scheme was way above my expectations and a reminder as to what can be done with a bit of imagination and by exploring sustainable alternatives. 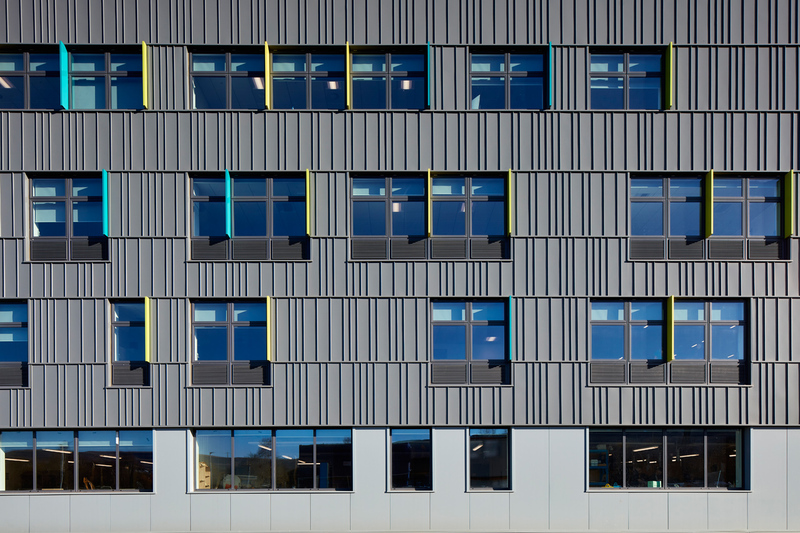 Another architectural highlight photographed in early autumn for Purcell UK. 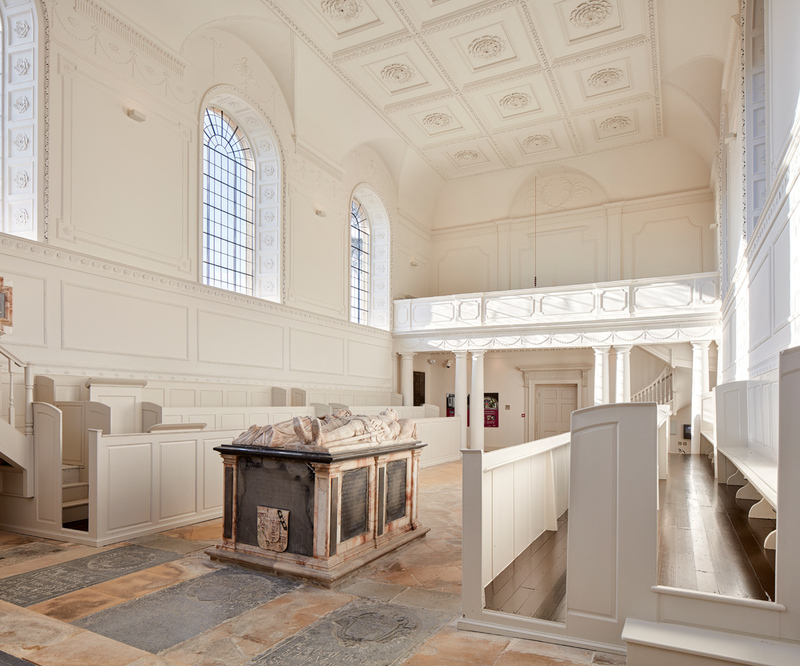 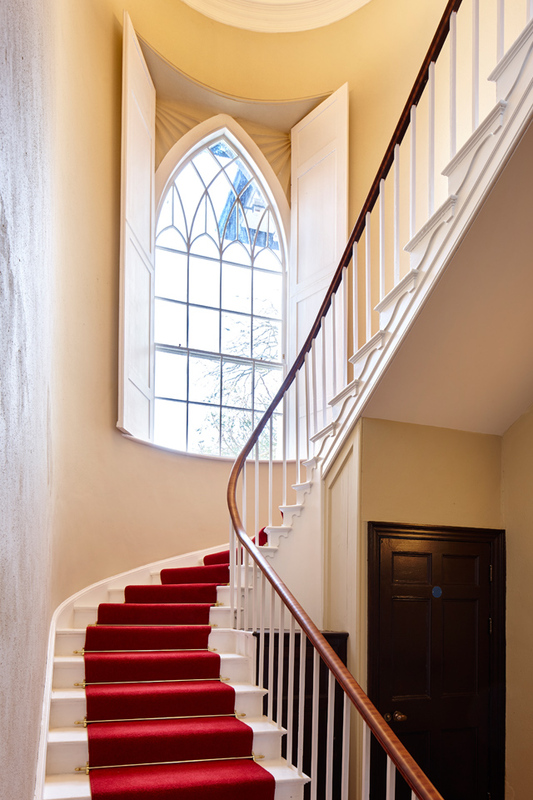 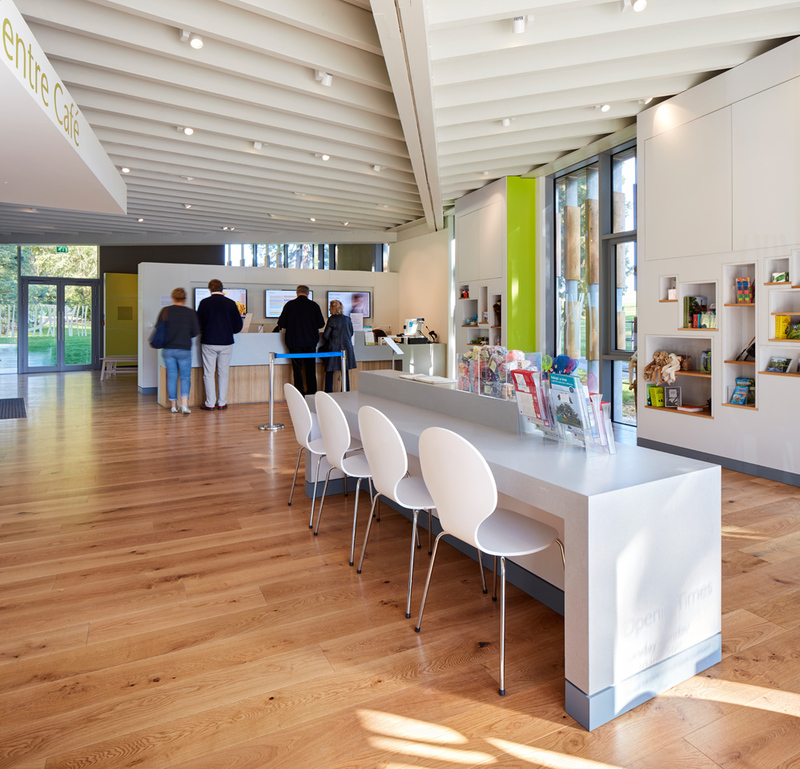 Here there was a combination of a new visitor centre and conservation and restoration work of the chapel. 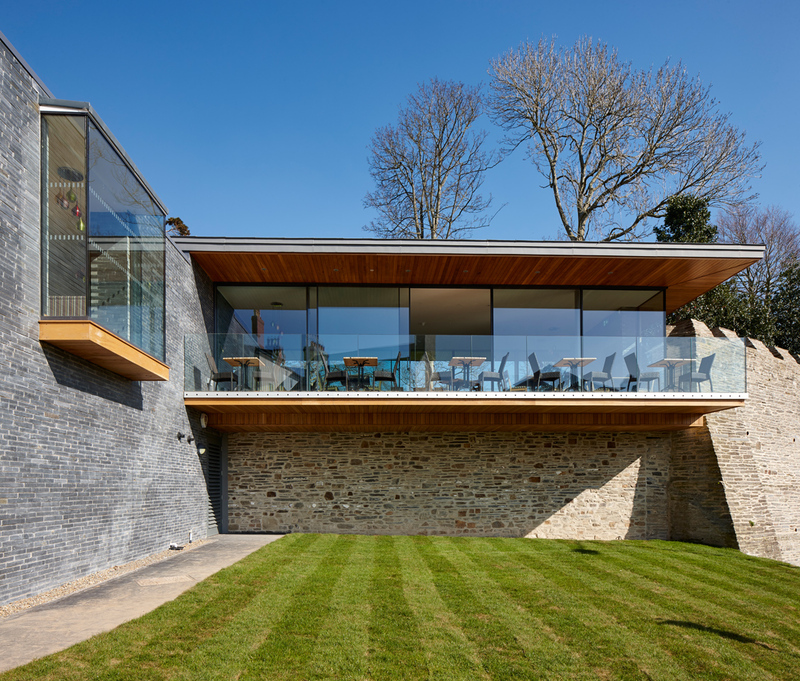 It’s been a busy year for architectural photography with an interesting range of projects that I’ve visited for a number of great architecture practices. 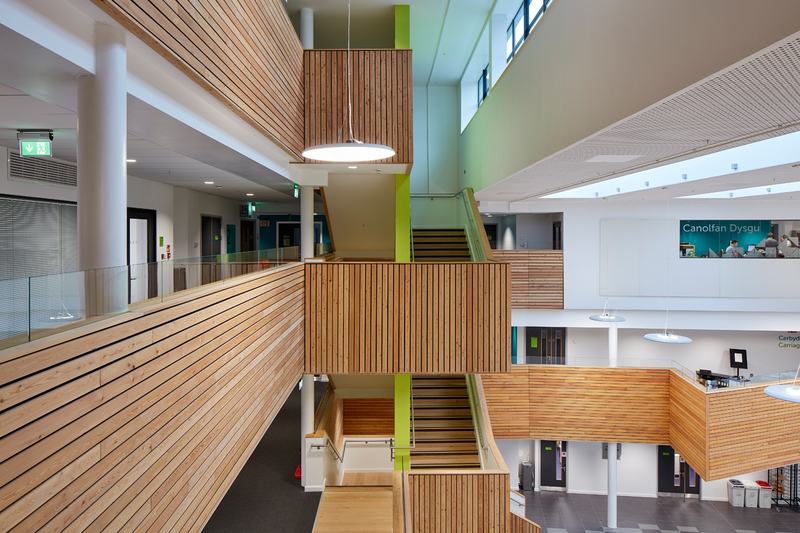 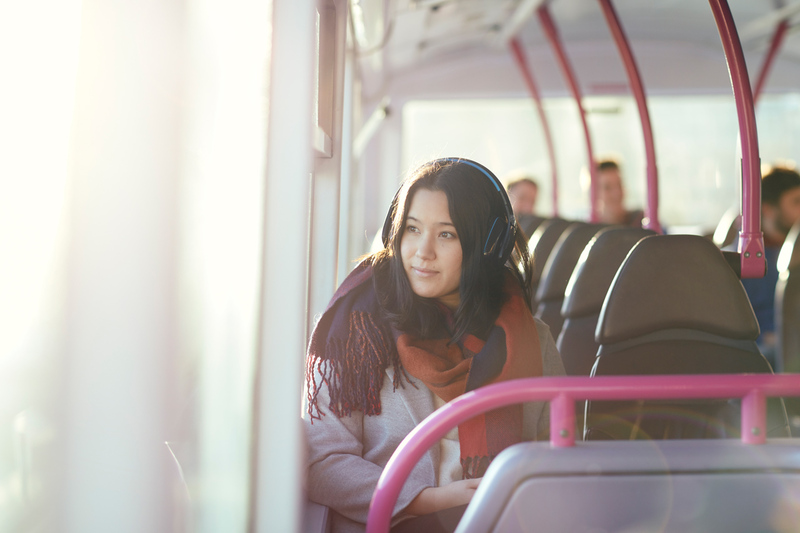 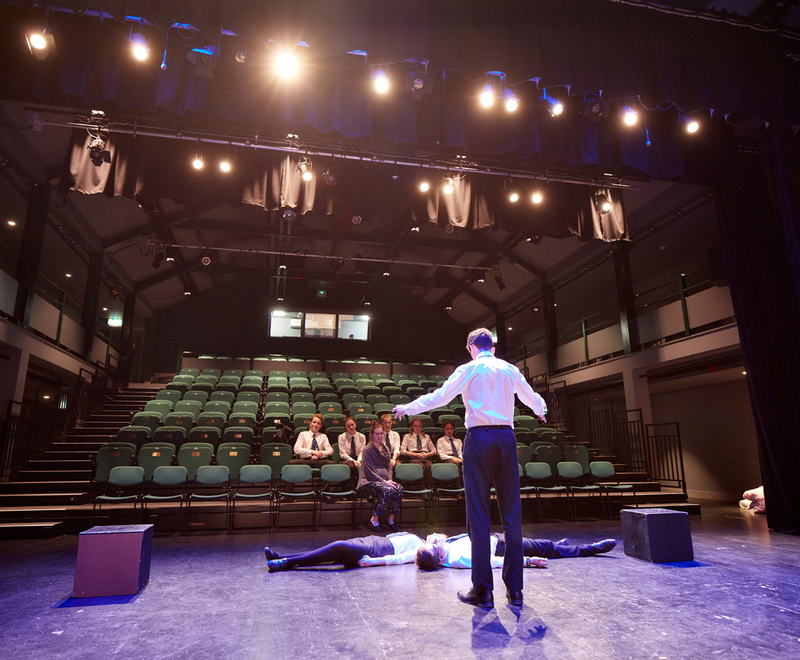 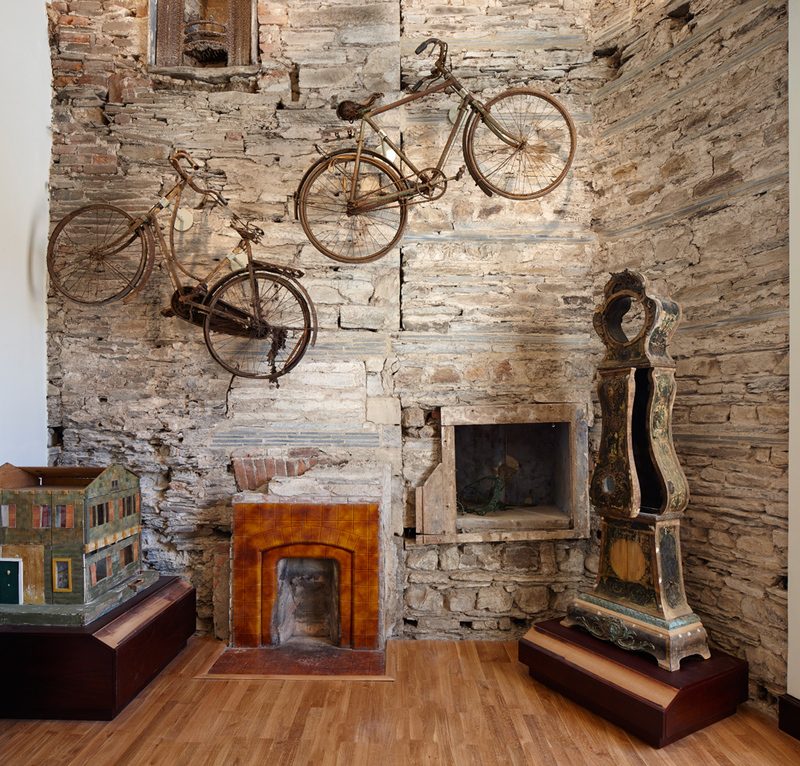 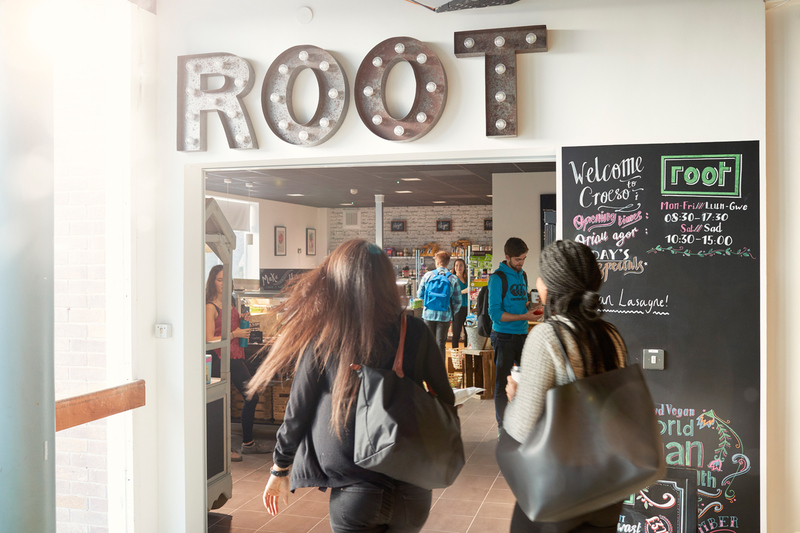 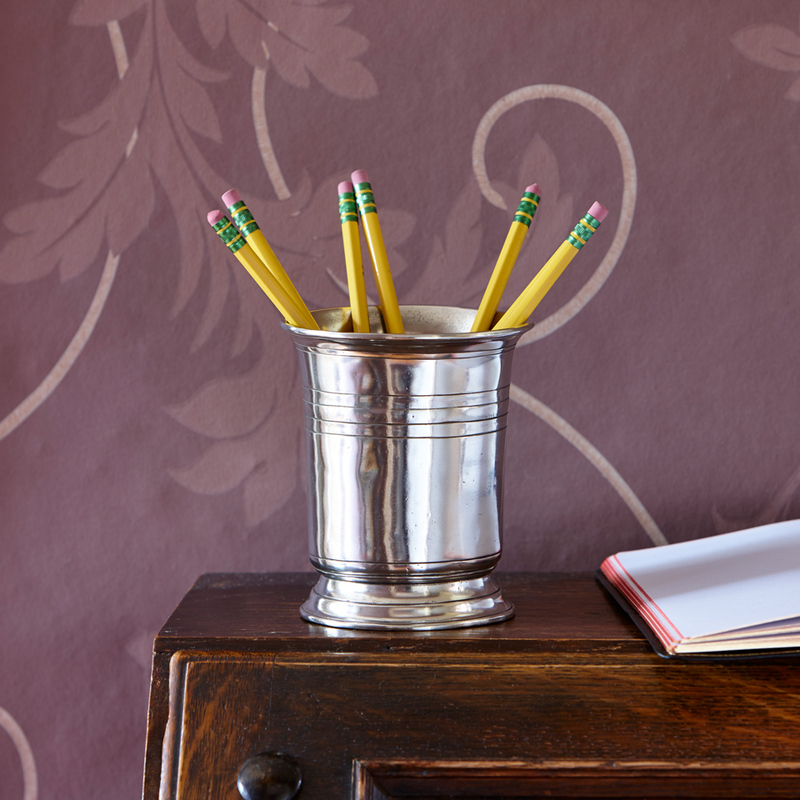 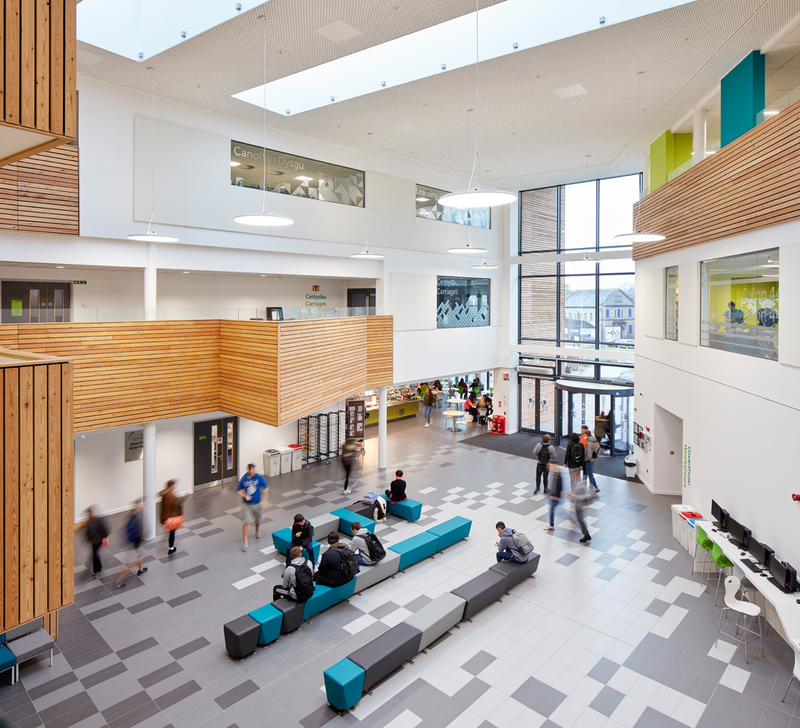 This shoot made an impression with the vibrant atmosphere in the new school of particular note. 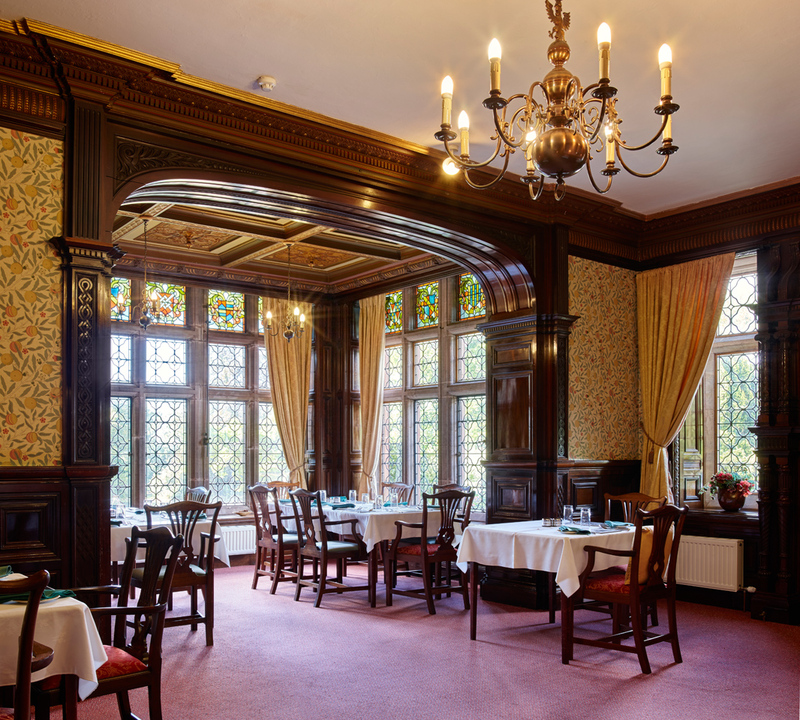 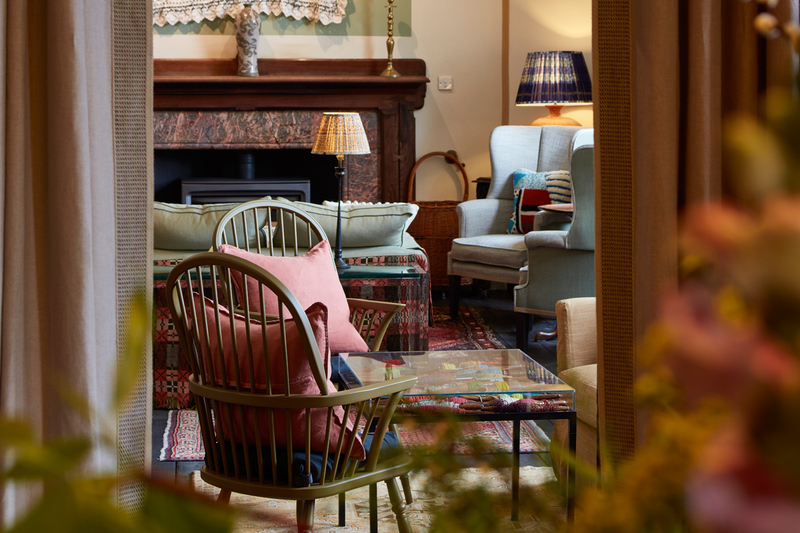 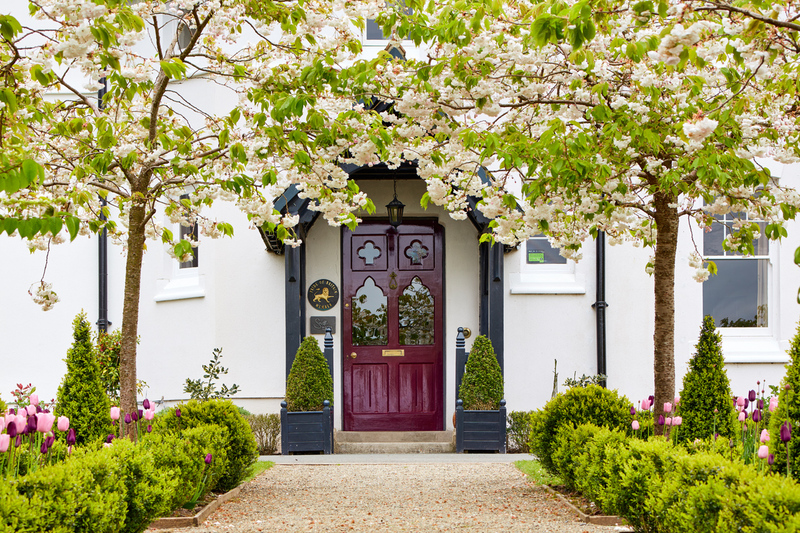 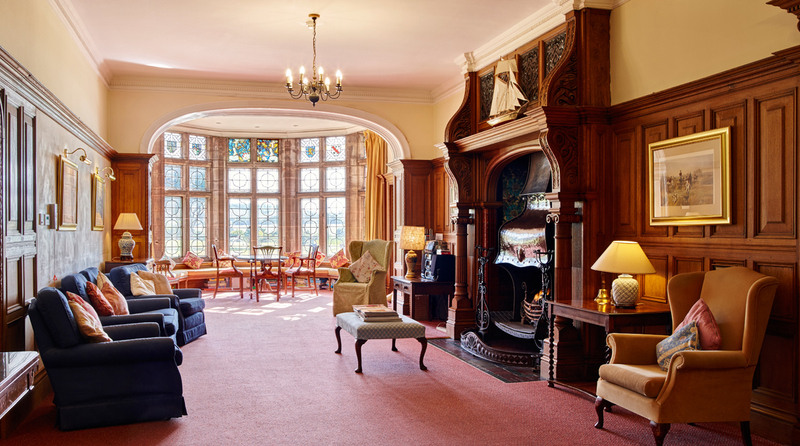 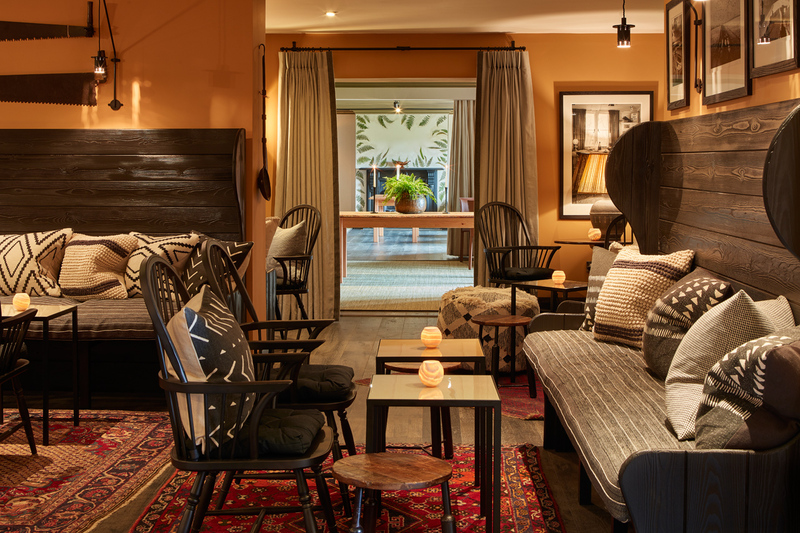 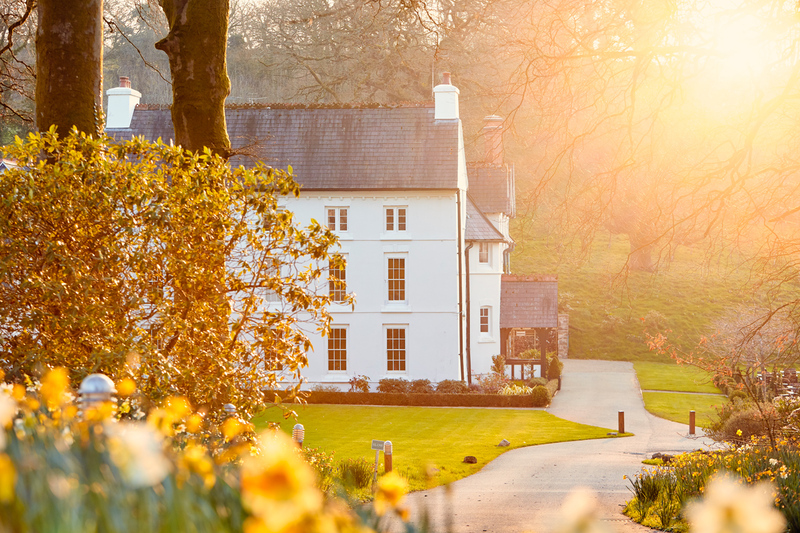 Over the summer, I’ve paid a few further visits to this amazing gem of a hotel located in beautiful countryside near Narberth in Pembrokeshire. 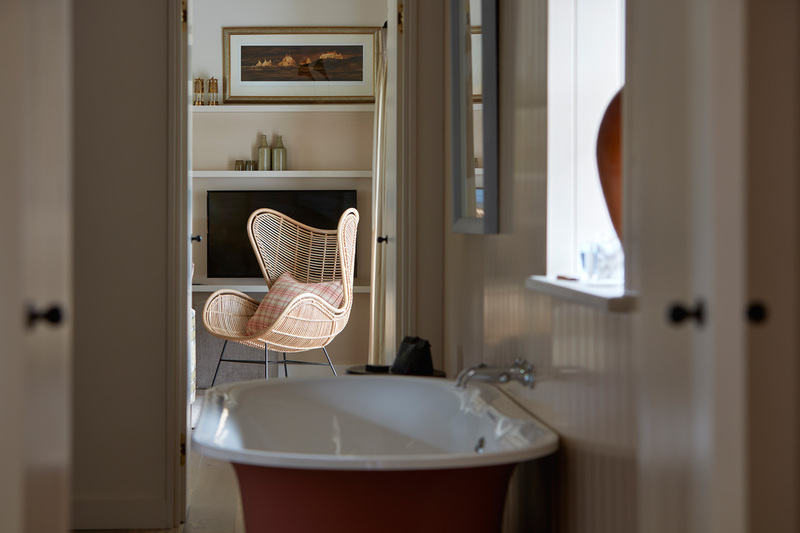 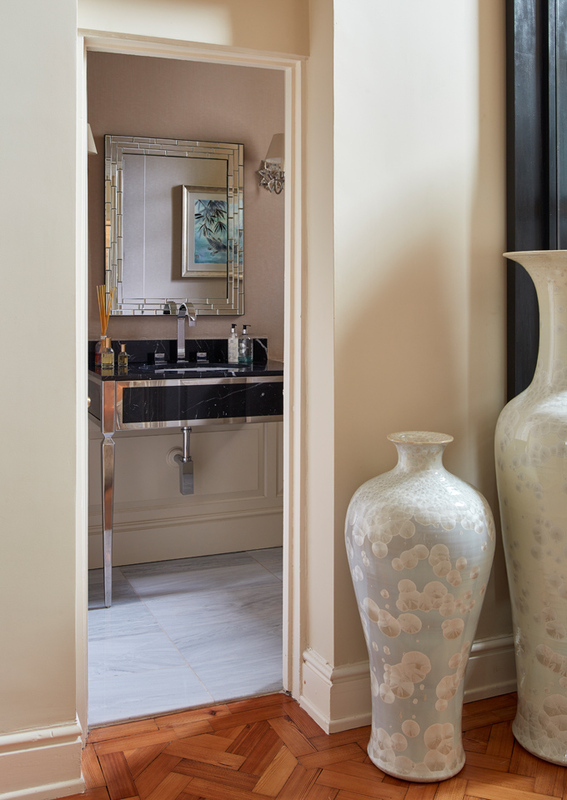 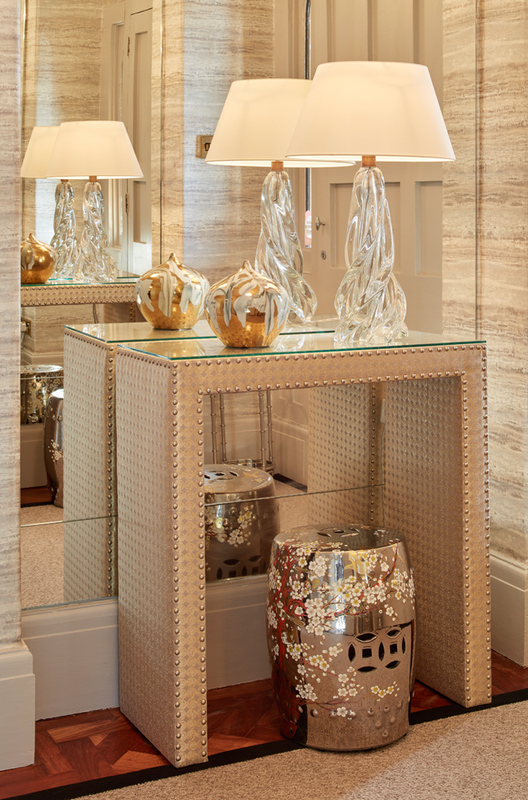 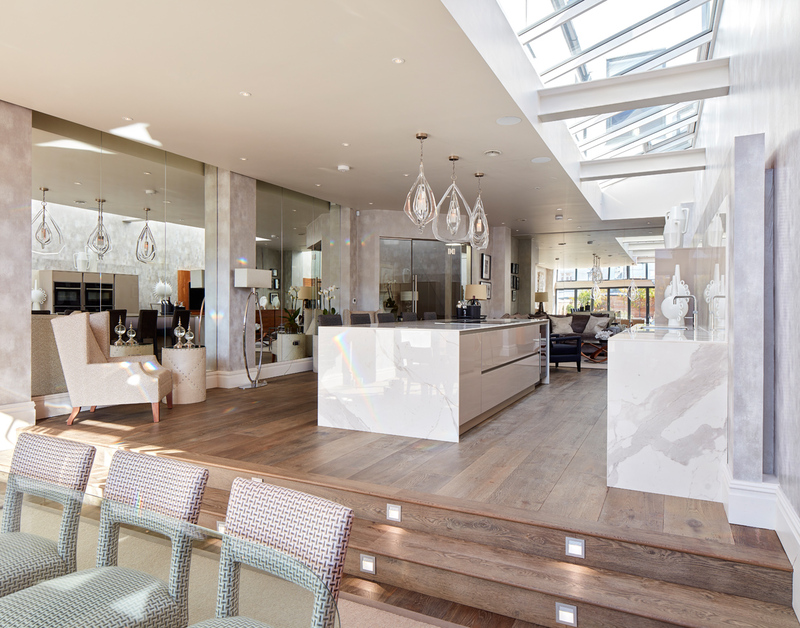 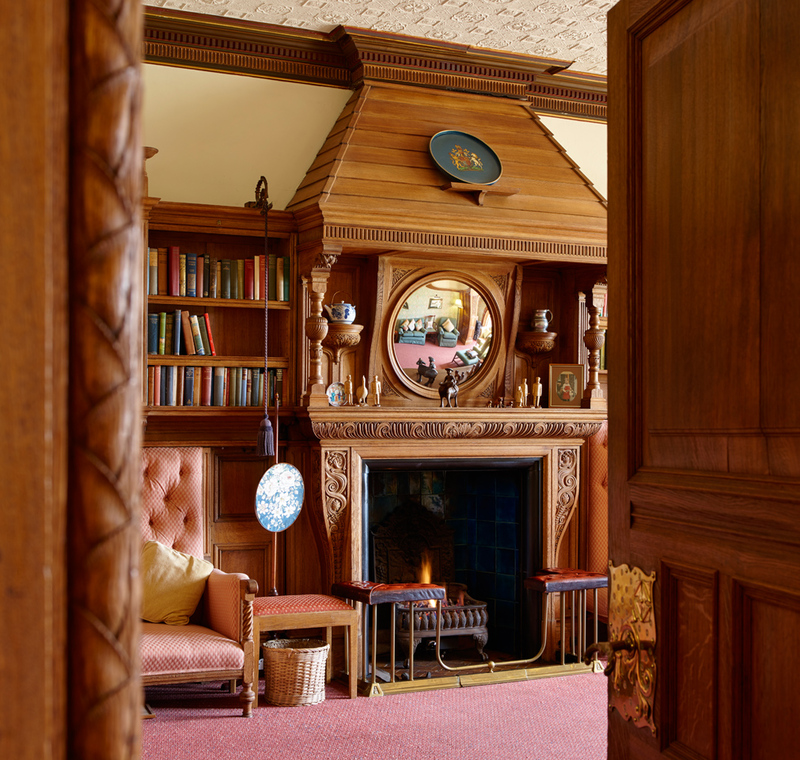 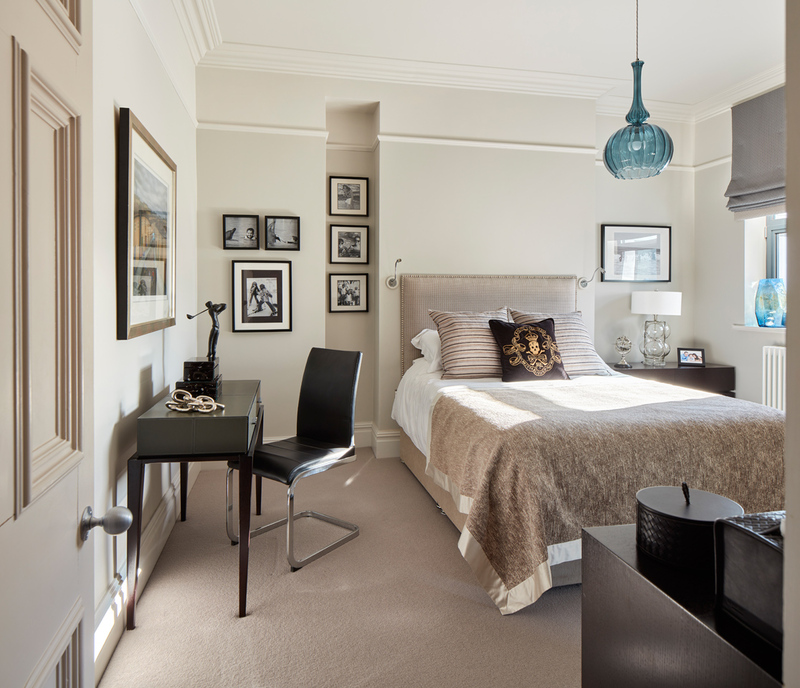 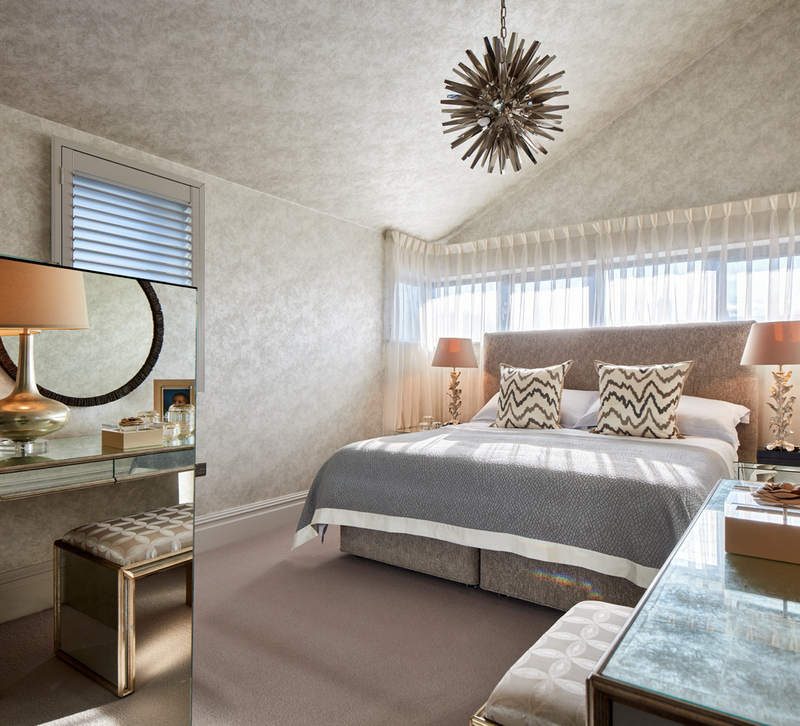 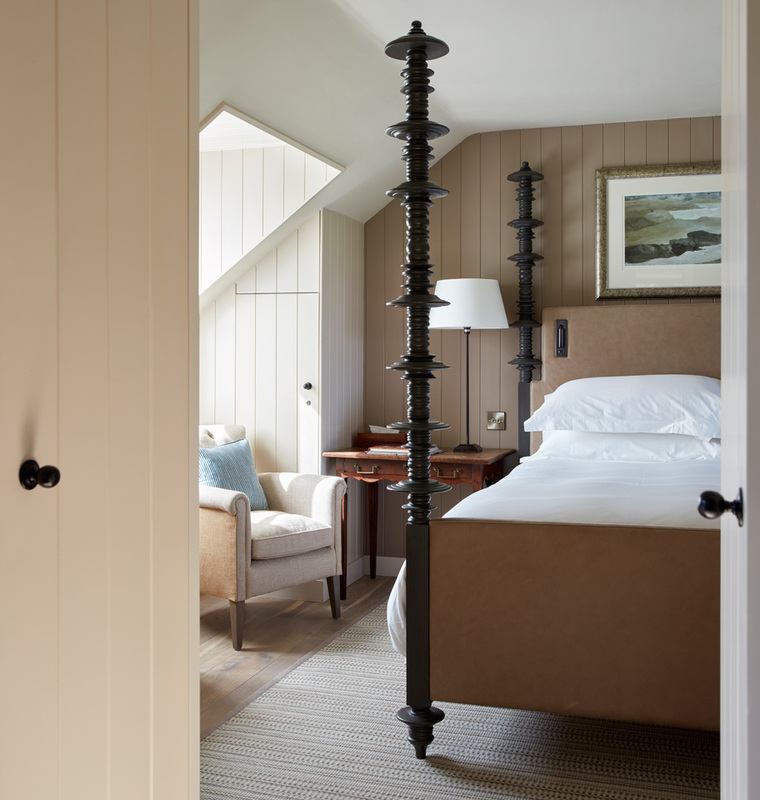 These visits were primarily to photograph the new luxury suites designed by renowned interior designer Martin Hulbert. 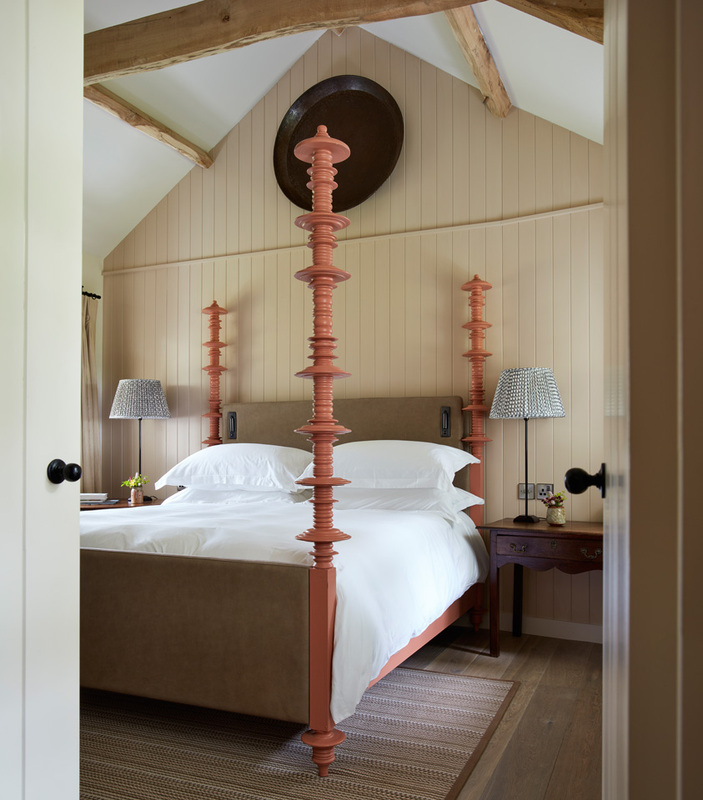 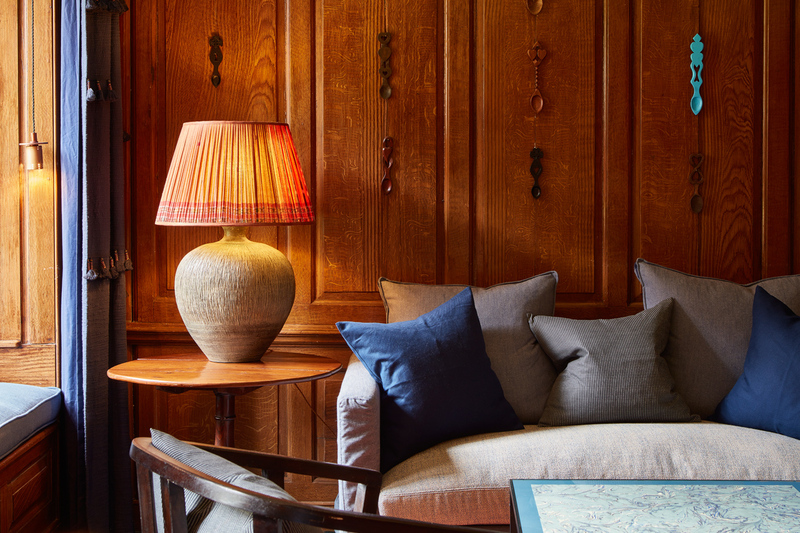 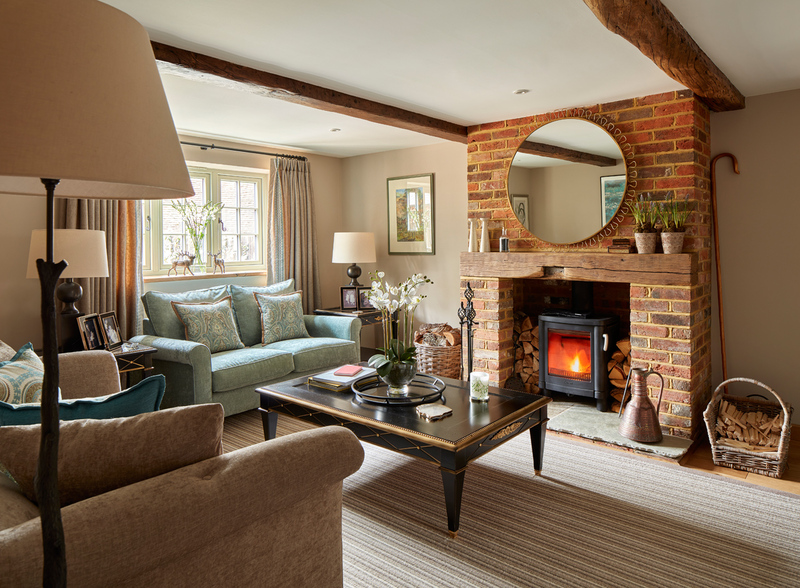 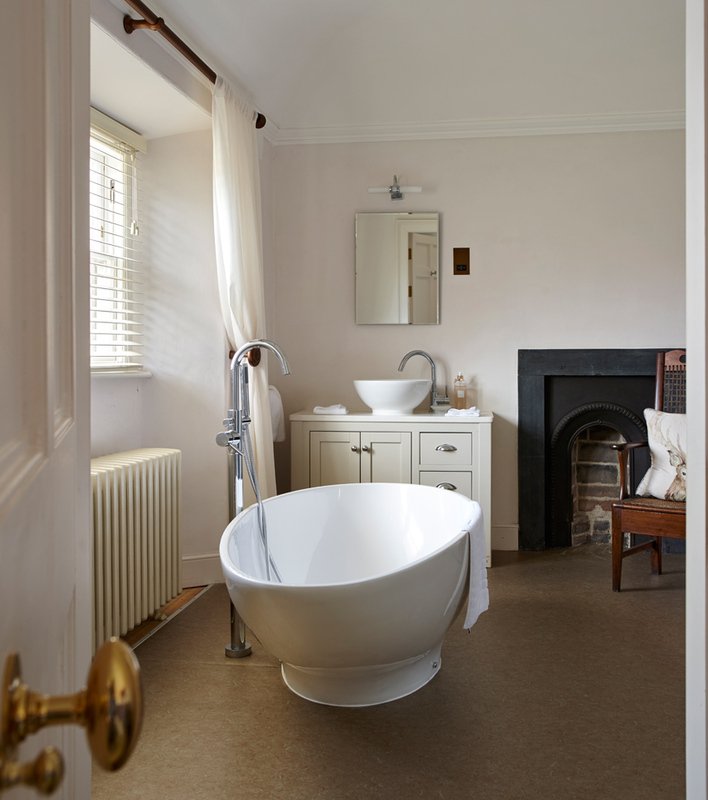 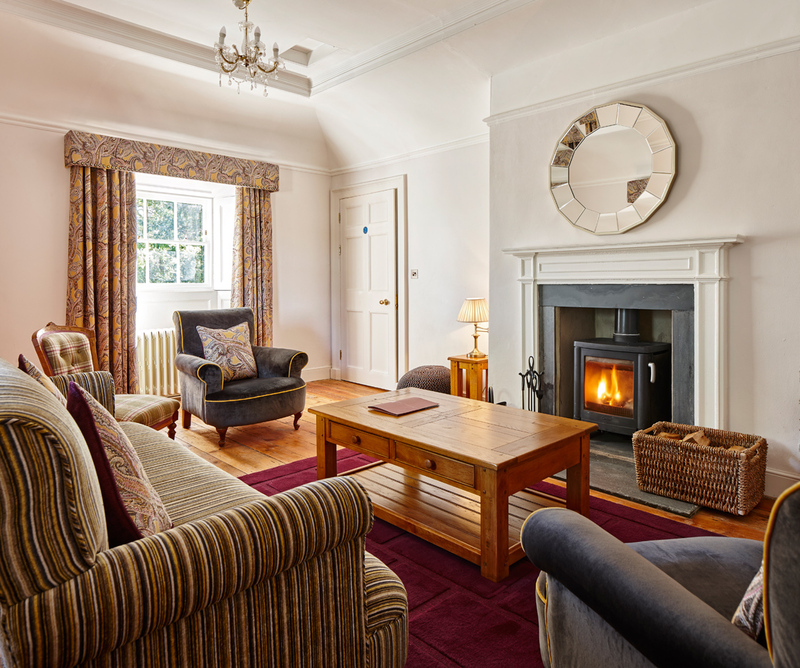 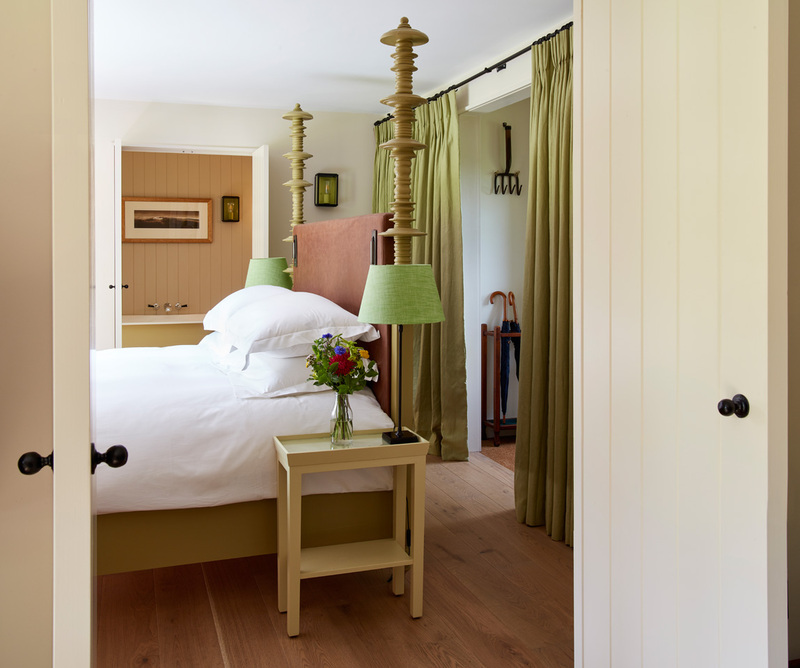 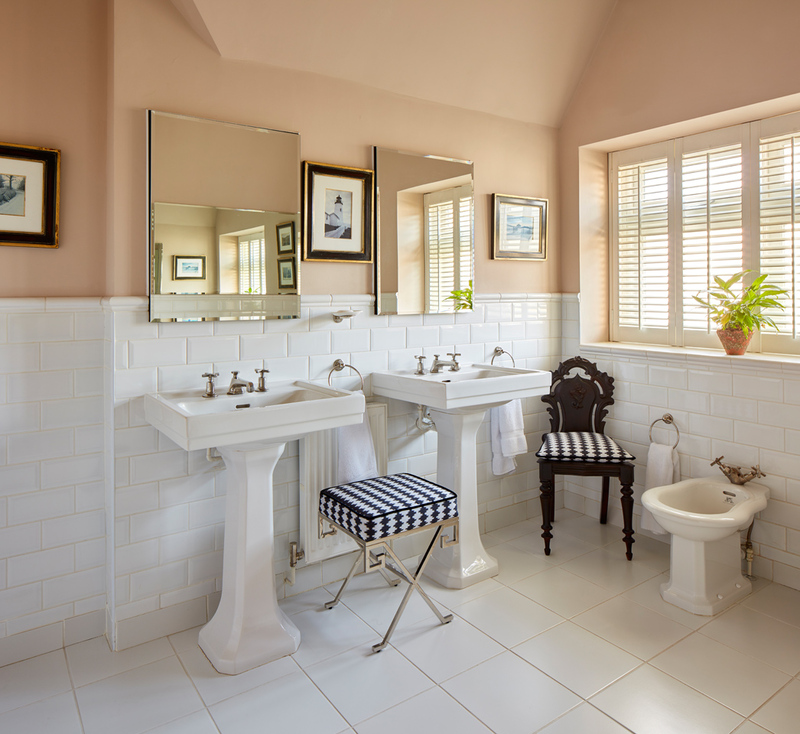 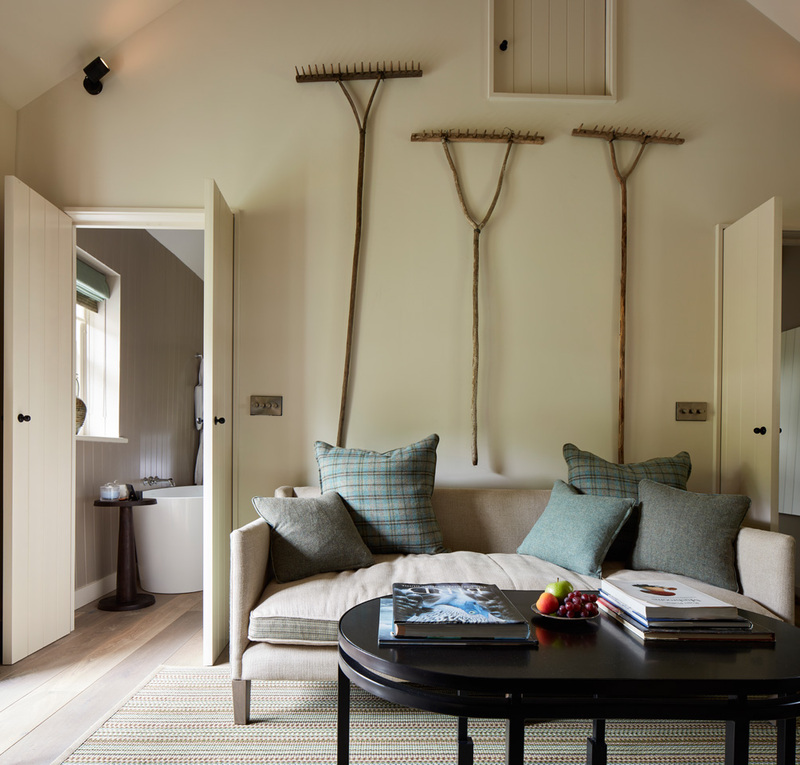 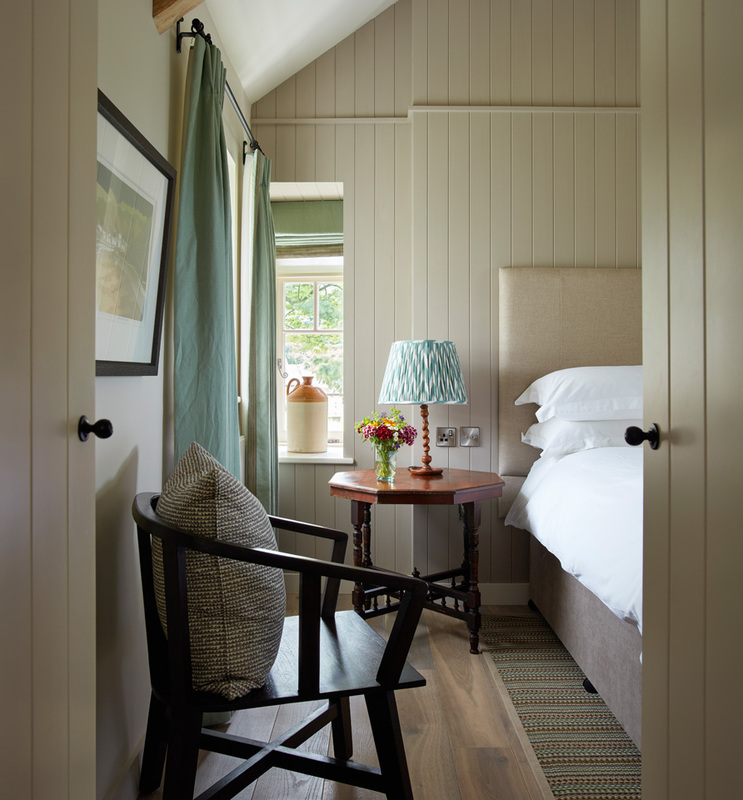 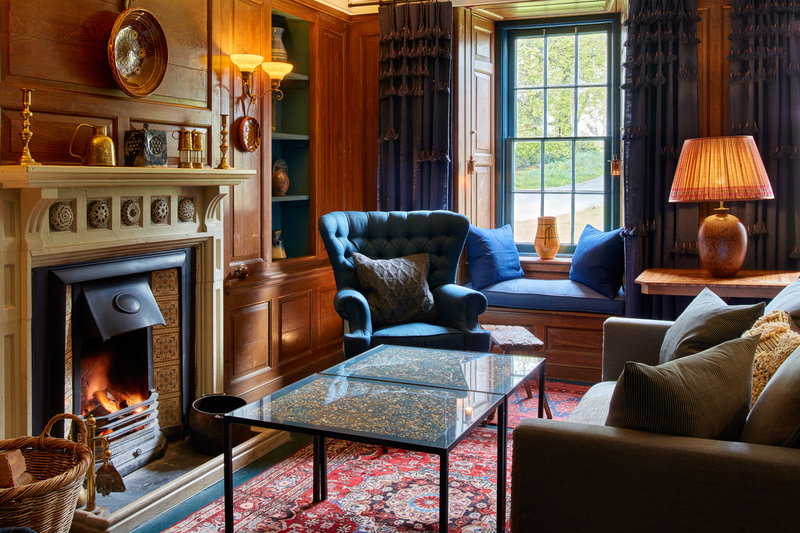 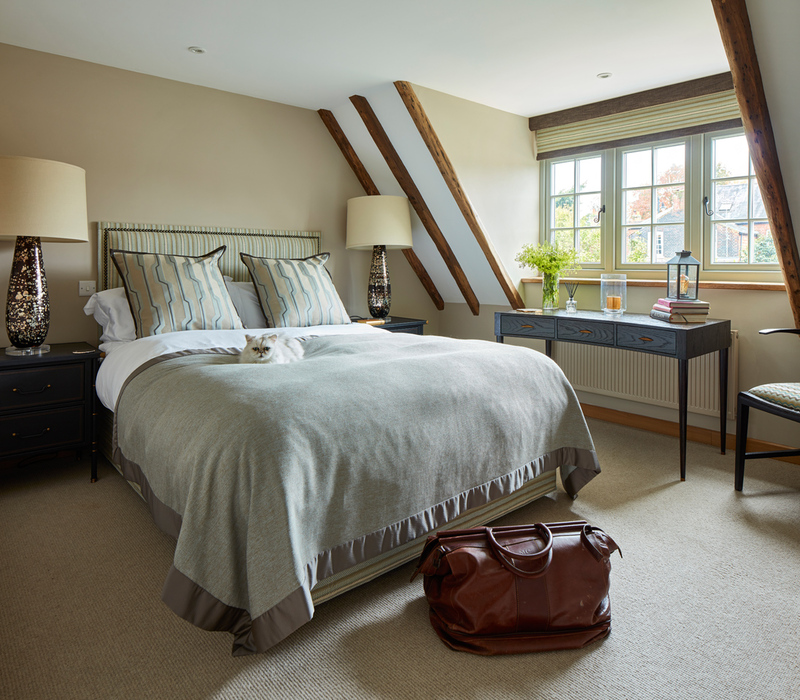 It was a pleasure to work with Martin and Jay from Martin Hulbert Design to photograph these beautifully detailed rooms which promise a true 5 star country hotel experience. 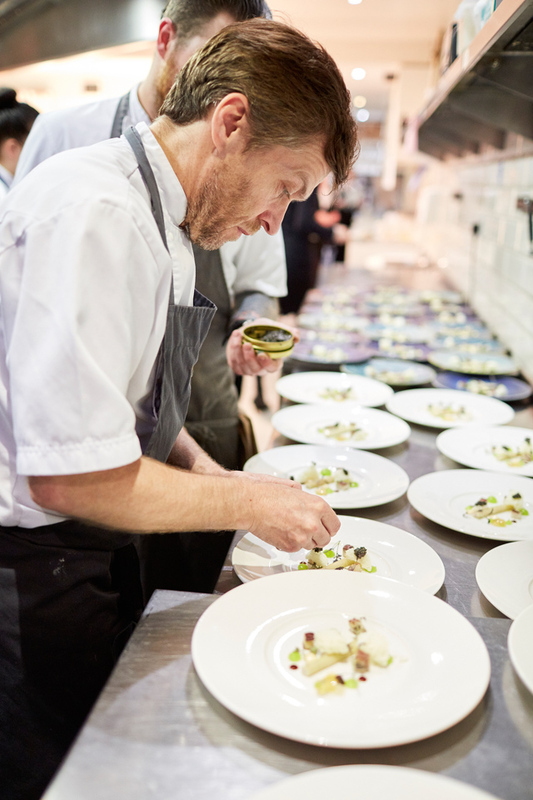 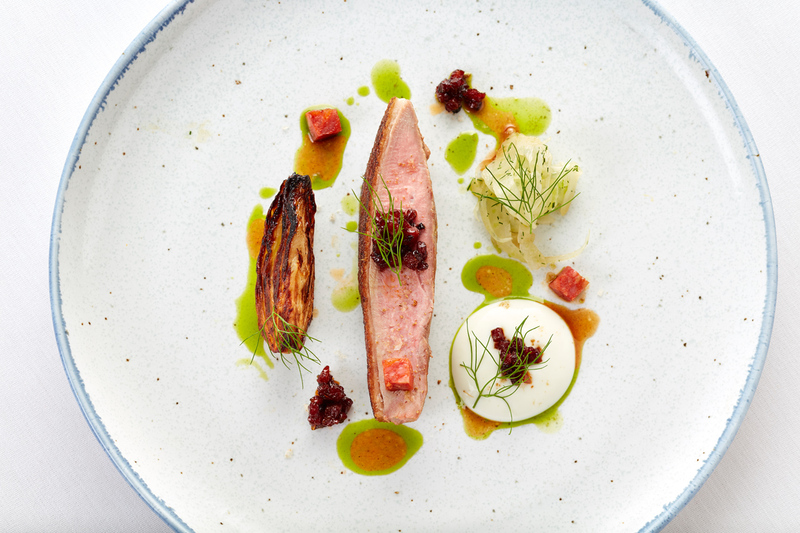 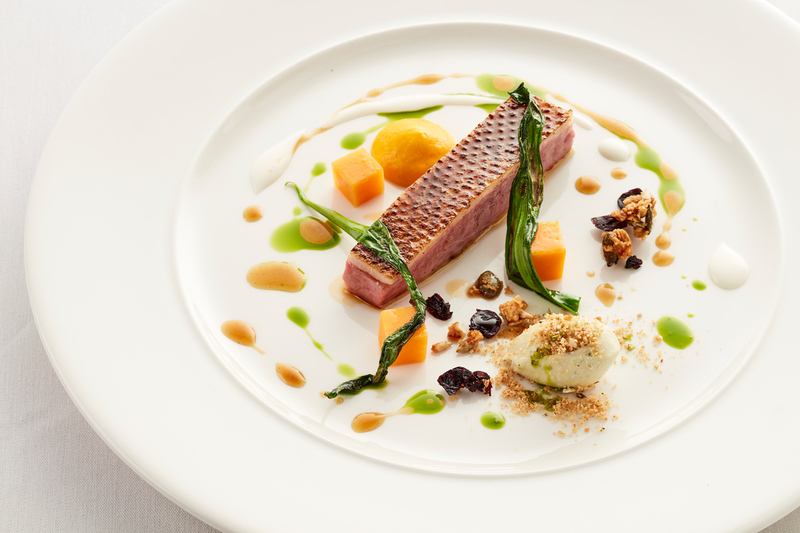 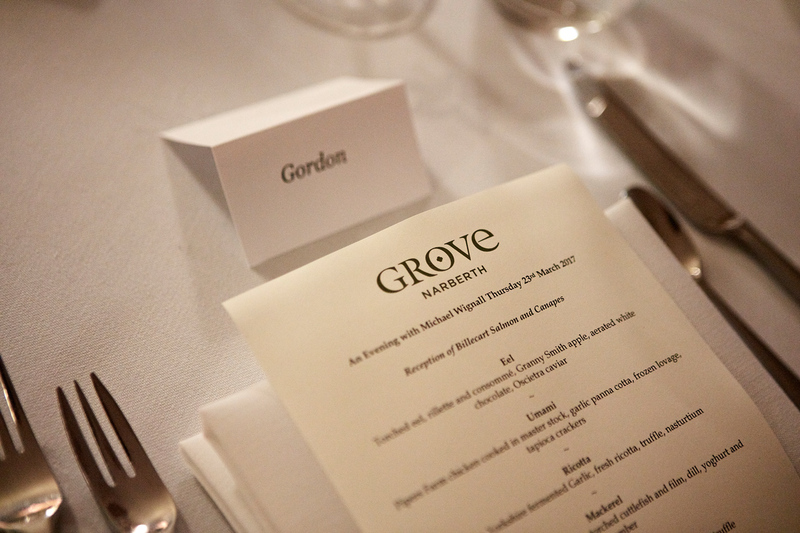 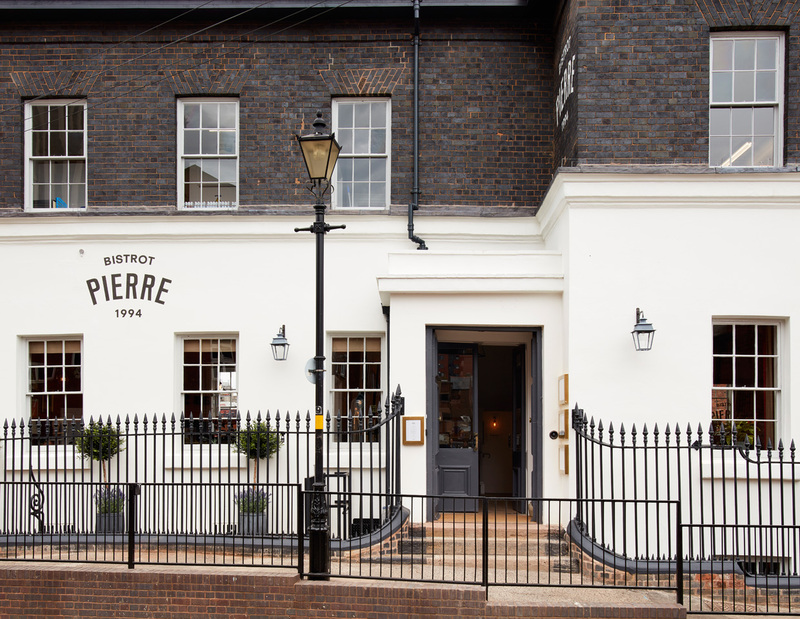 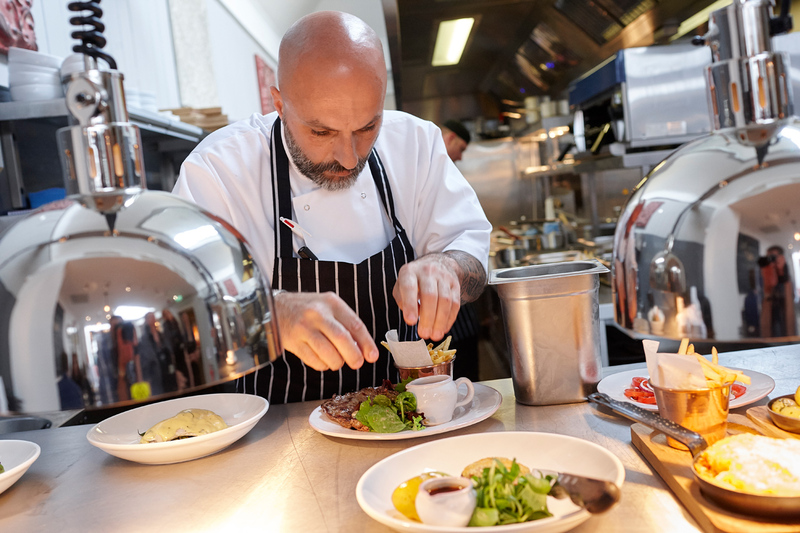 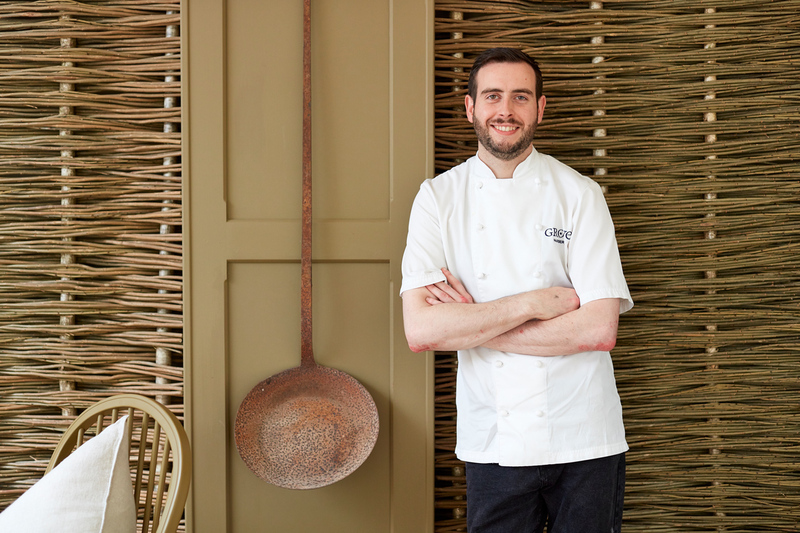 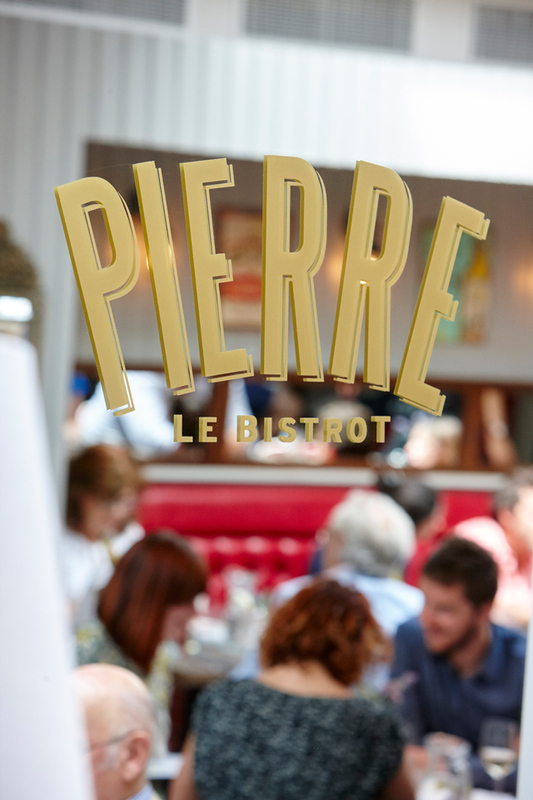 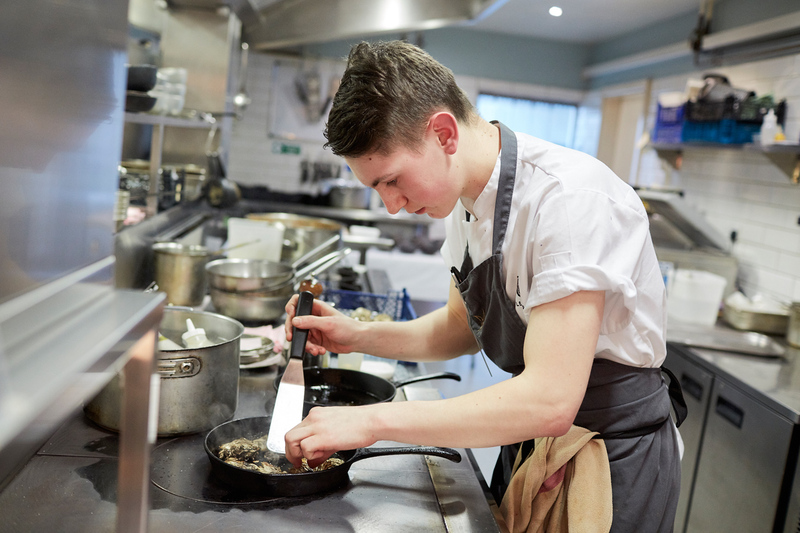 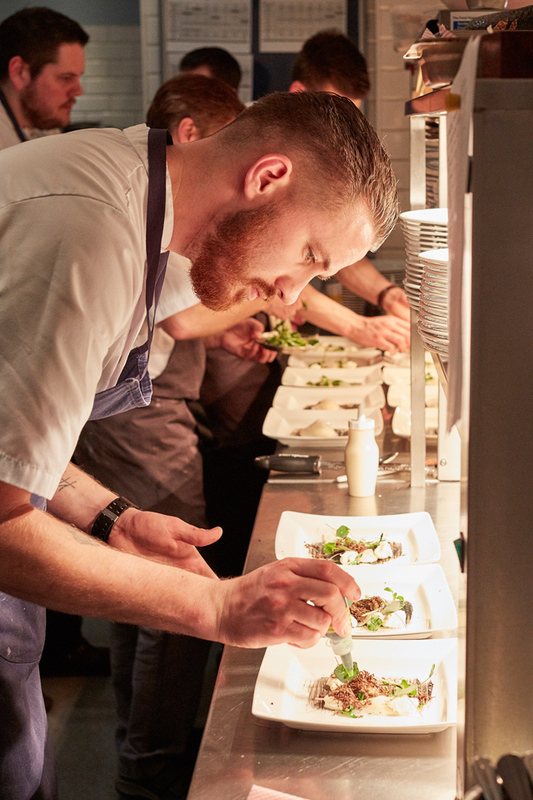 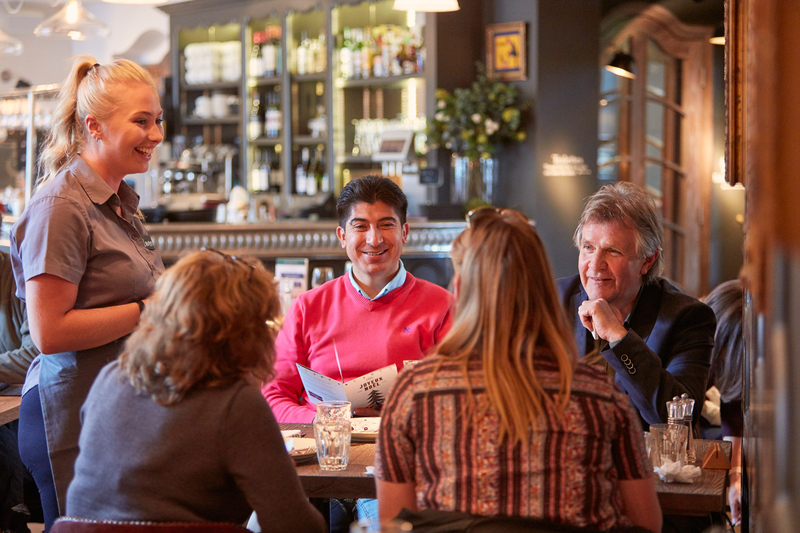 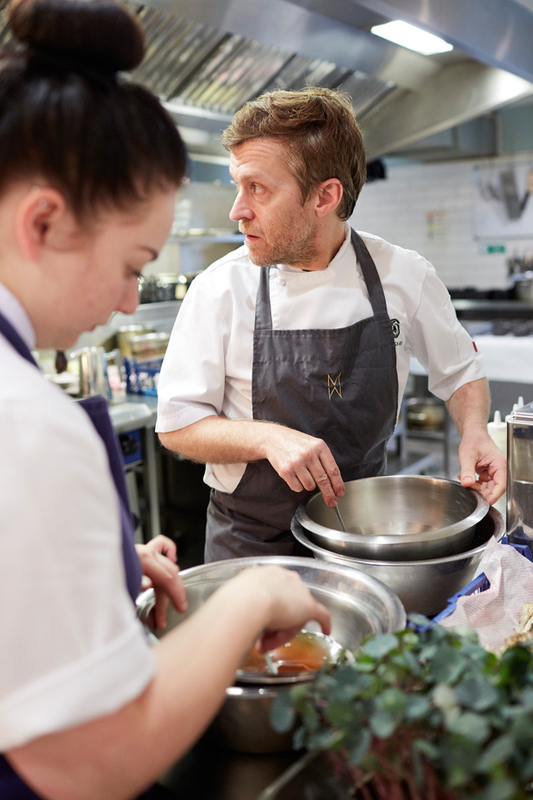 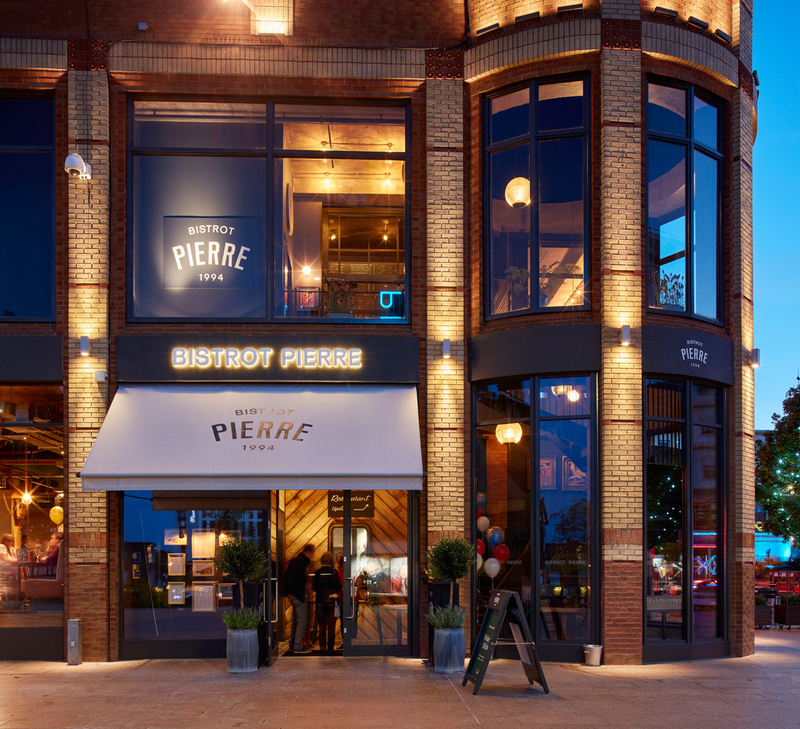 It was good to be involved in the launch of Bistrot Pierre’s latest restaurant in Birmingham earlier this year. 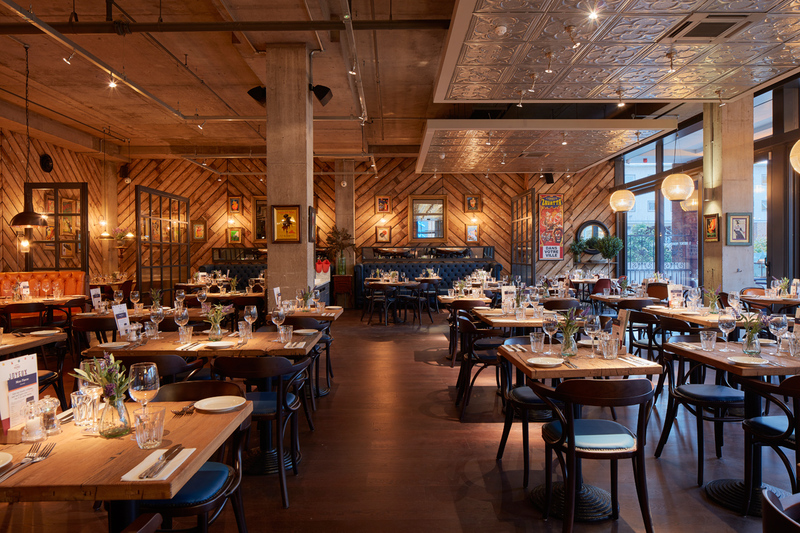 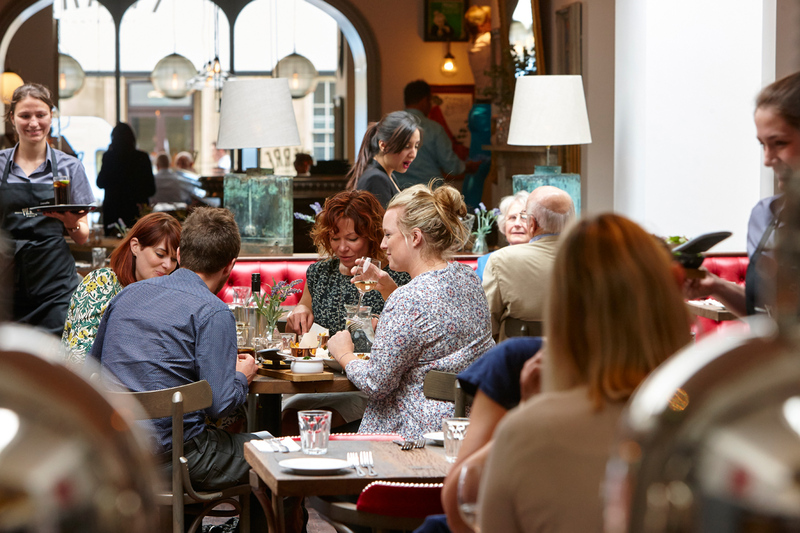 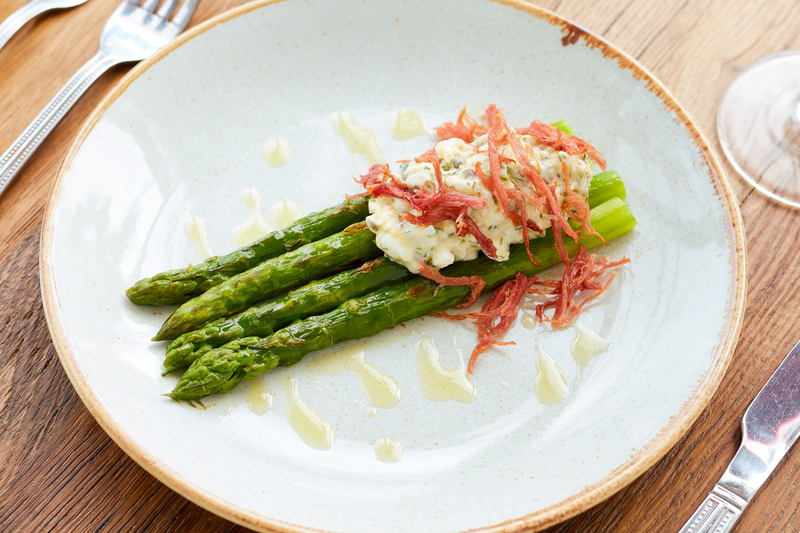 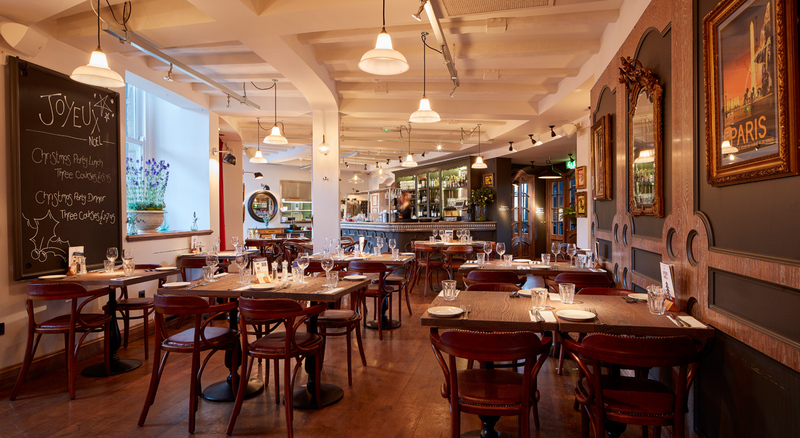 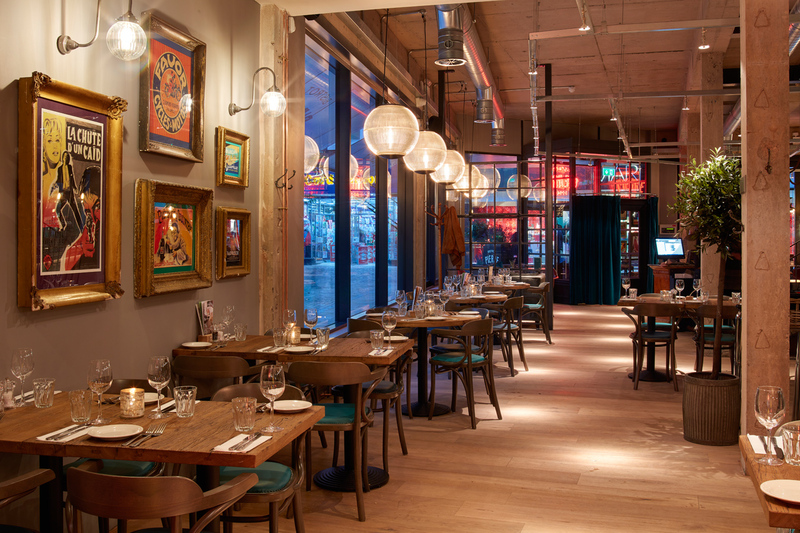 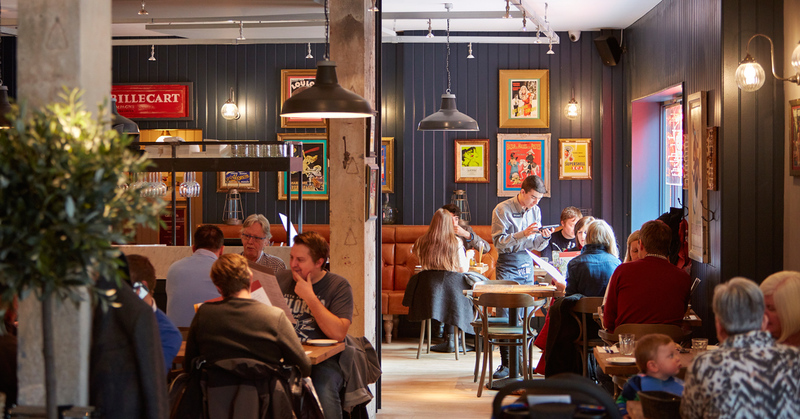 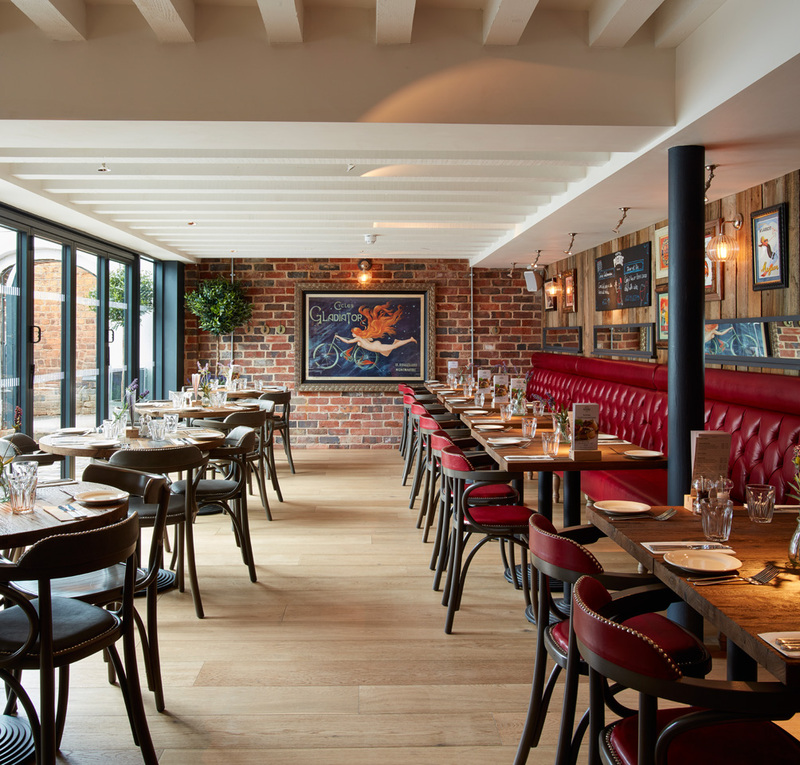 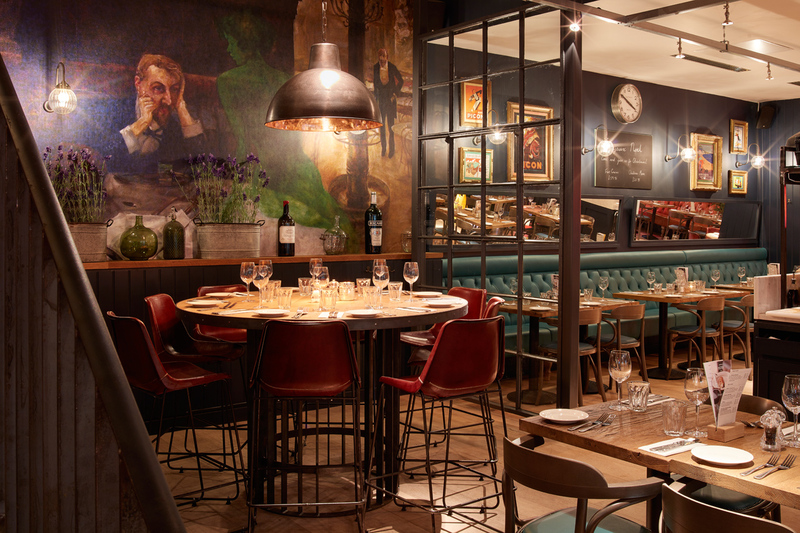 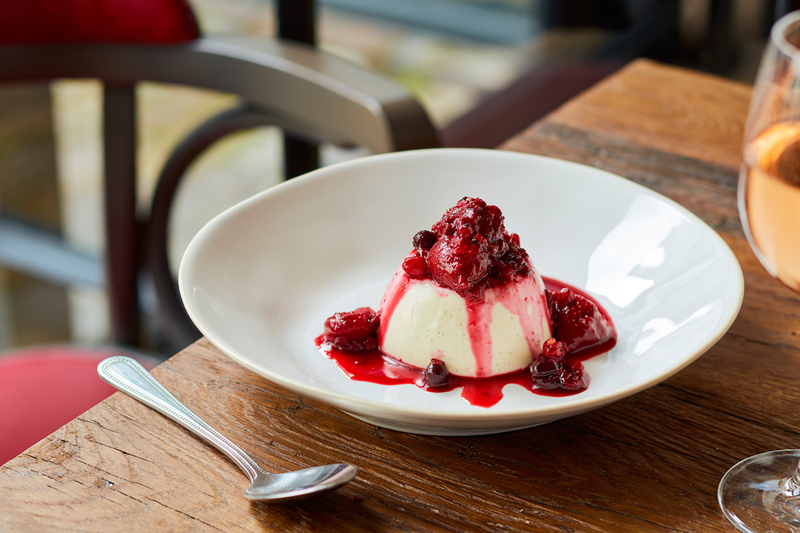 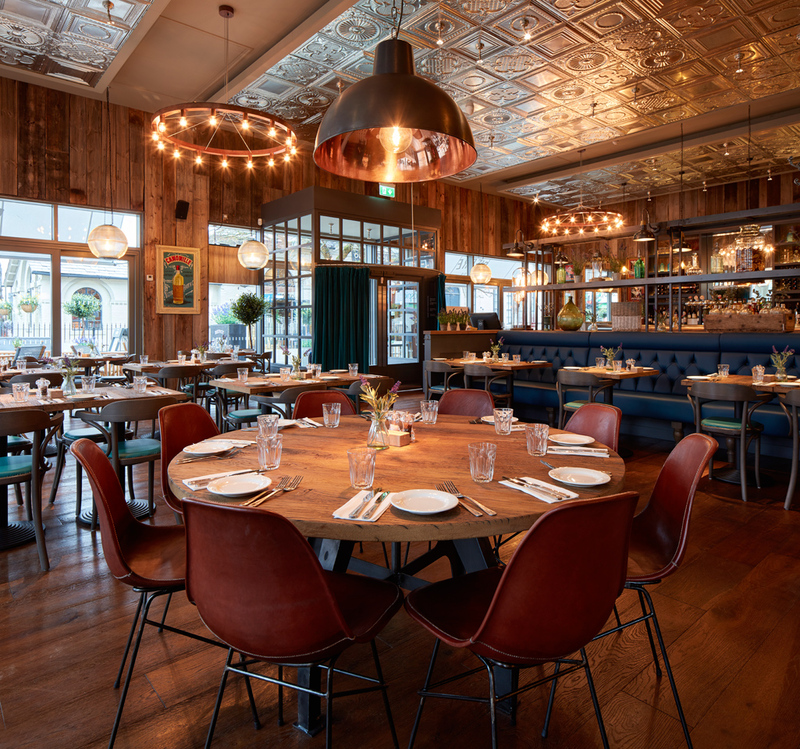 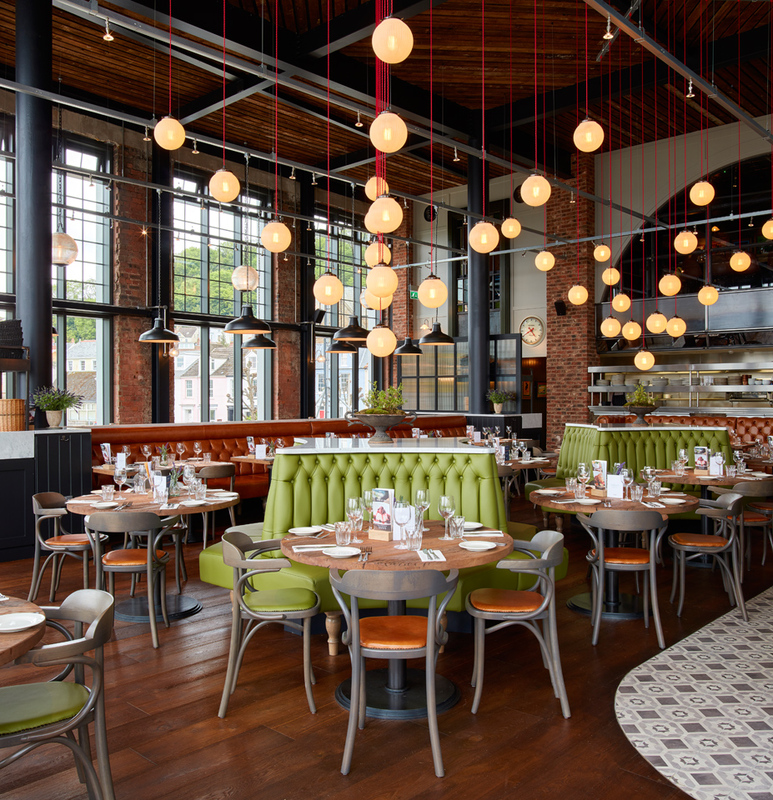 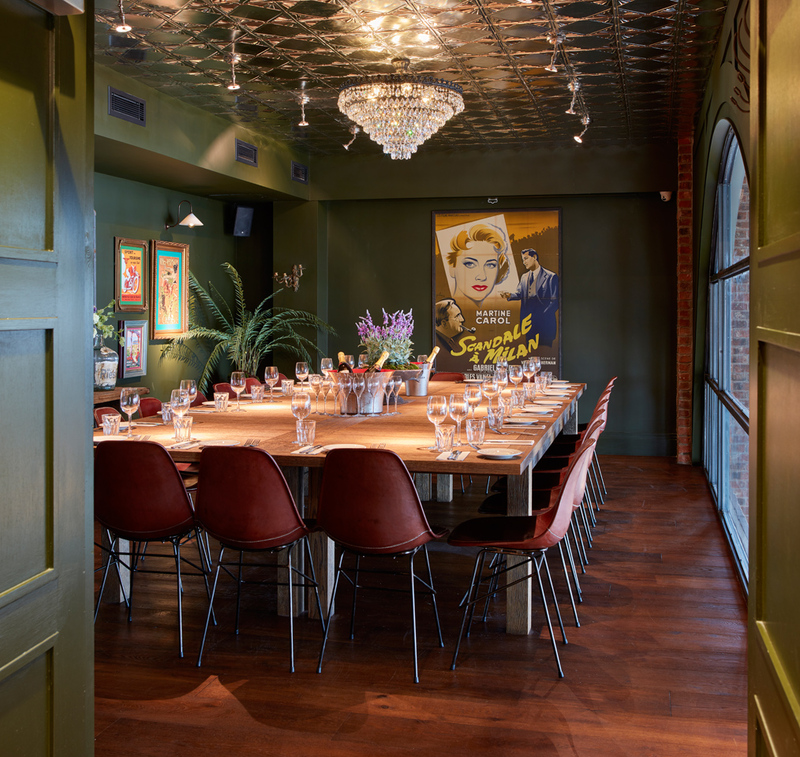 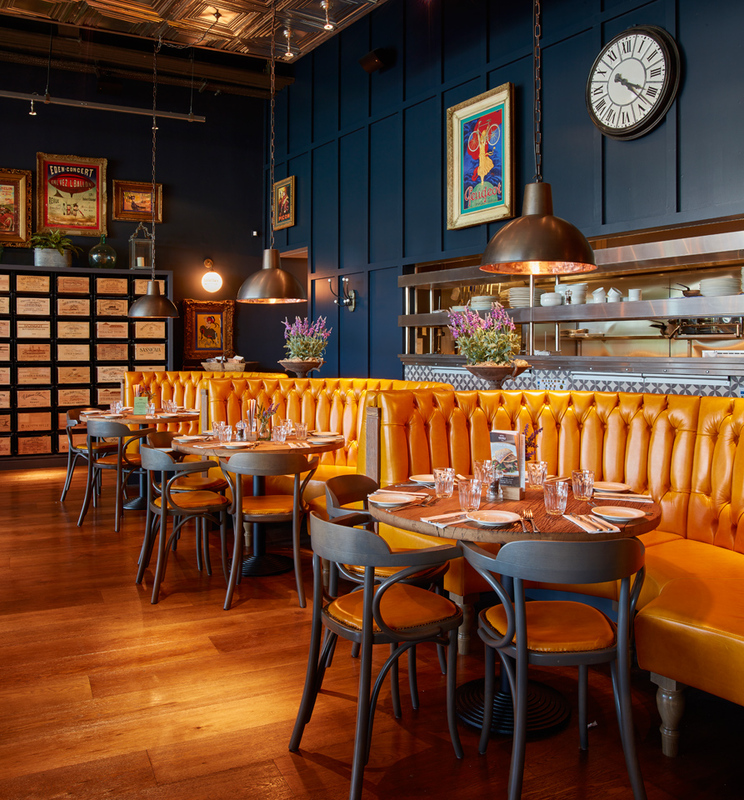 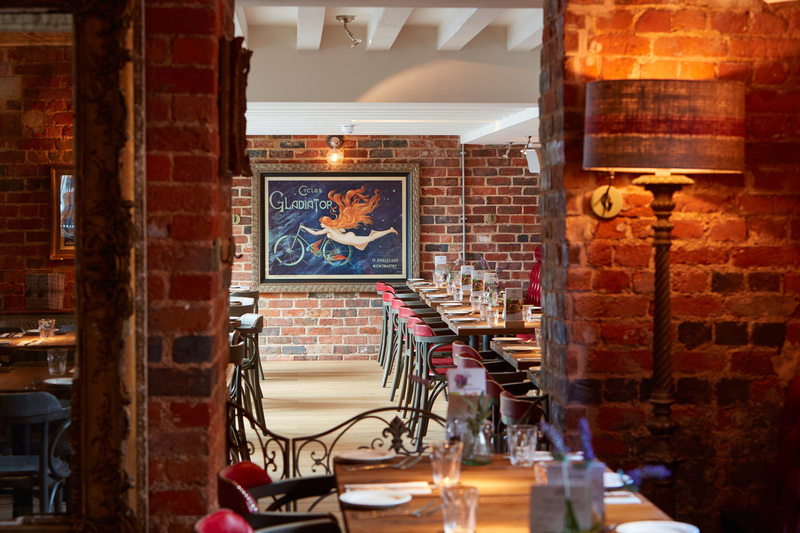 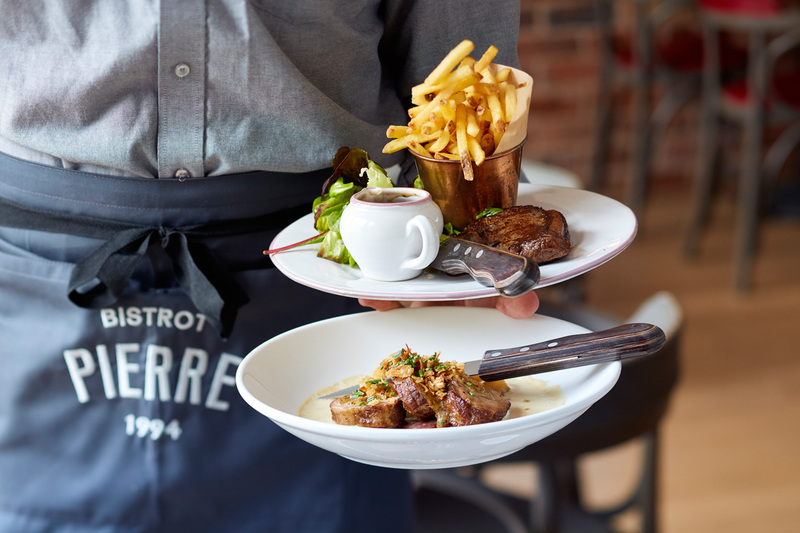 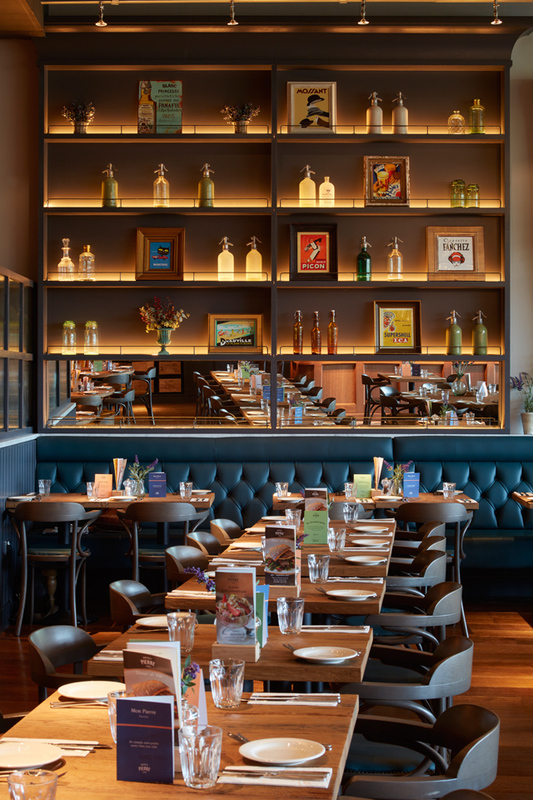 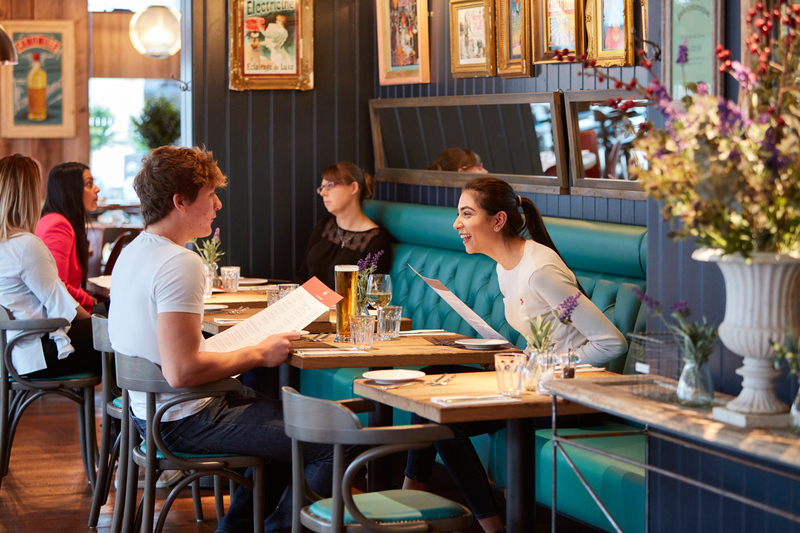 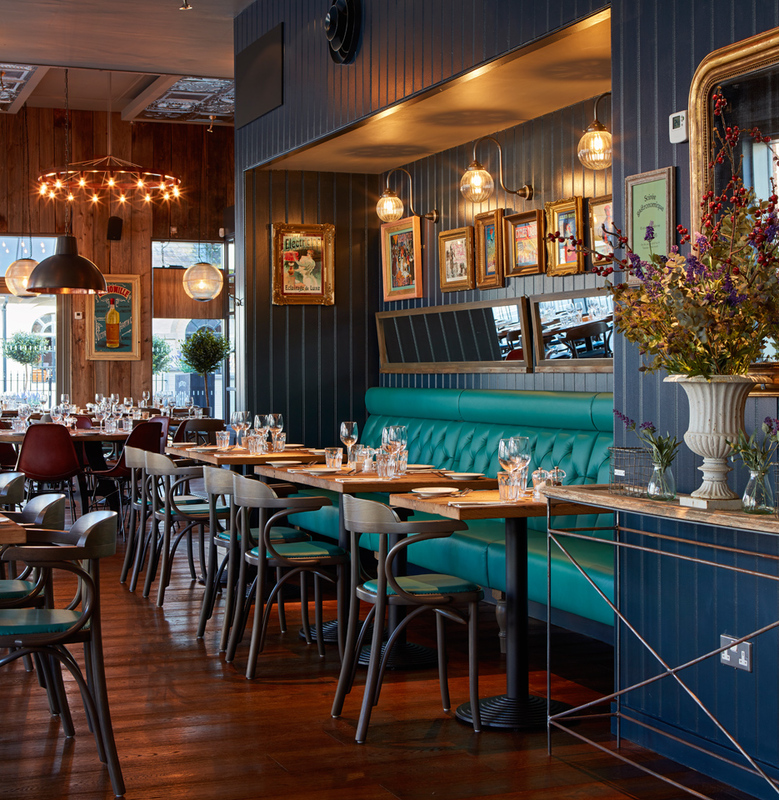 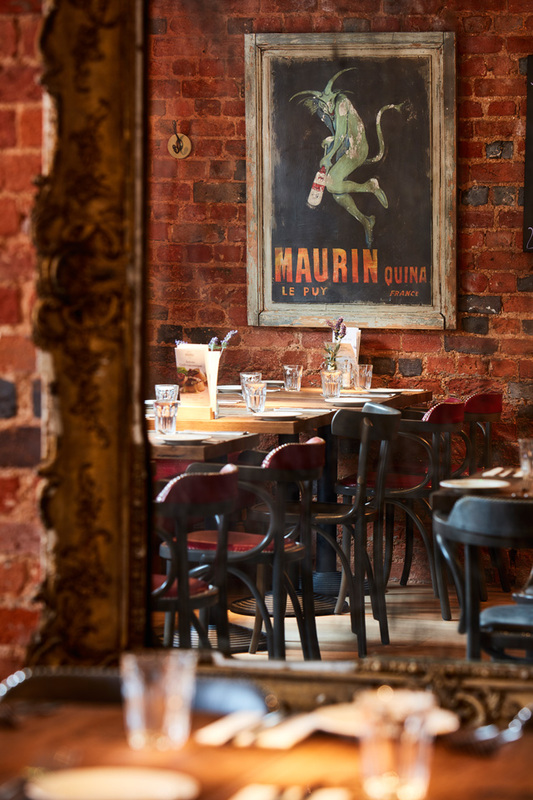 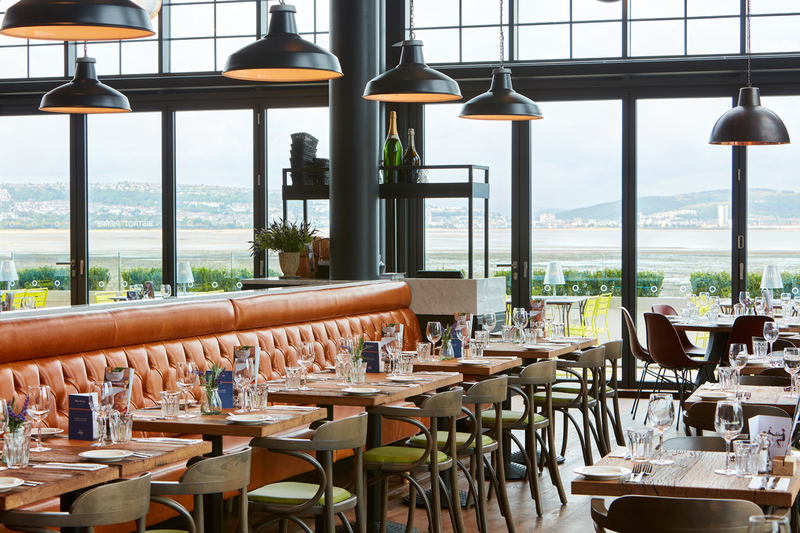 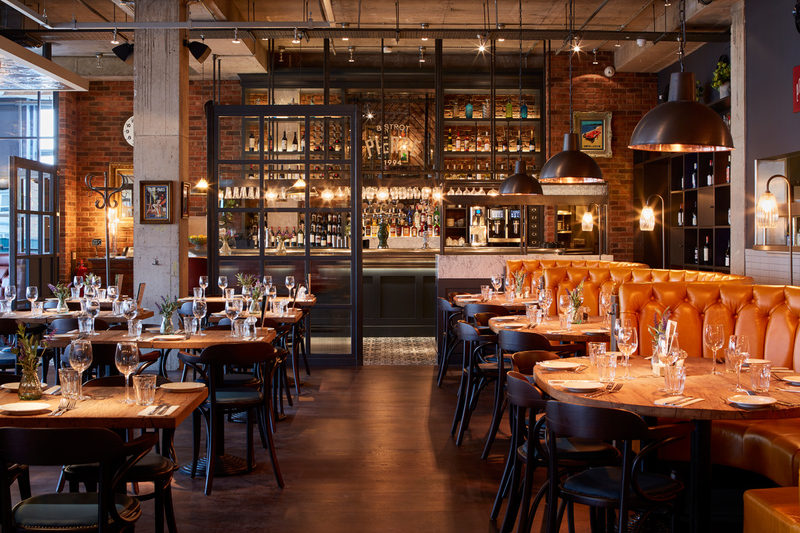 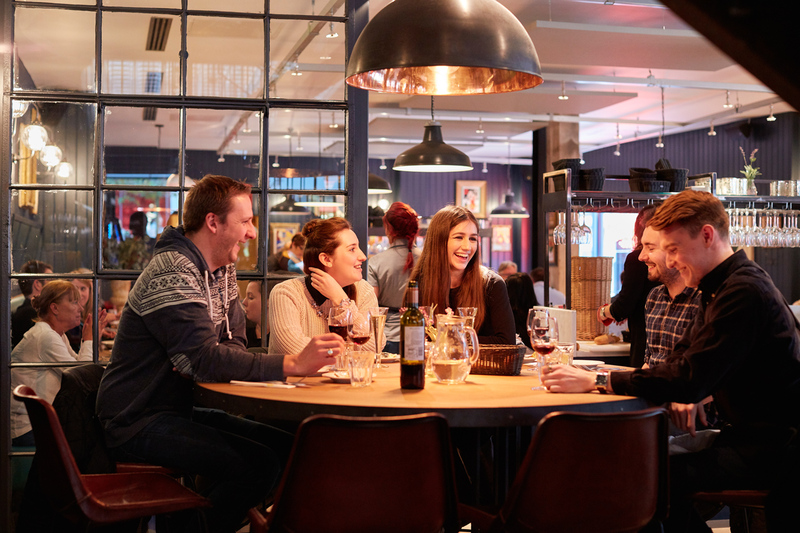 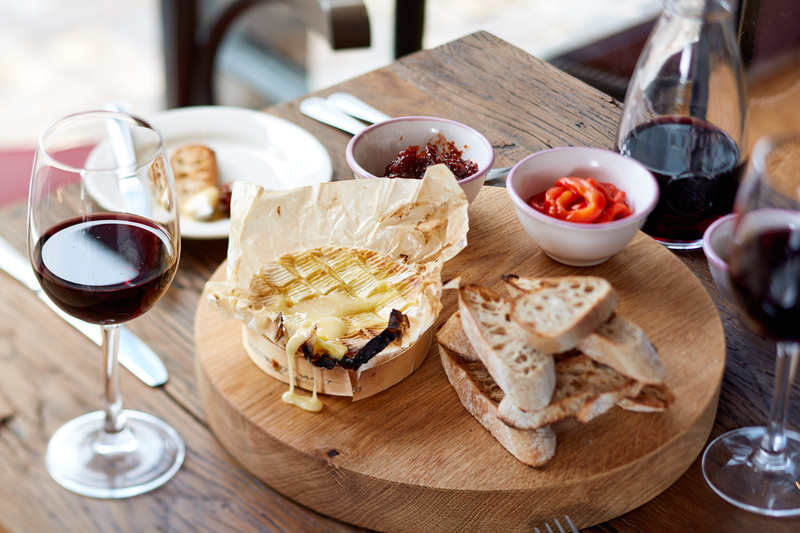 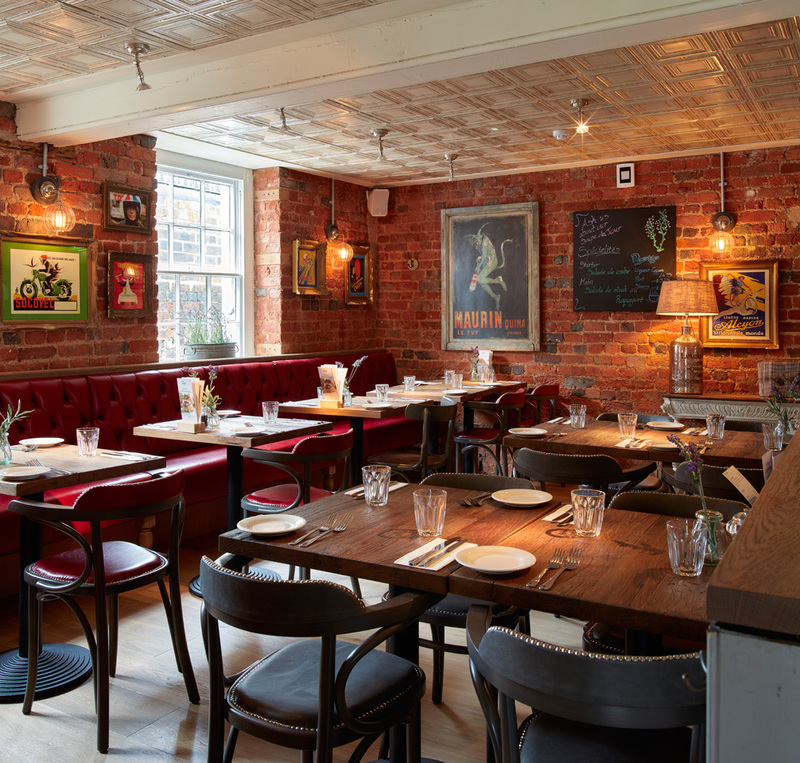 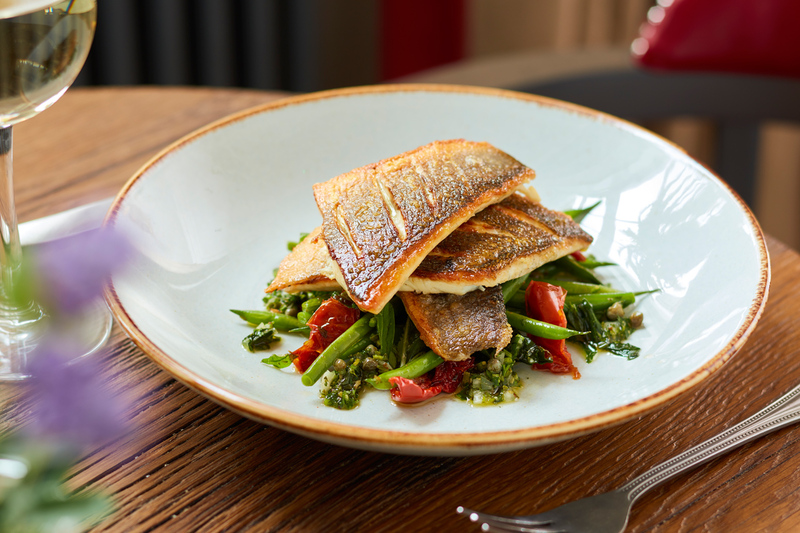 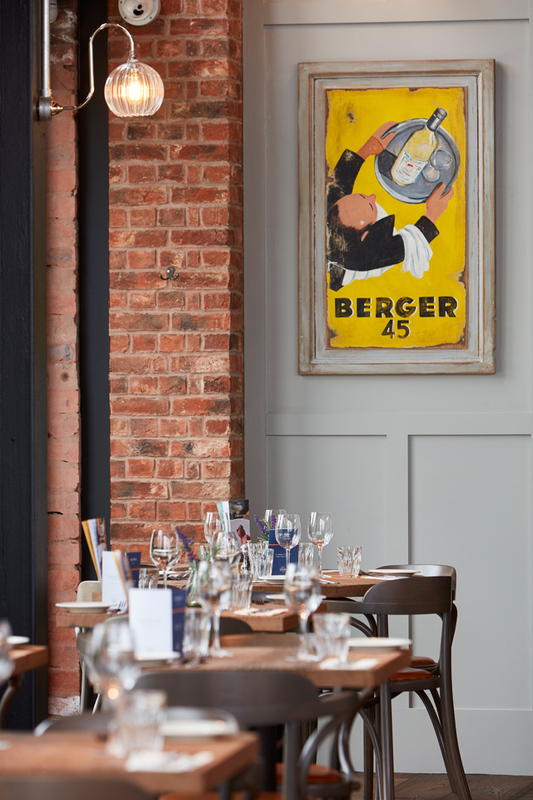 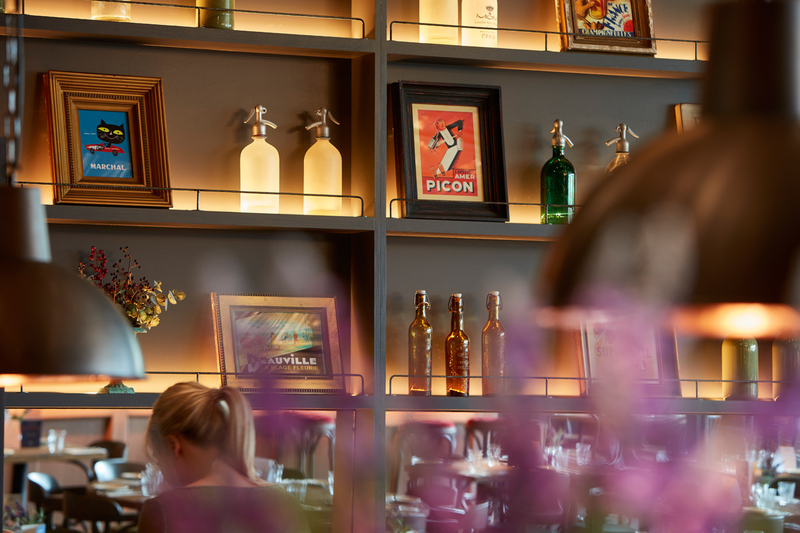 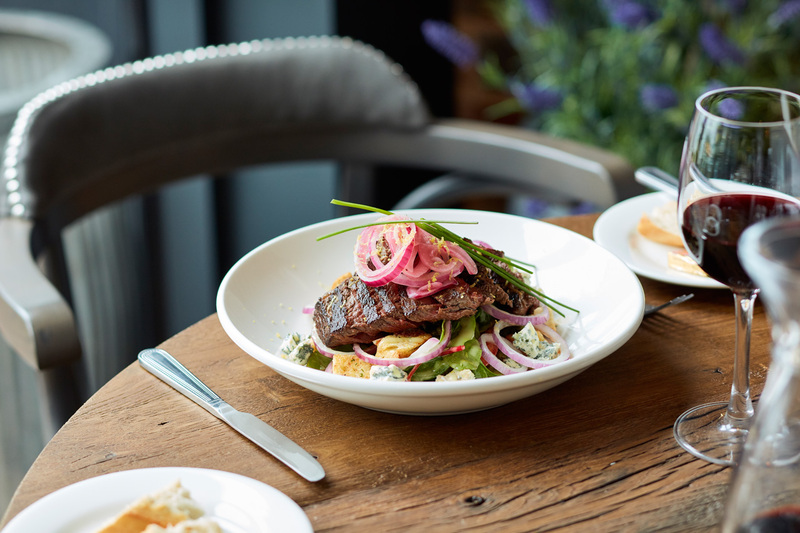 Situated in a Grade II listed building on the city’s bustling canalside, the bistrot is located in Gas Street, close to The Mailbox, Birmingham’s most stylish shopping destination. 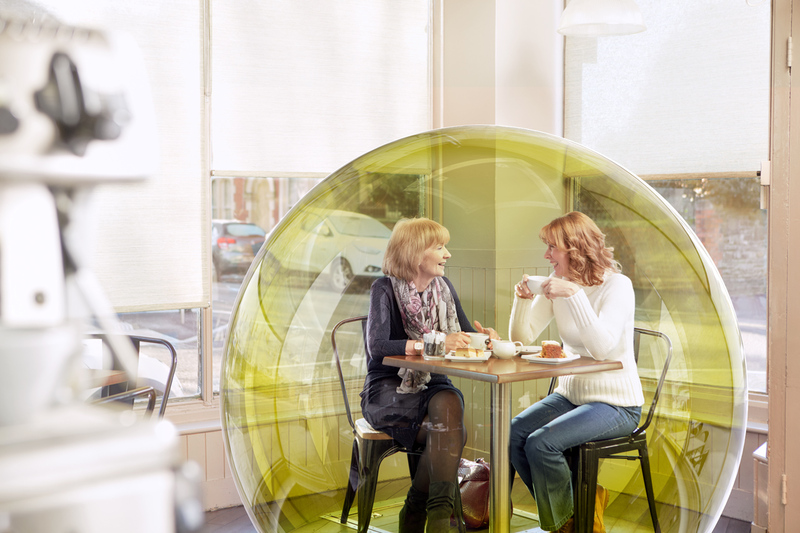 The new website for bigHead launched last week with the new photography I shot late last year in conjunction with Clout Branding. 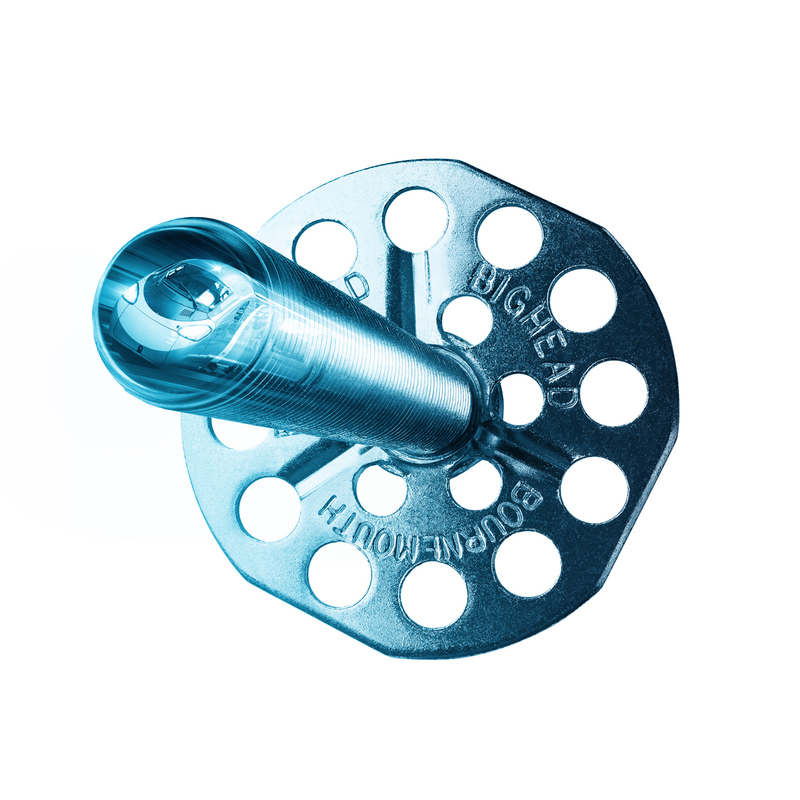 bigHead help designers and engineers to fasten materials across a wide range of industries. 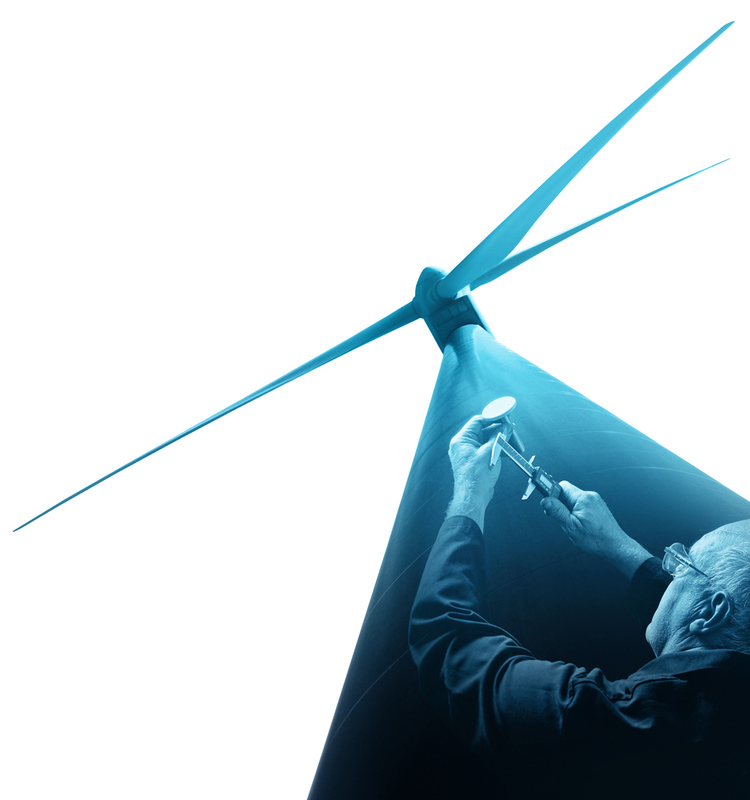 From super-cars and luxury yachts to infrastructure projects and public utilities. 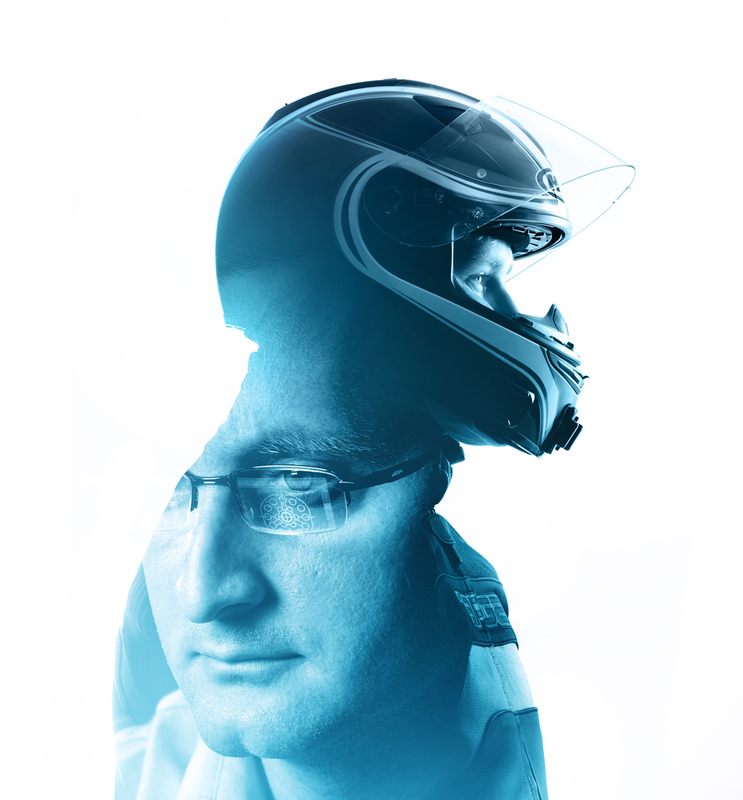 Wherever you see a complex fastening challenge, you’ll find a bigHead hard at work. 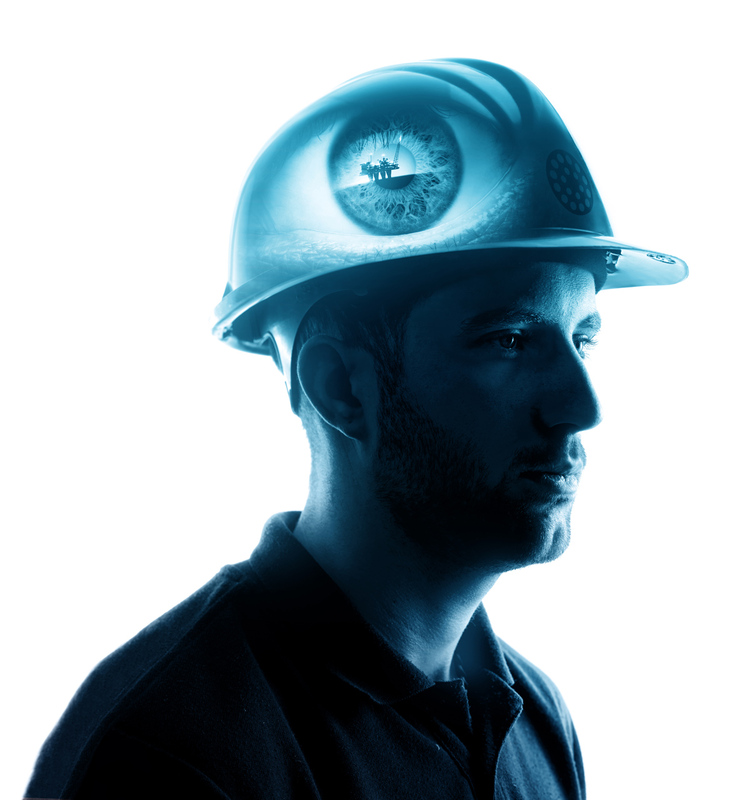 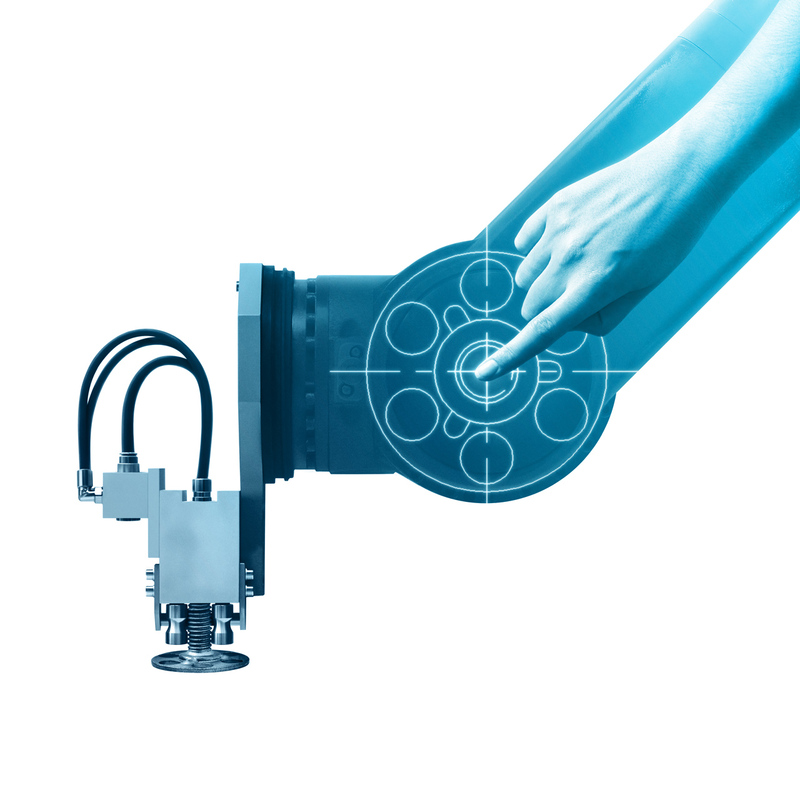 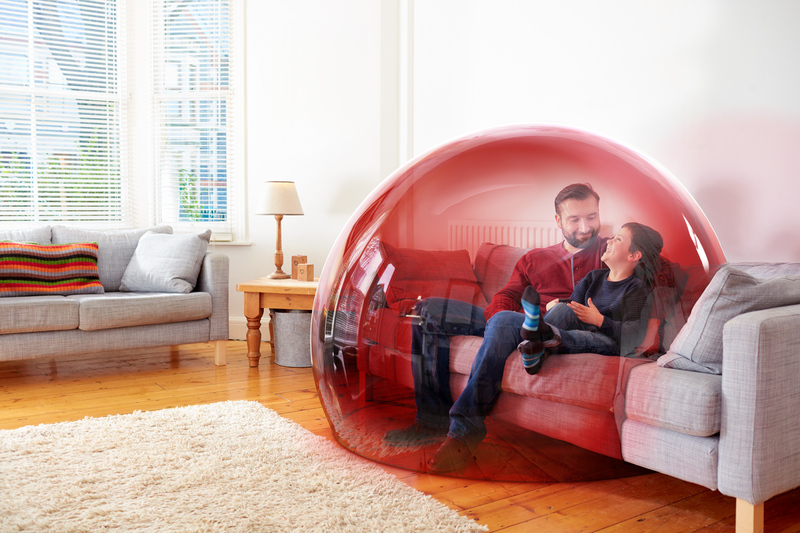 The concept images I shot are designed to illustrate specific case studies where bigHead have provided a solution to engineering challenges in differing sectors of industry. 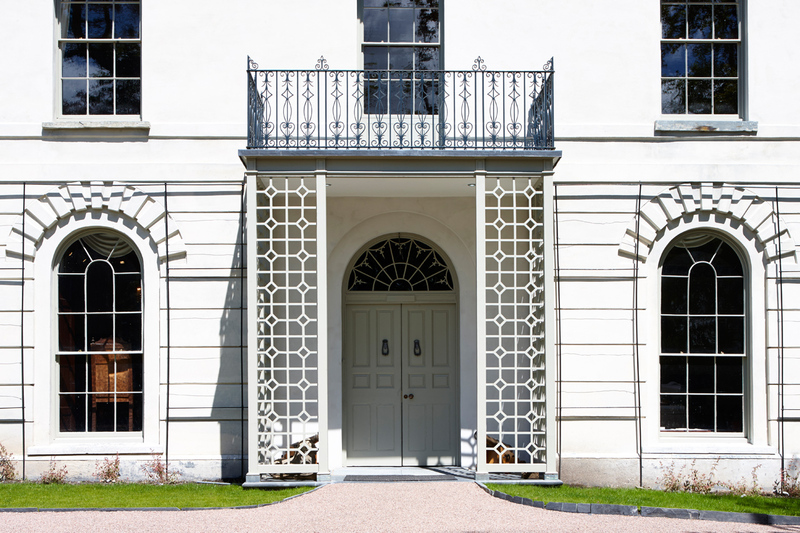 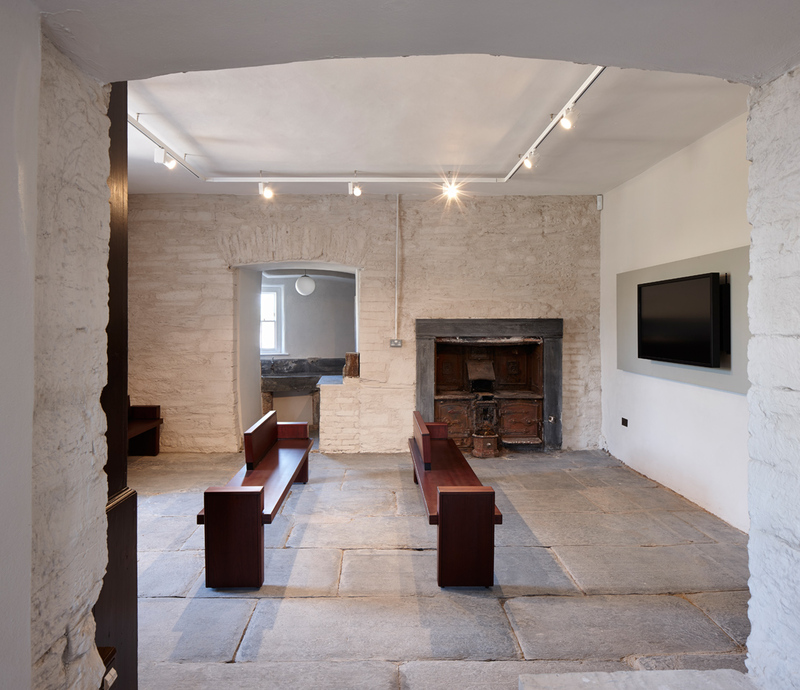 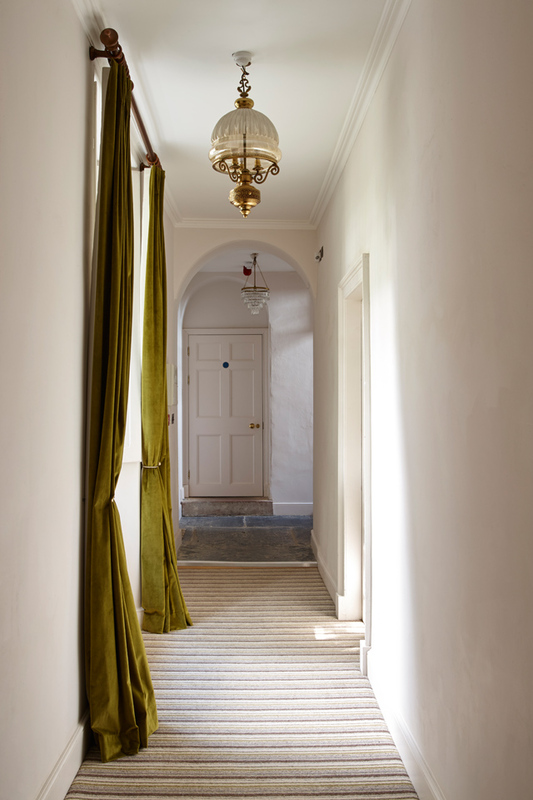 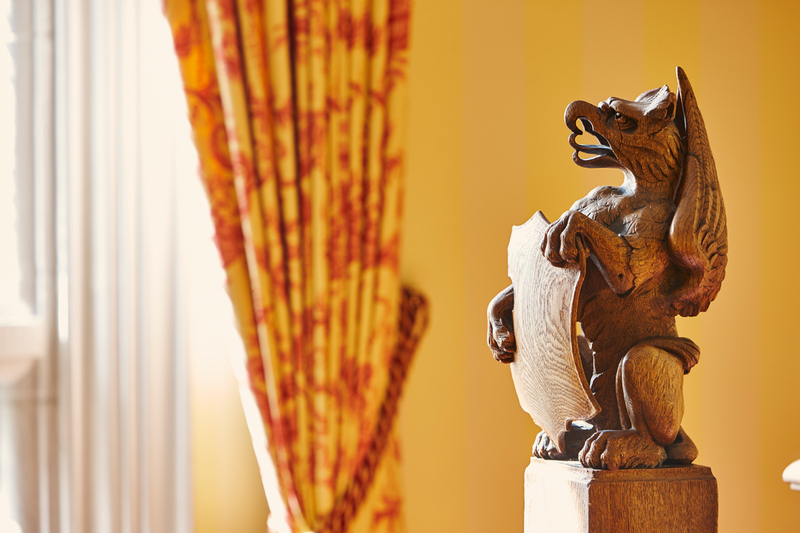 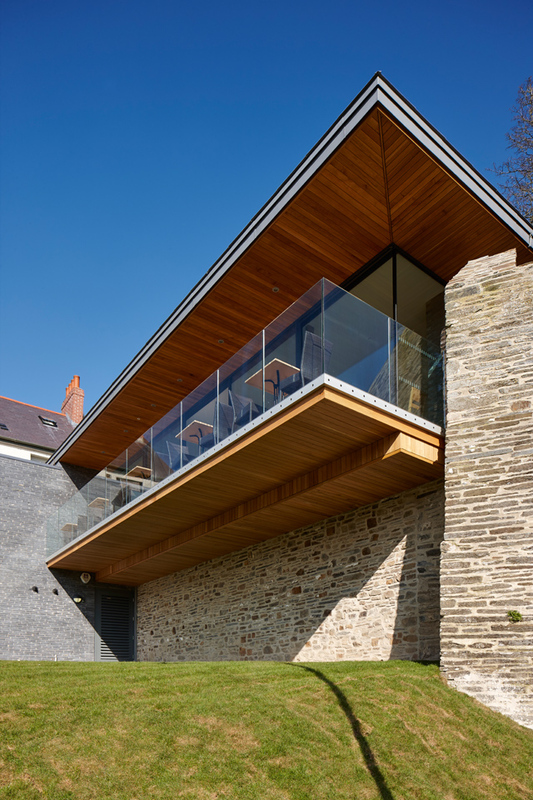 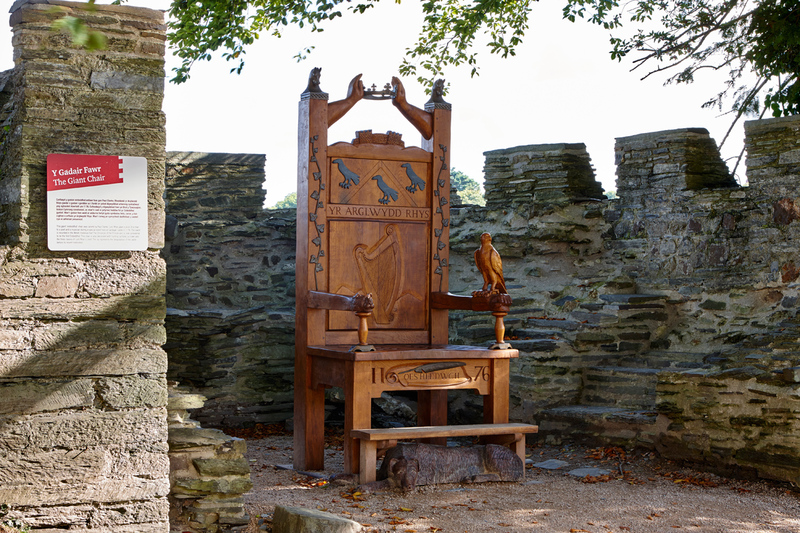 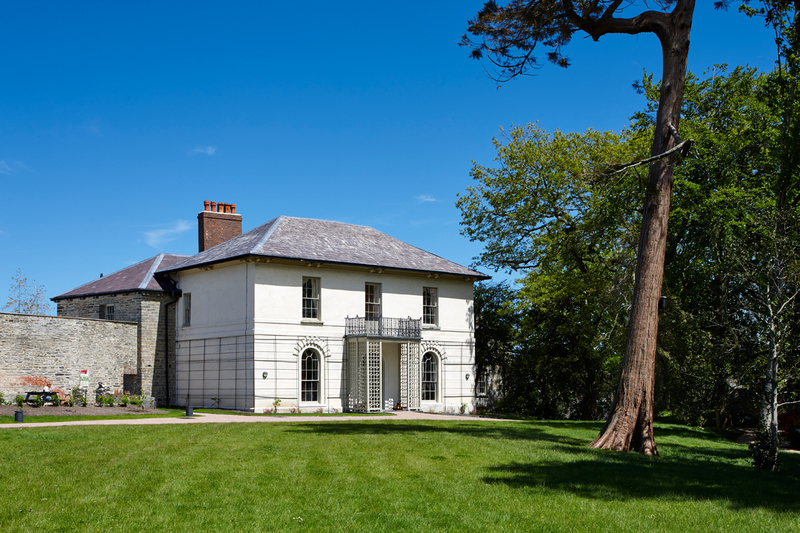 A multiple visit commission by the architects to photograph the regeneration of this historic castle in rural Wales. 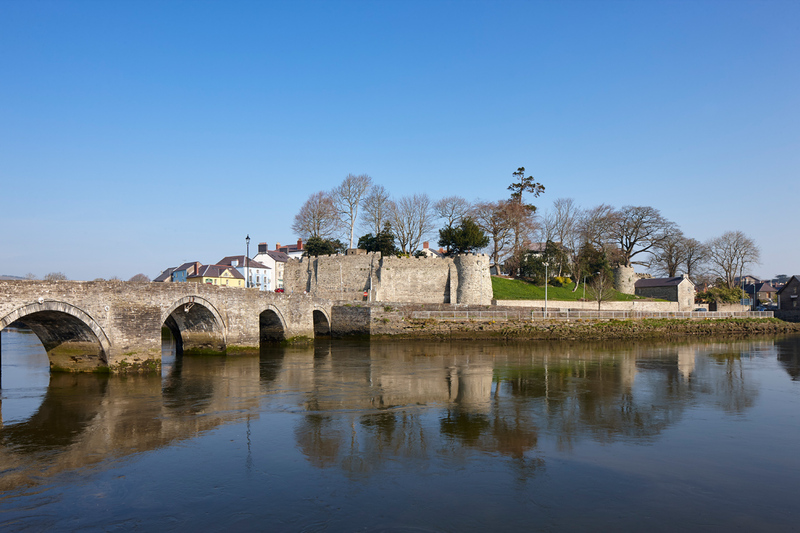 The brief required documenting the various stages of completion through 2015 and highlighting the holiday accommodation, small business workspace, conference facilities and restaurant built into the conserved fabric of the Castle. 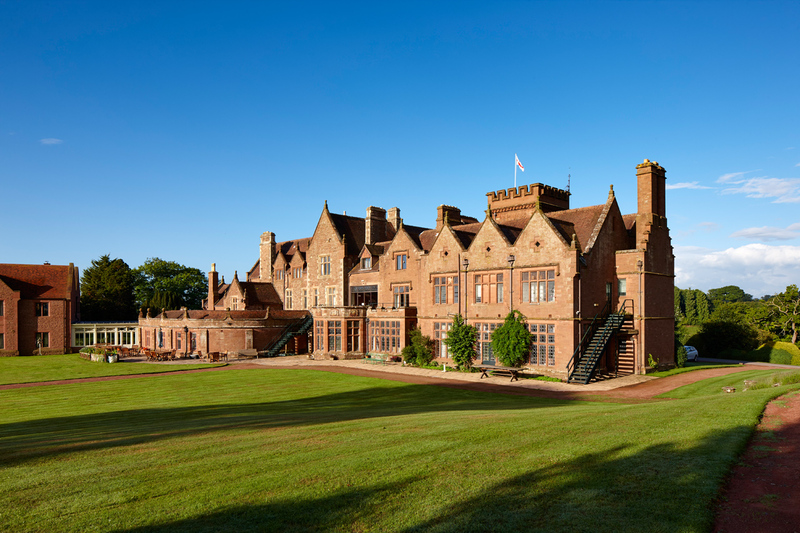 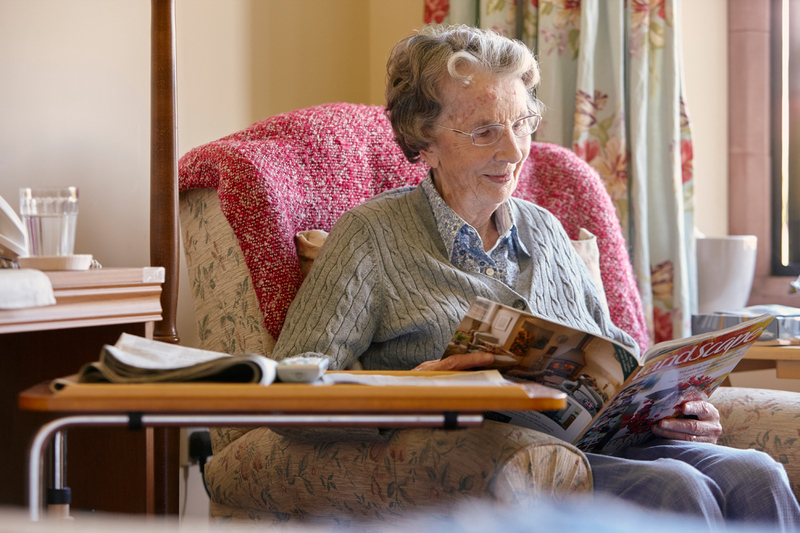 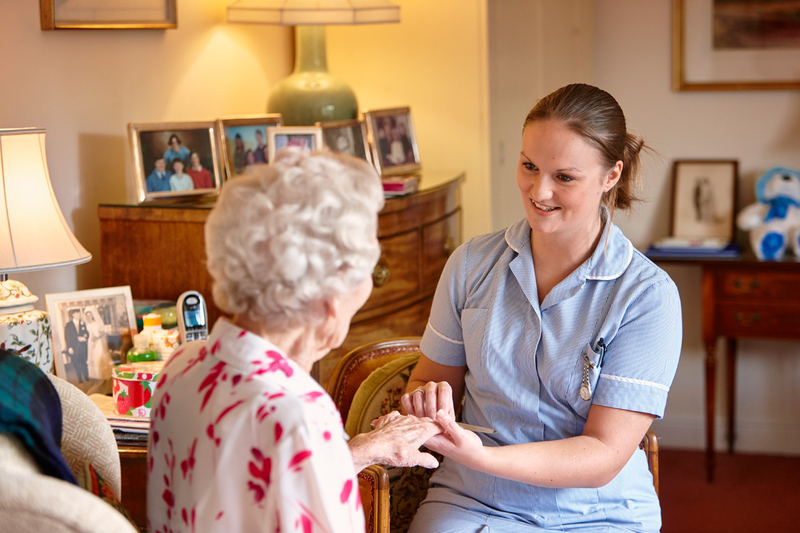 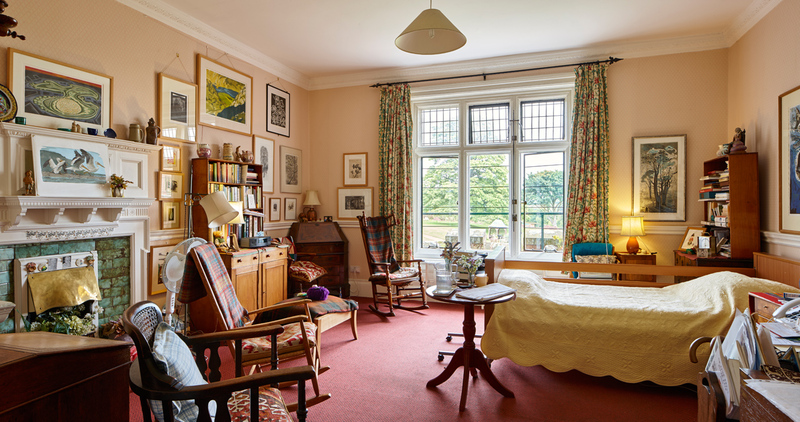 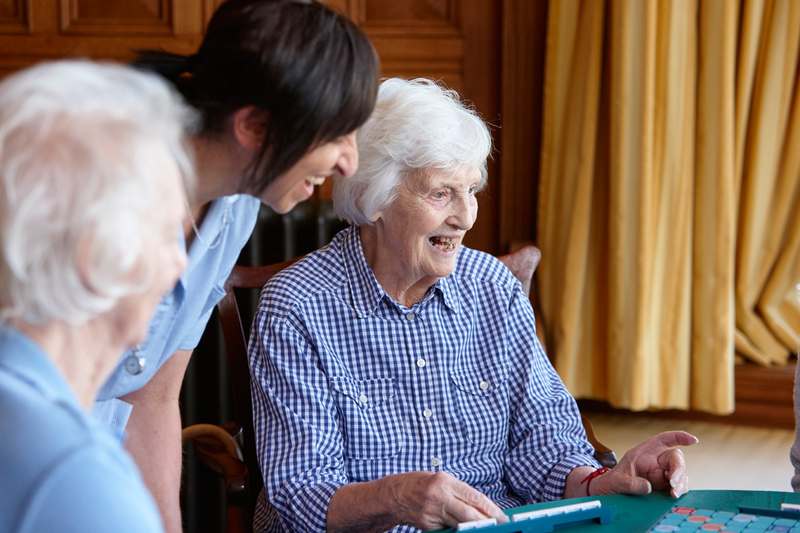 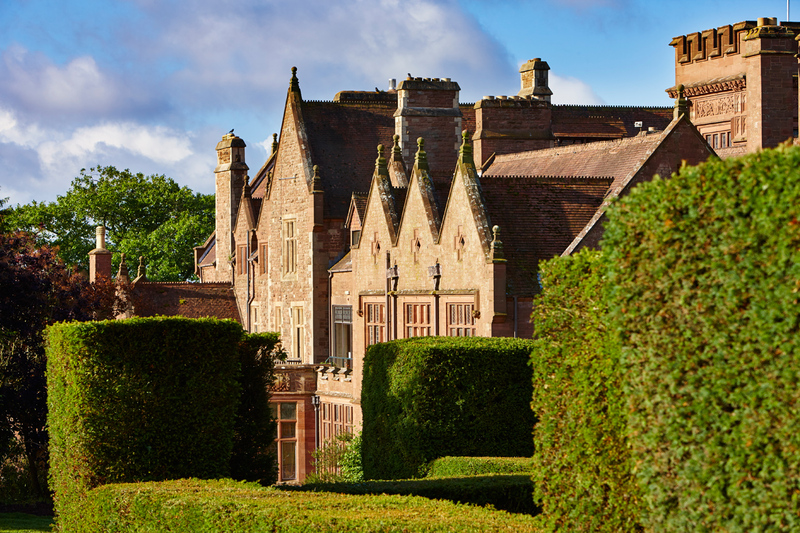 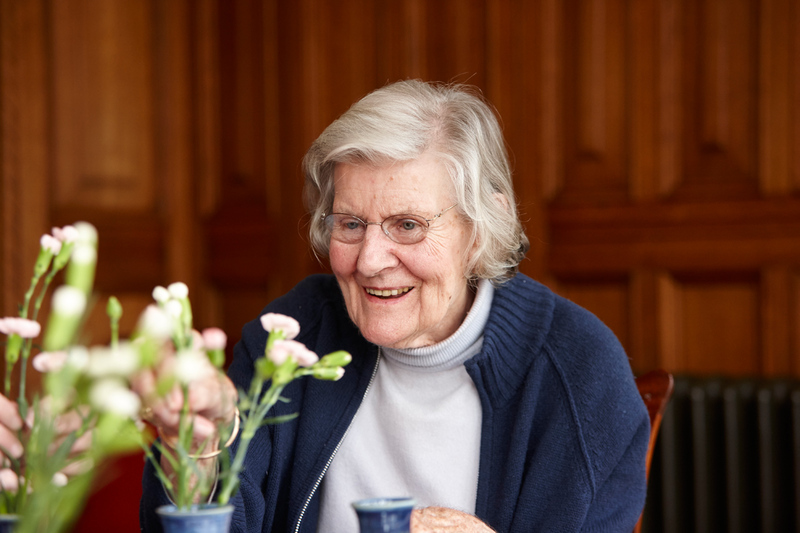 Photography commission for a new website for Brockhampton Court, a family-owned Nursing Home set in stunning Herefordshire countryside, in the small village of Brockhampton, 10 miles from Hereford. 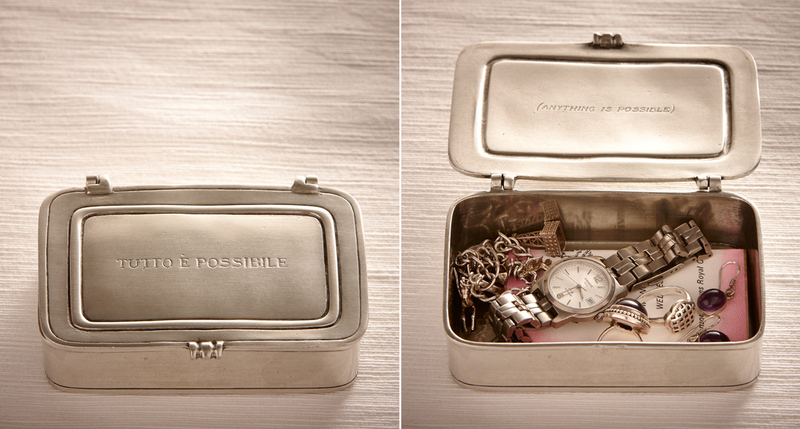 Location photography for blog and lookbook content for the high quality Italian pewter retailer Cosi Tabellini. 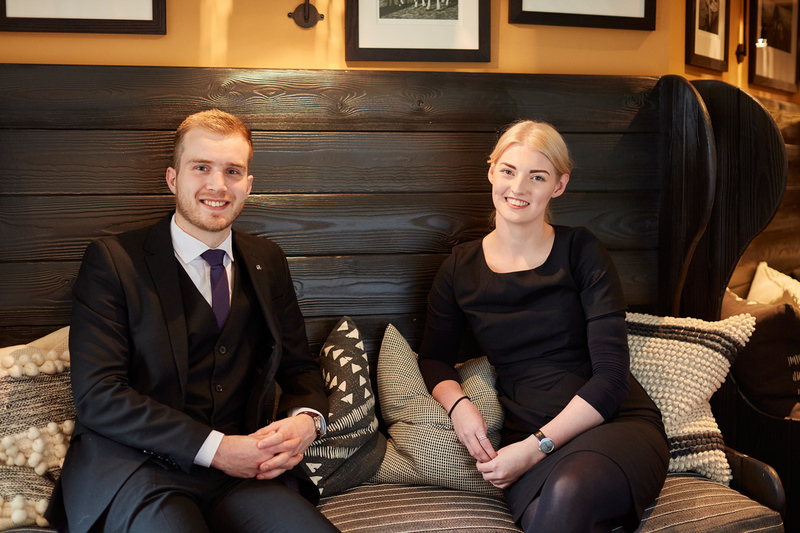 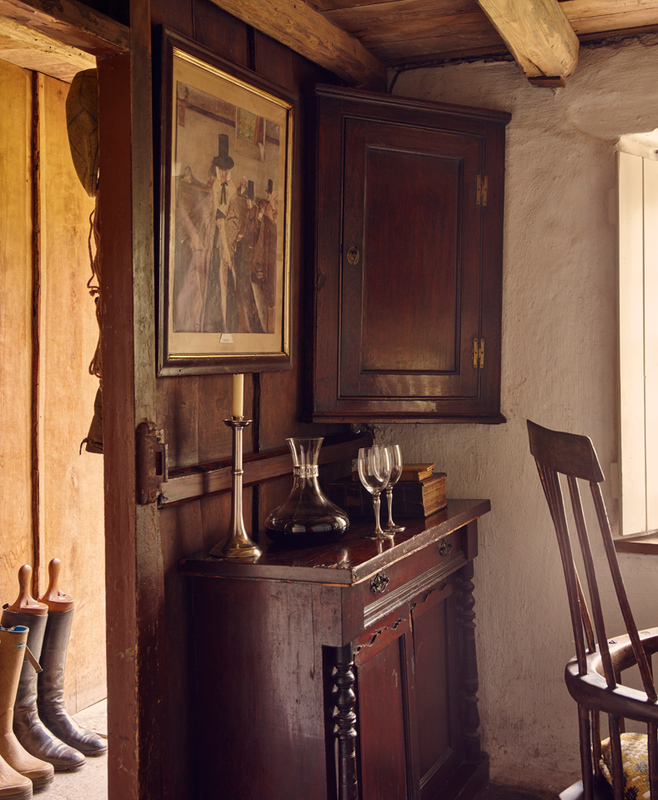 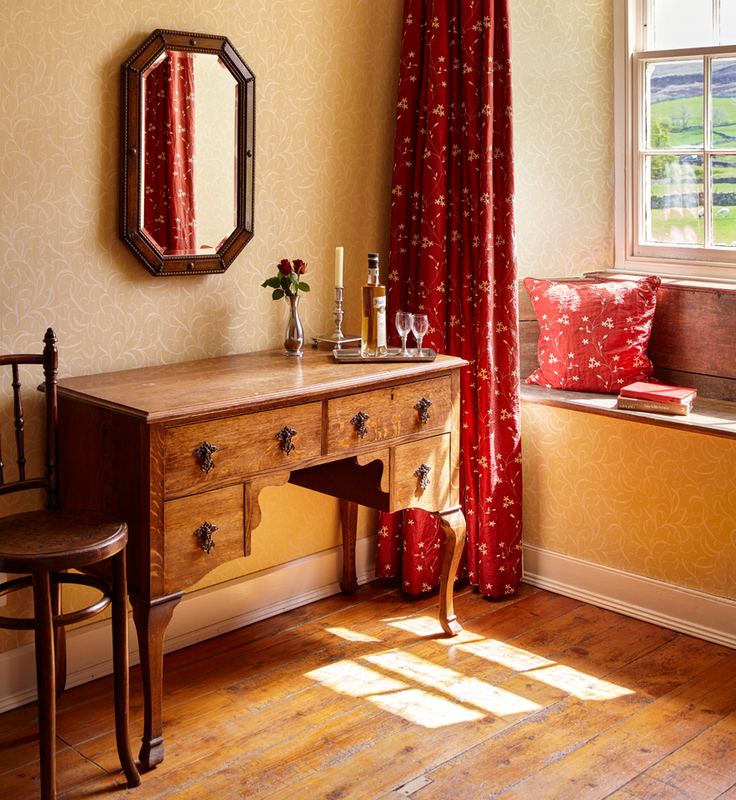 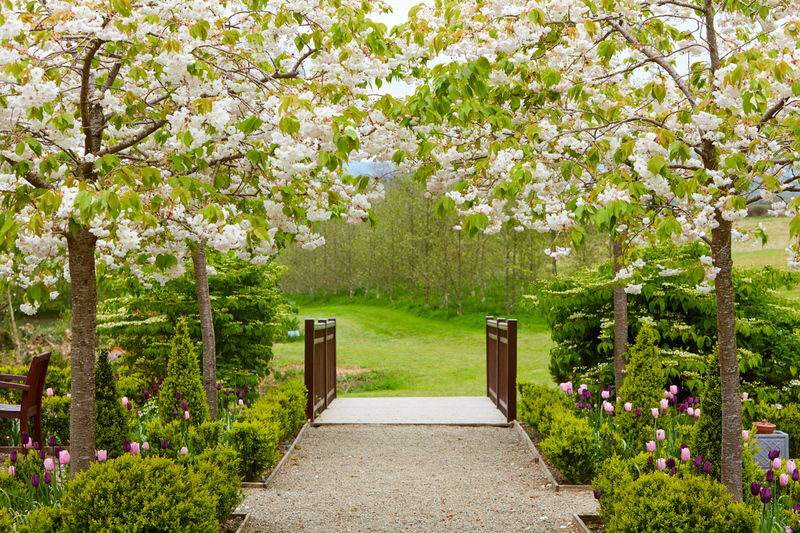 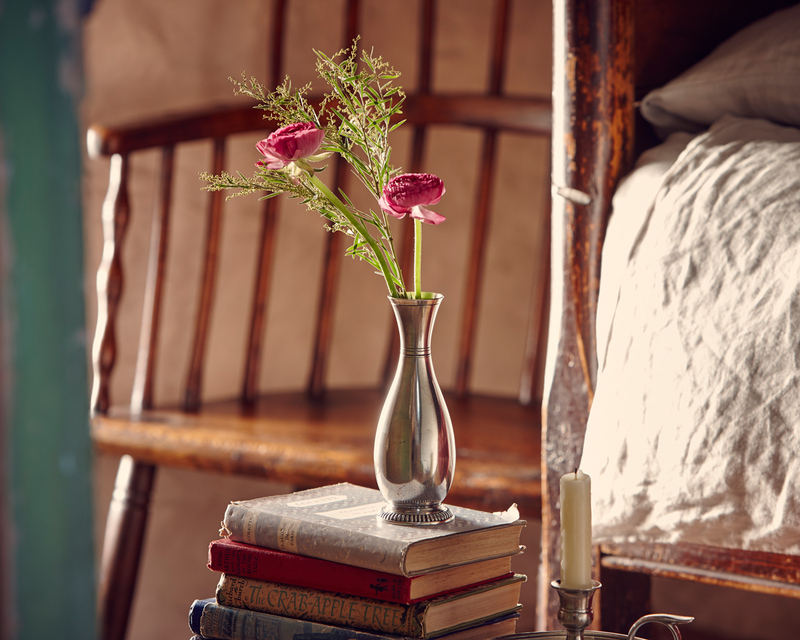 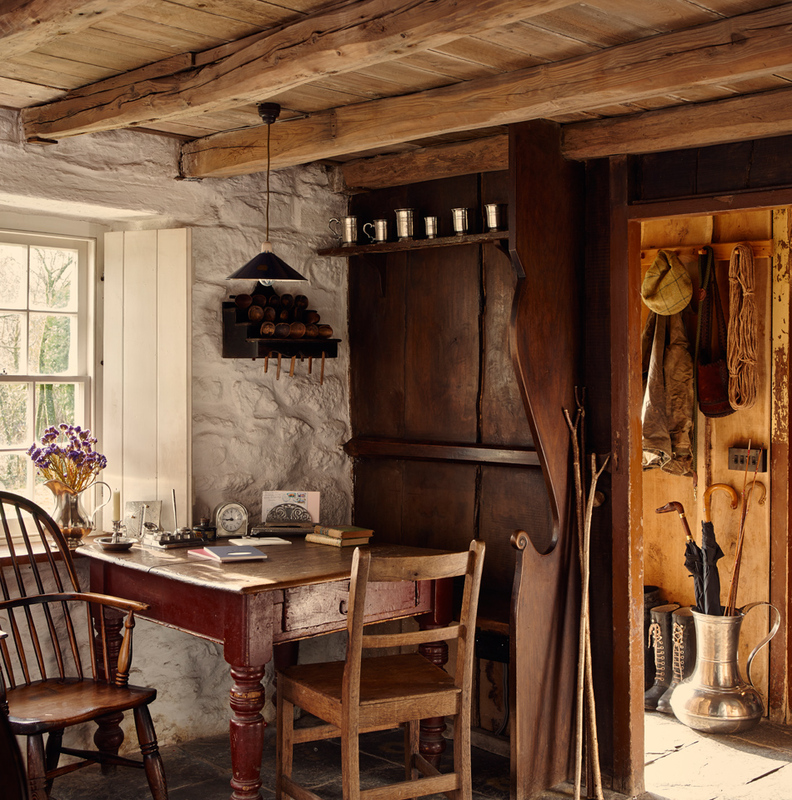 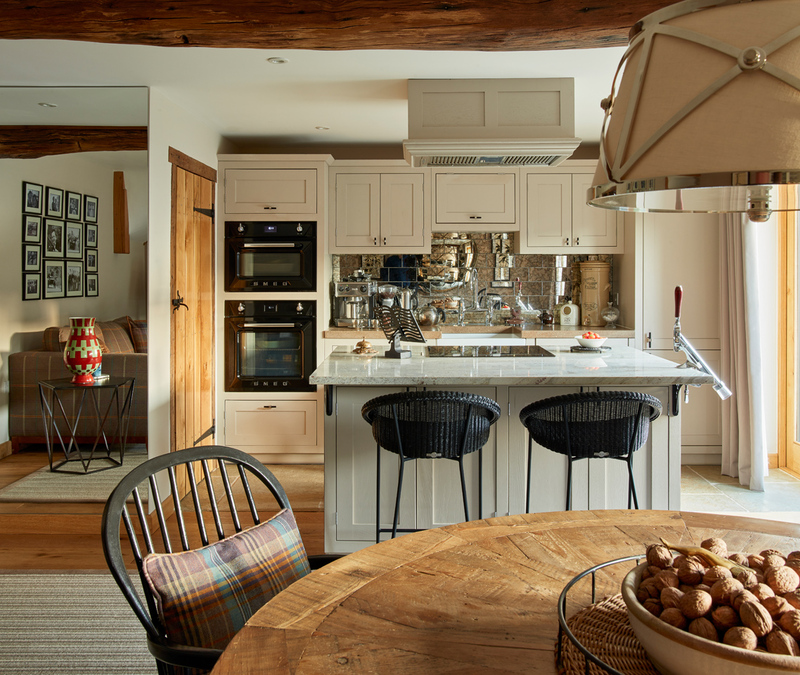 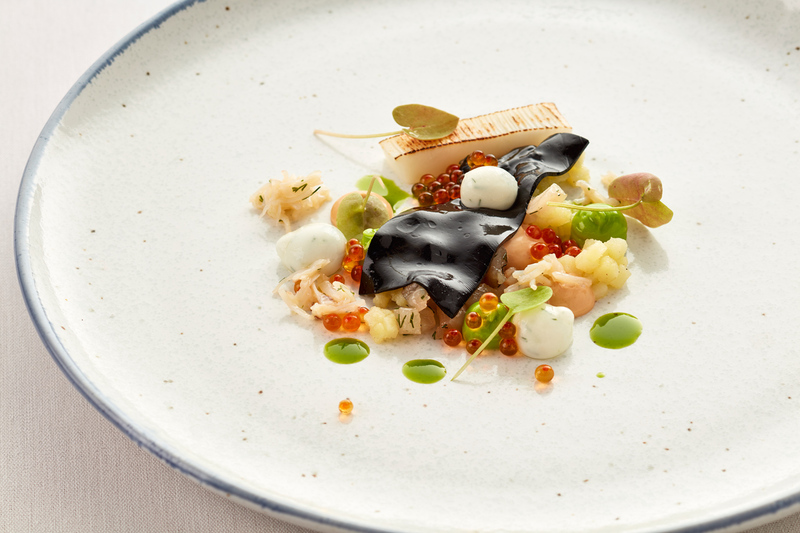 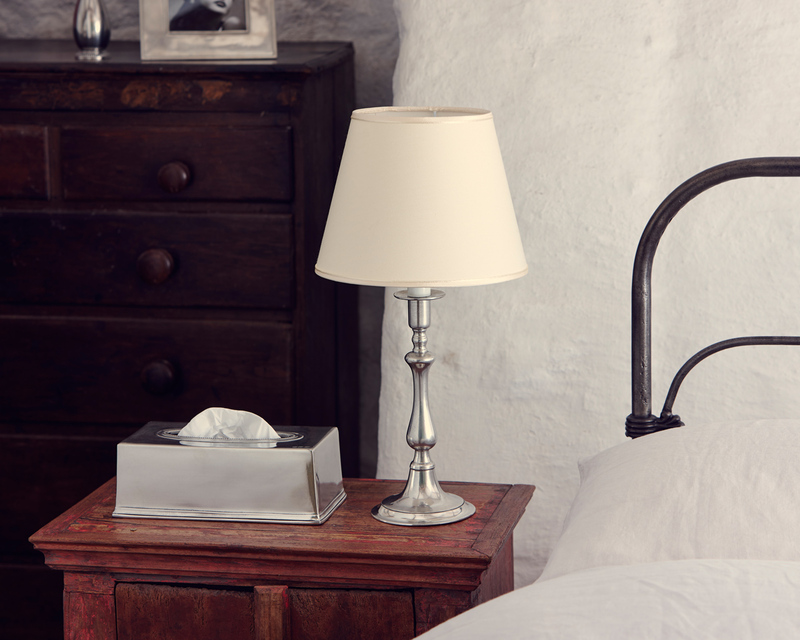 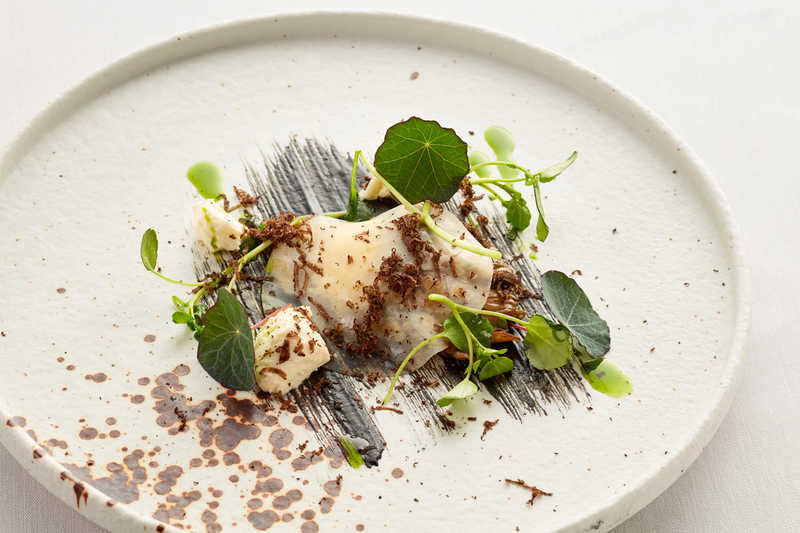 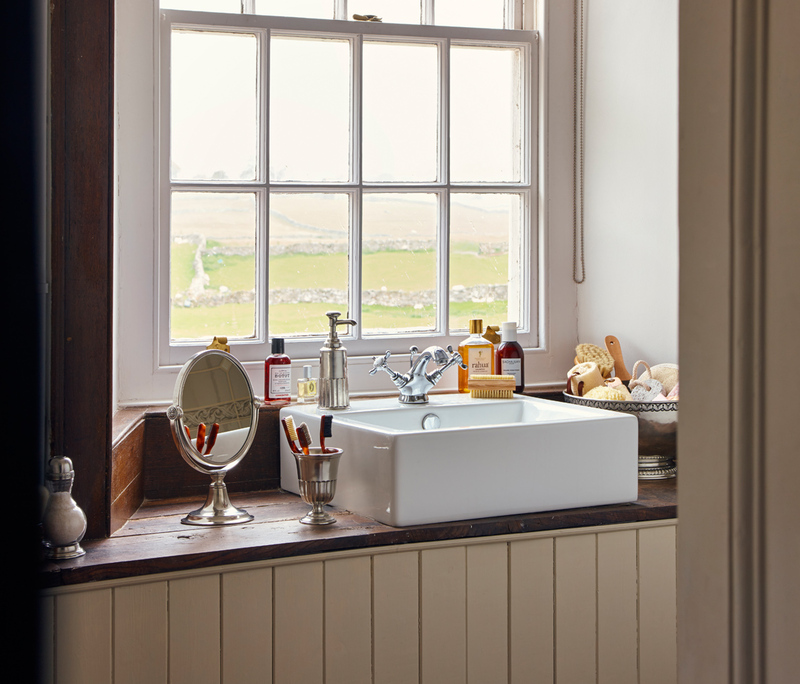 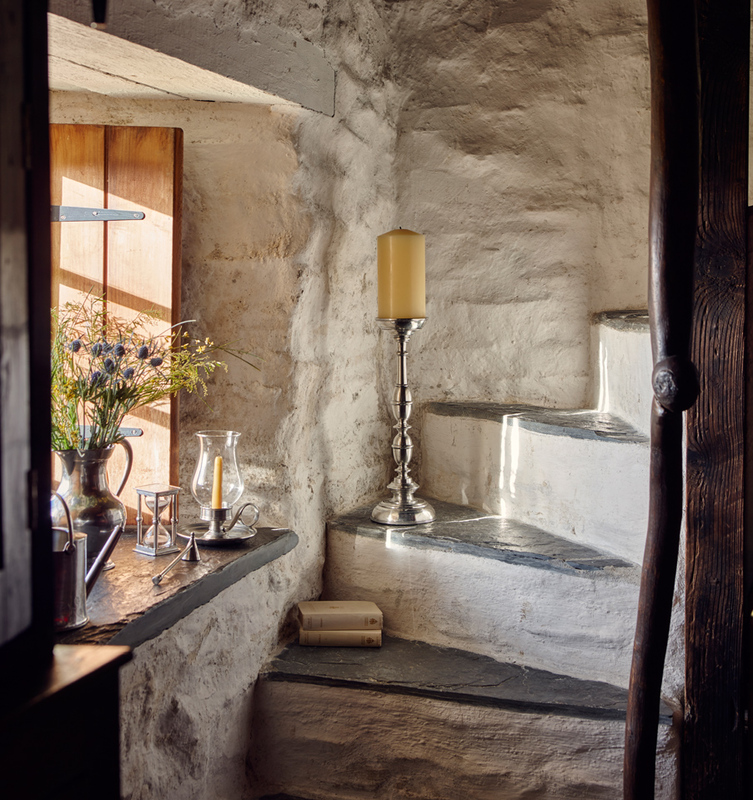 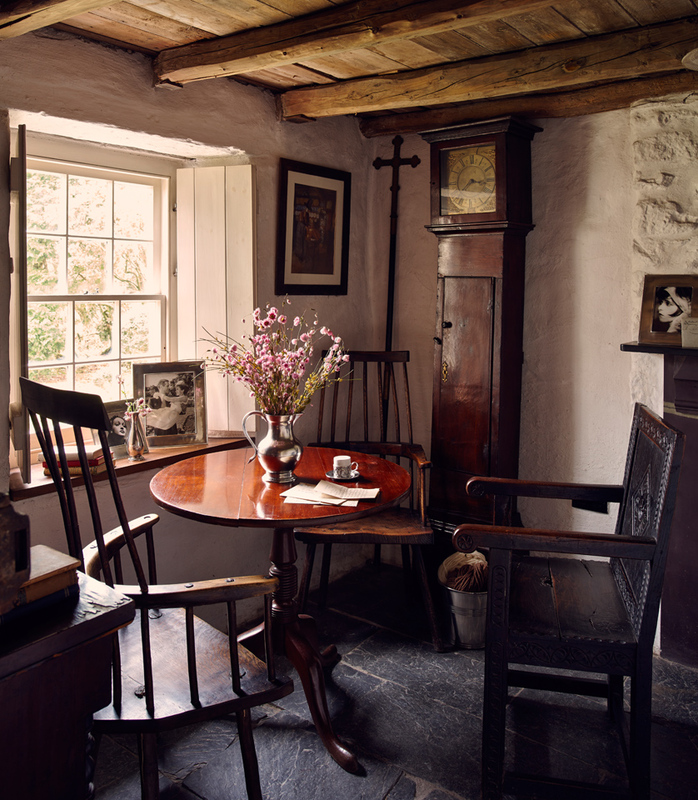 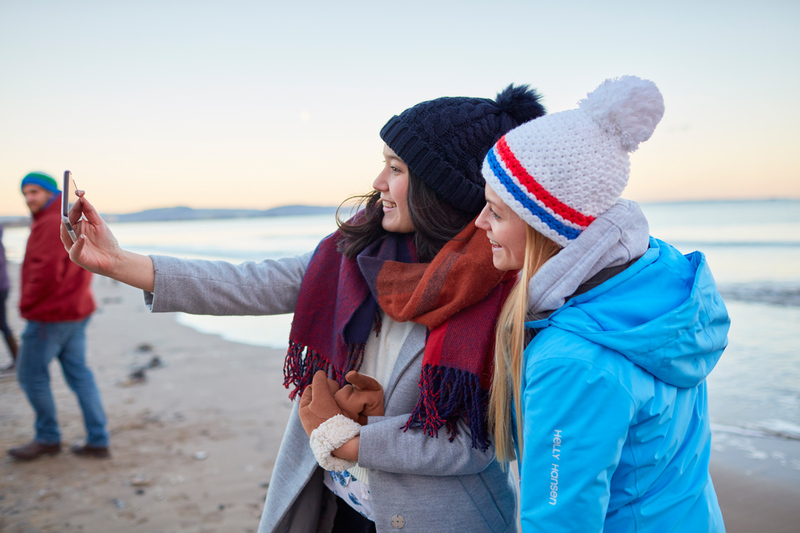 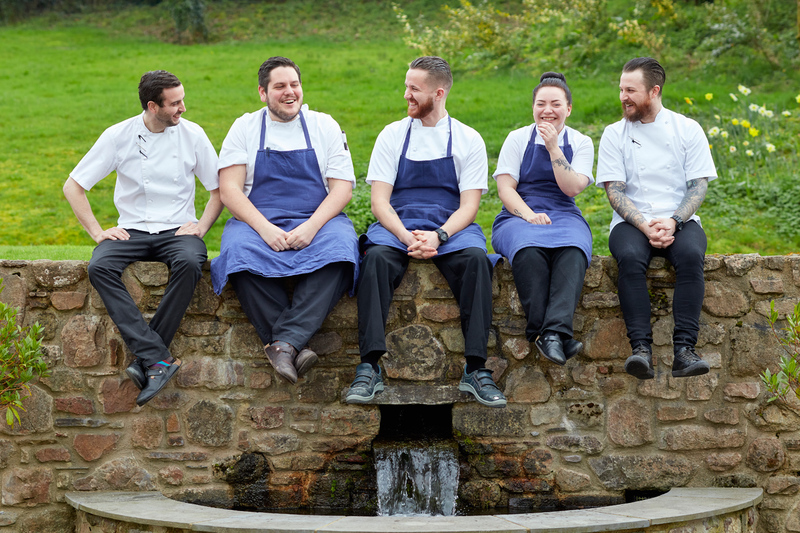 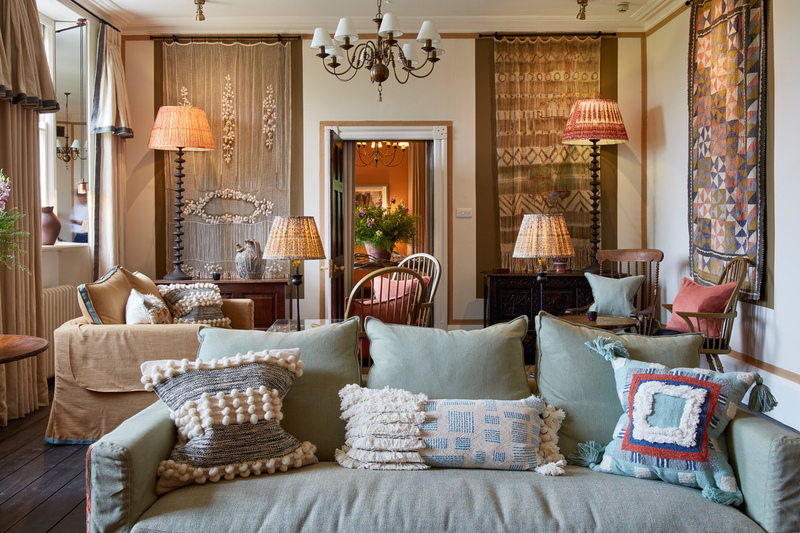 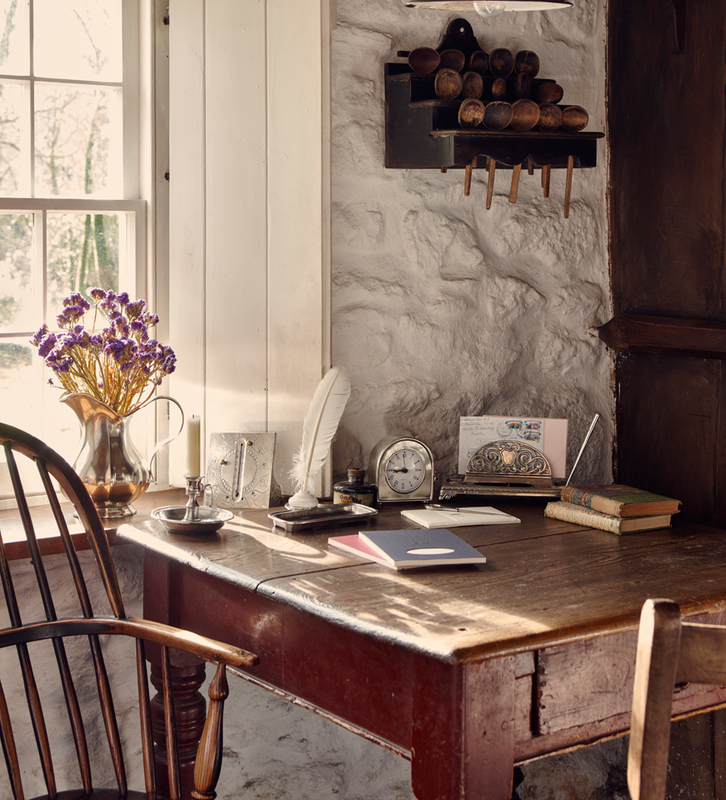 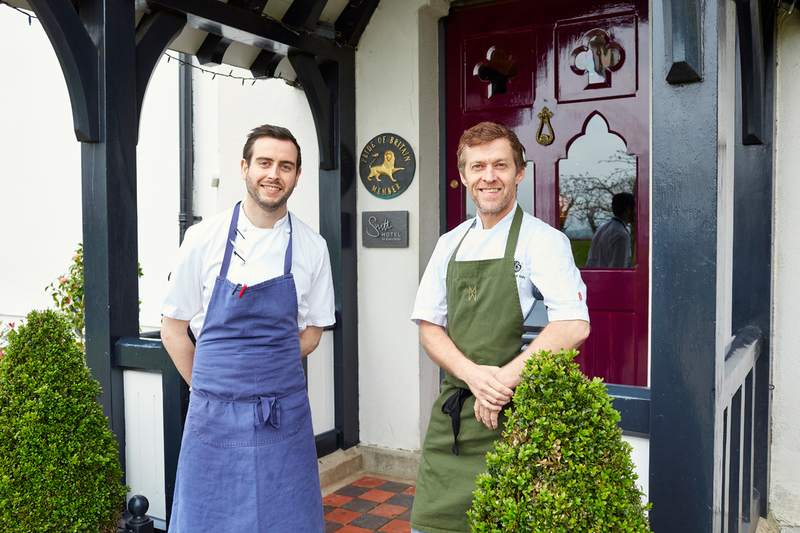 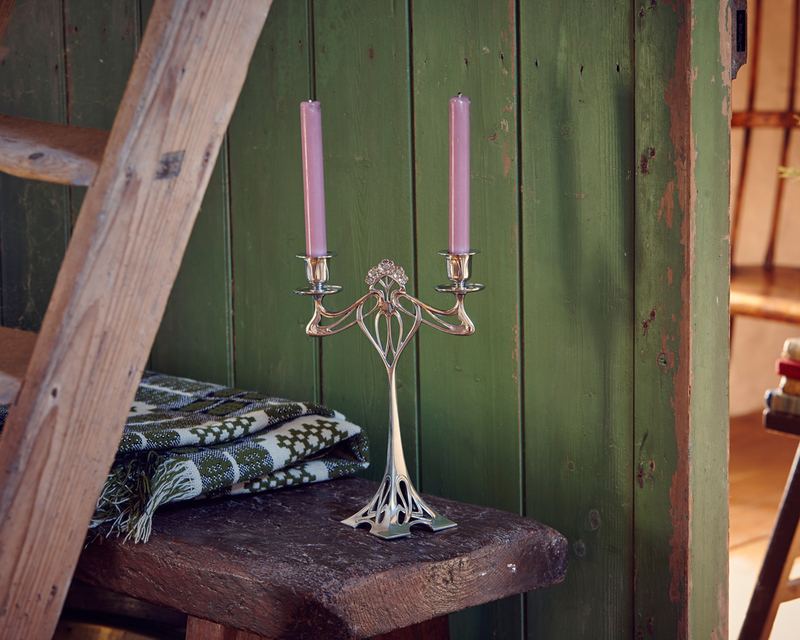 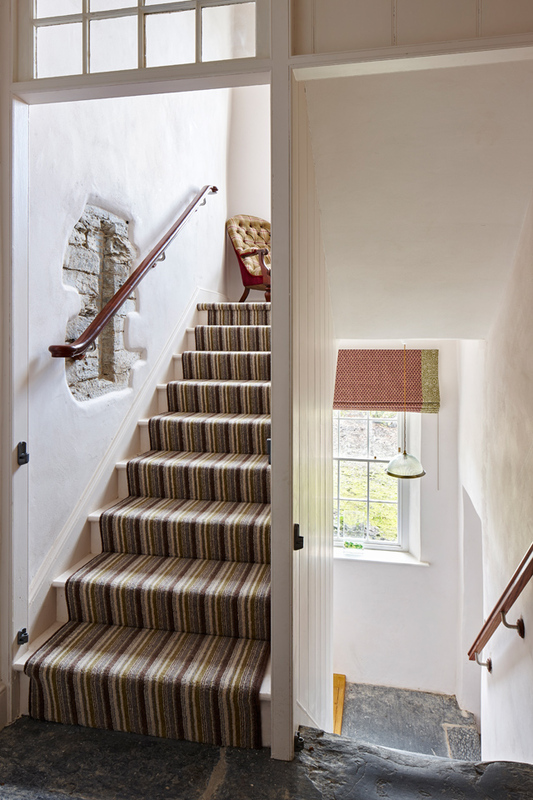 One of the locations for this shoot was the stunning The Welsh House in Pembrokeshire. 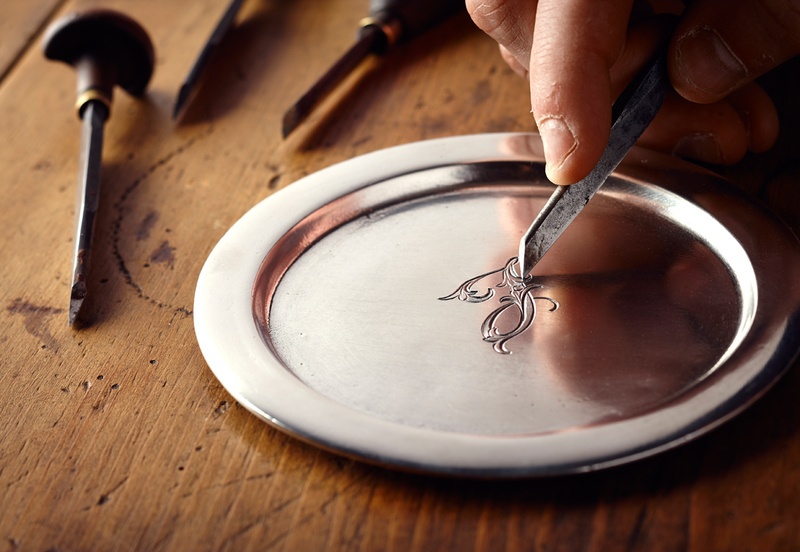 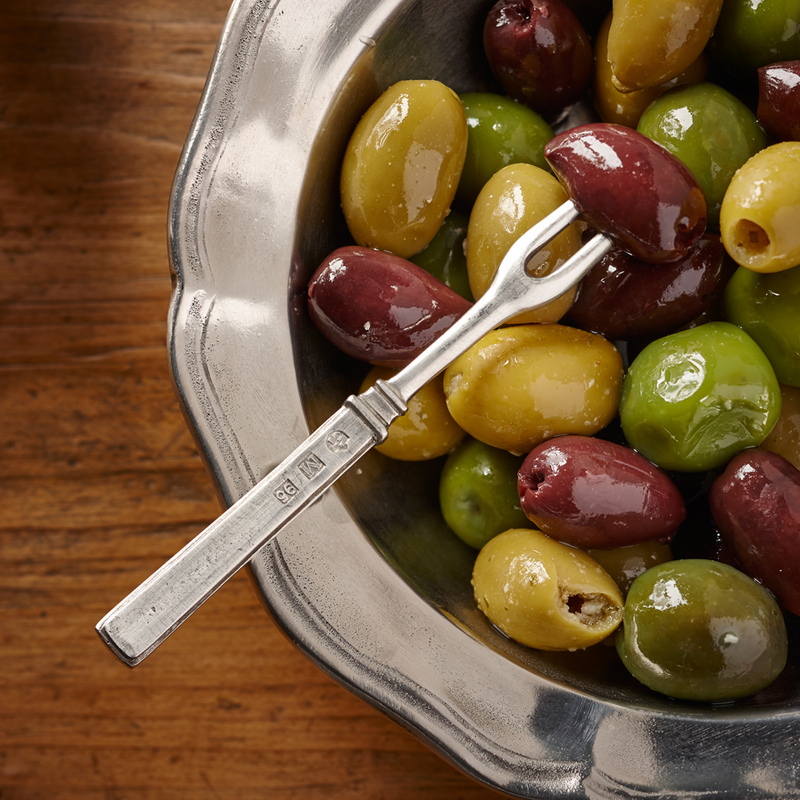 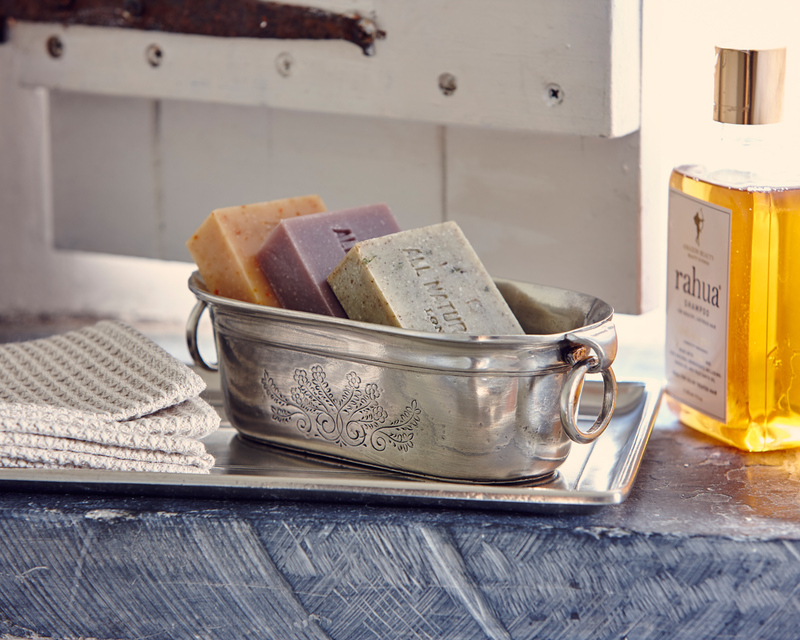 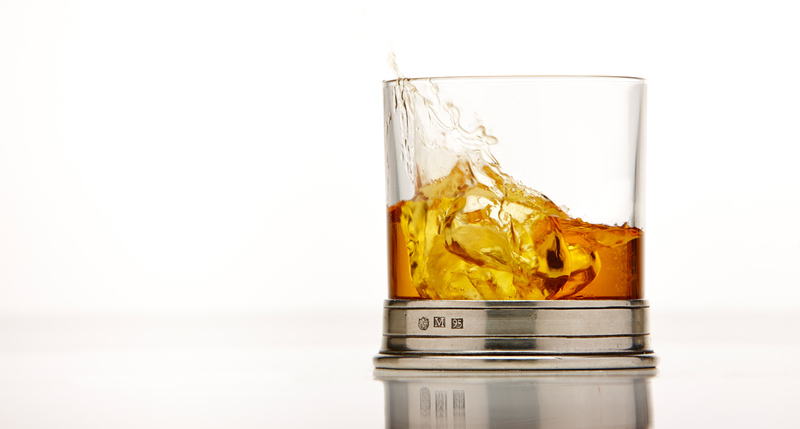 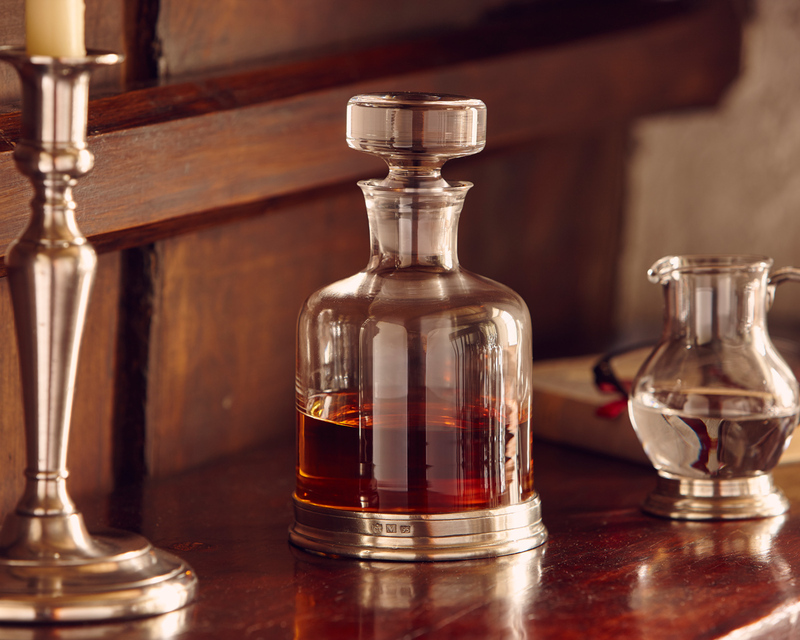 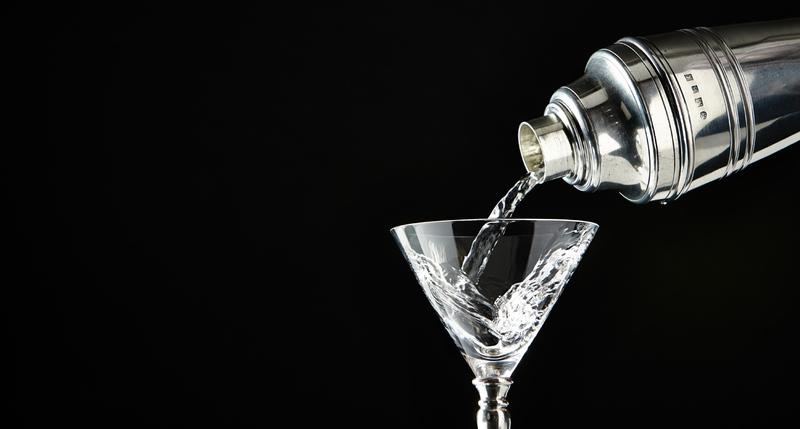 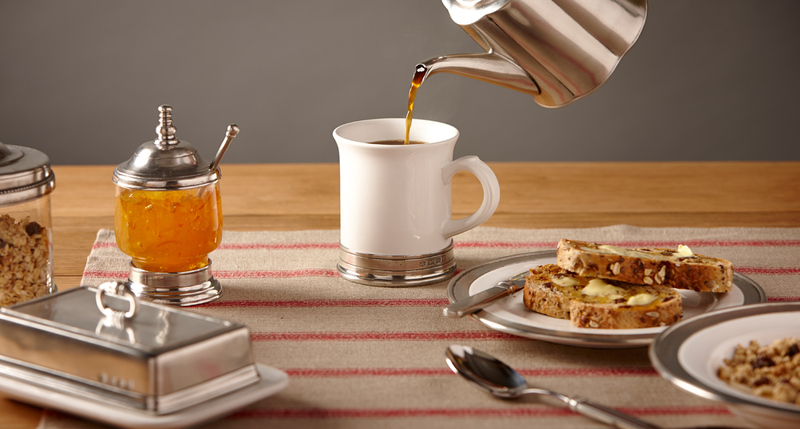 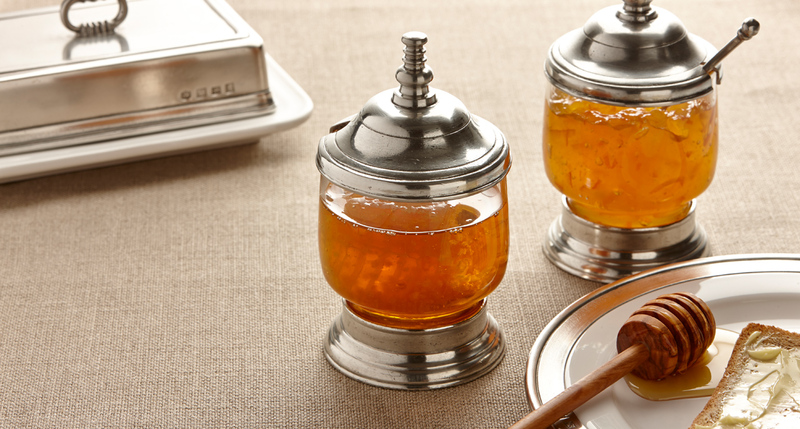 Studio photography for an extensive UK website update for the high quality Italian pewter retailer Cosi Tabellini. 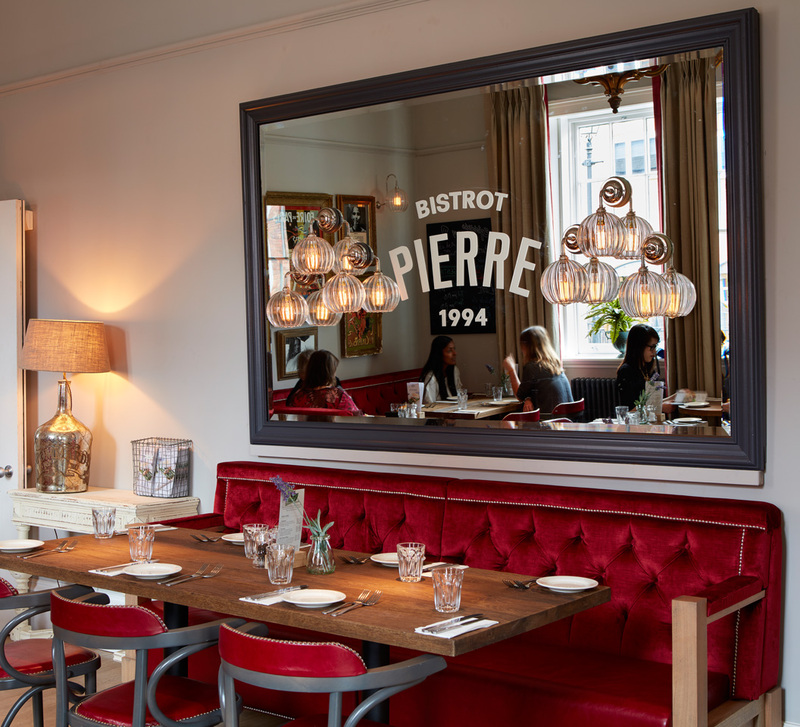 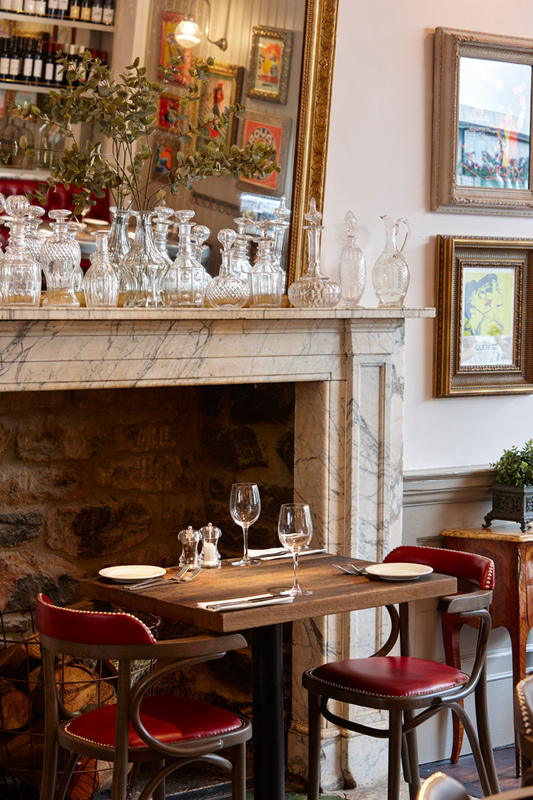 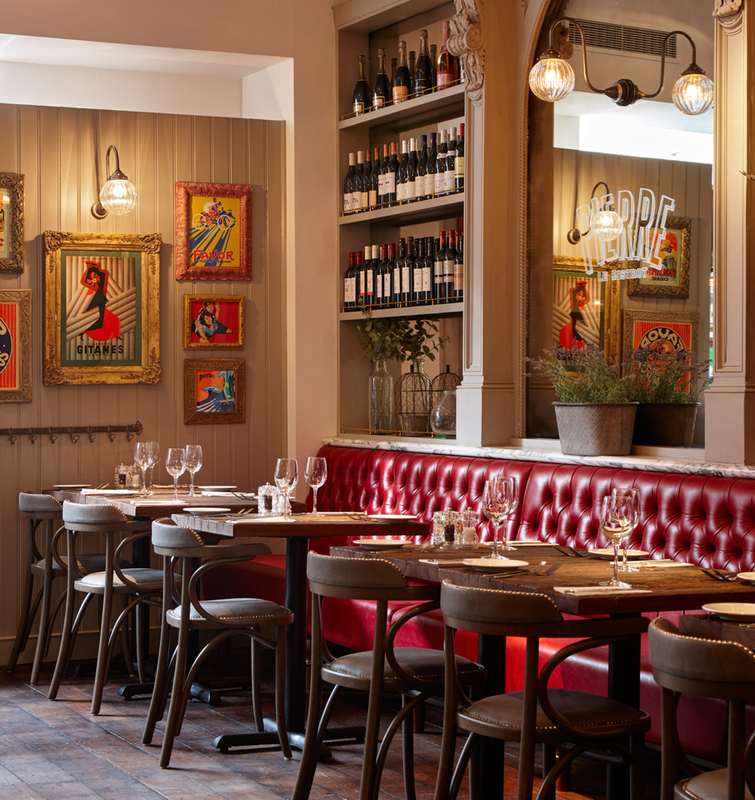 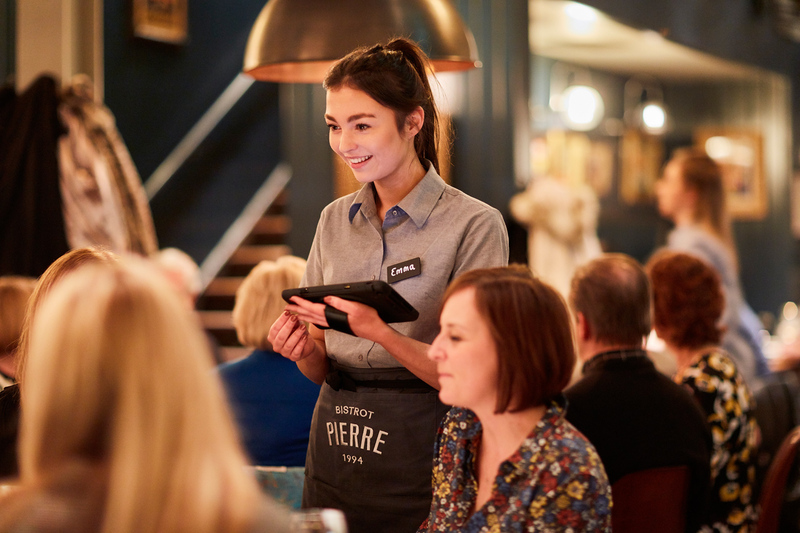 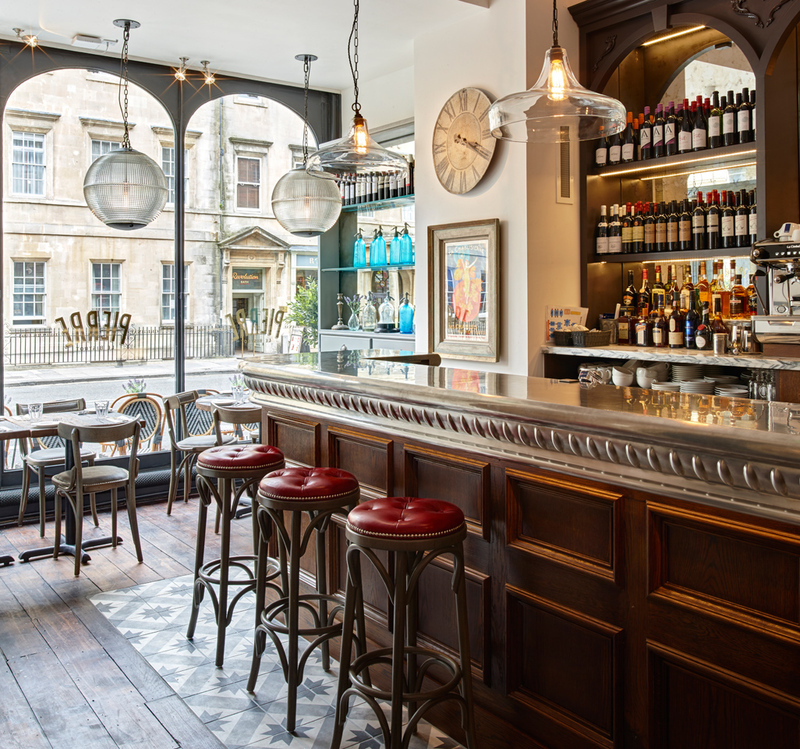 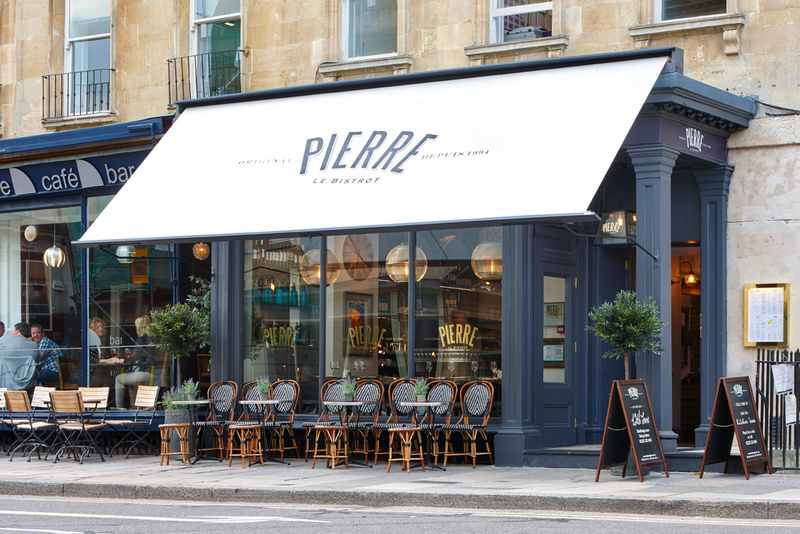 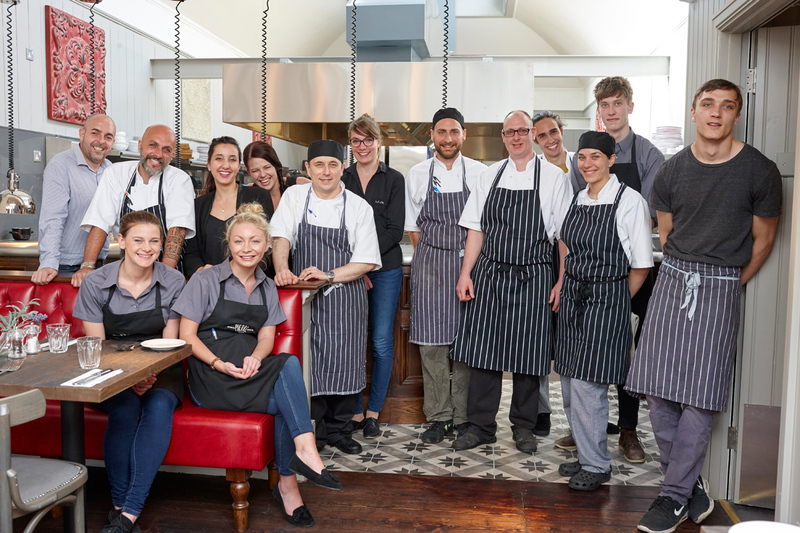 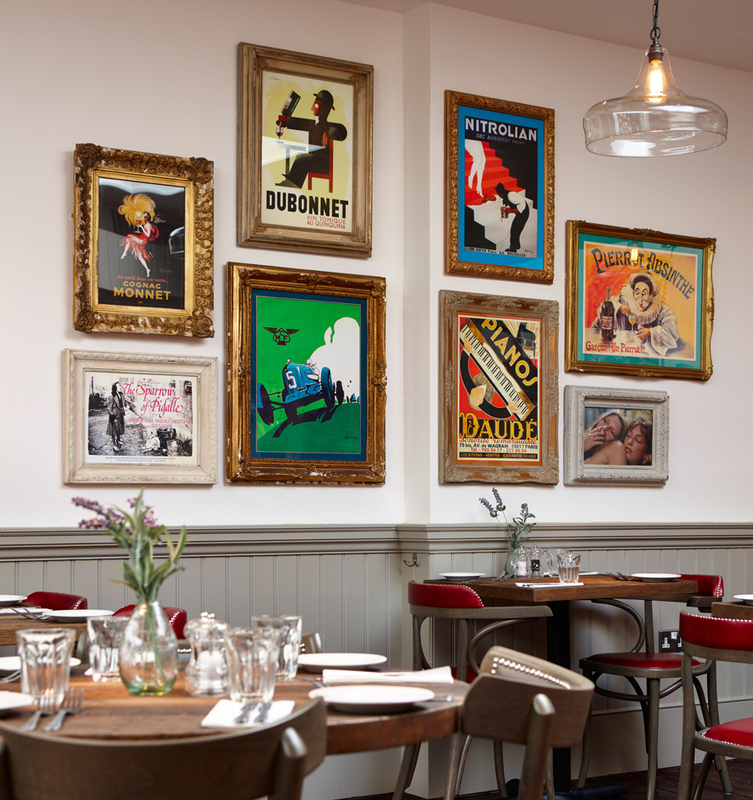 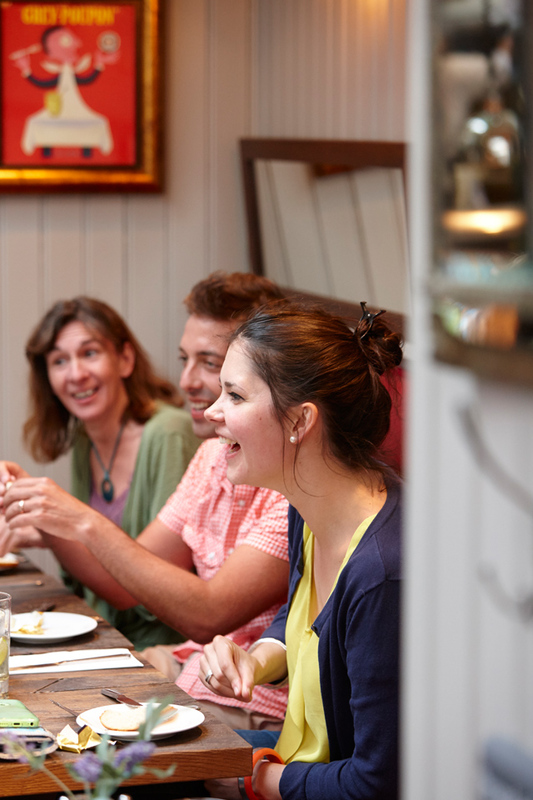 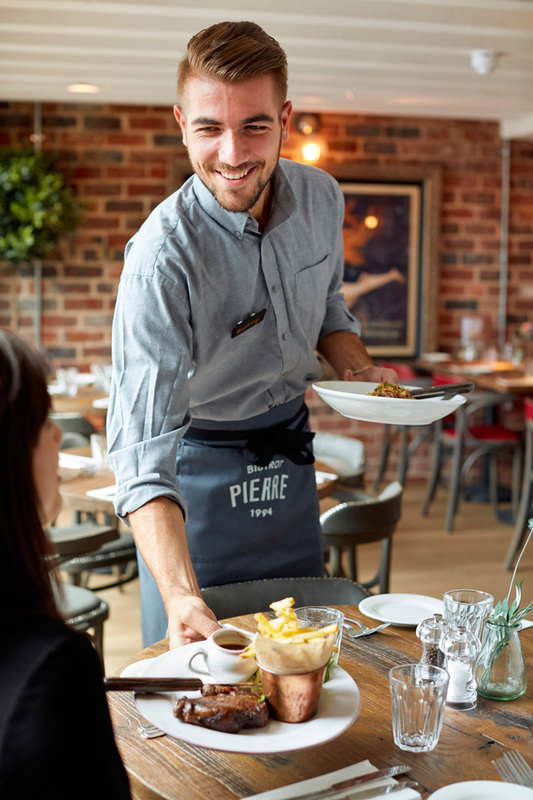 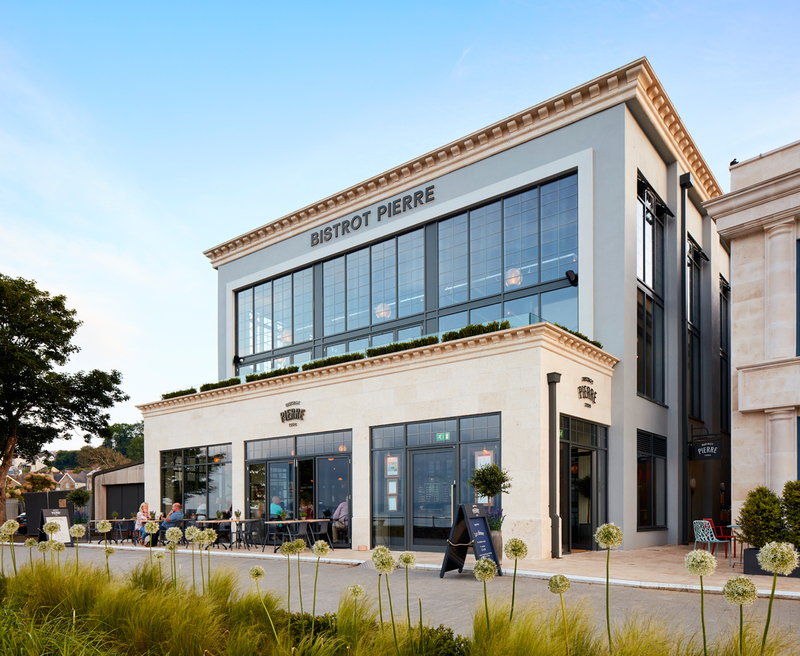 Photography commission for the opening of Le Bistrot Pierre’s 13th establishment located on George Street in the centre of the world heritage city of Bath. 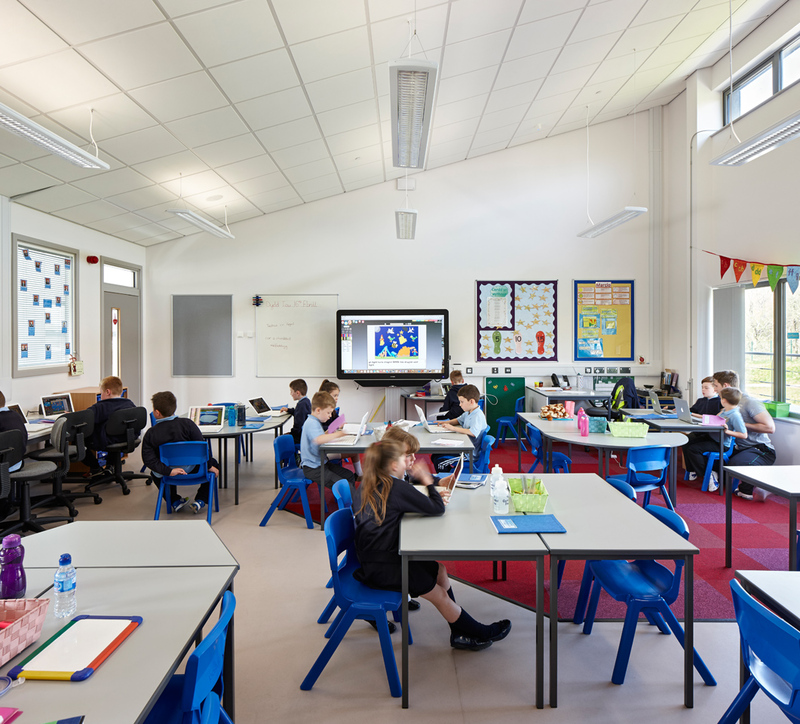 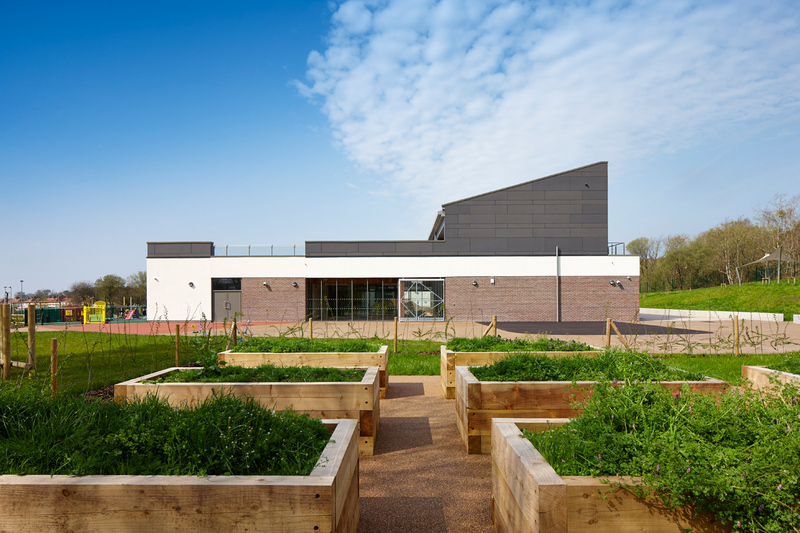 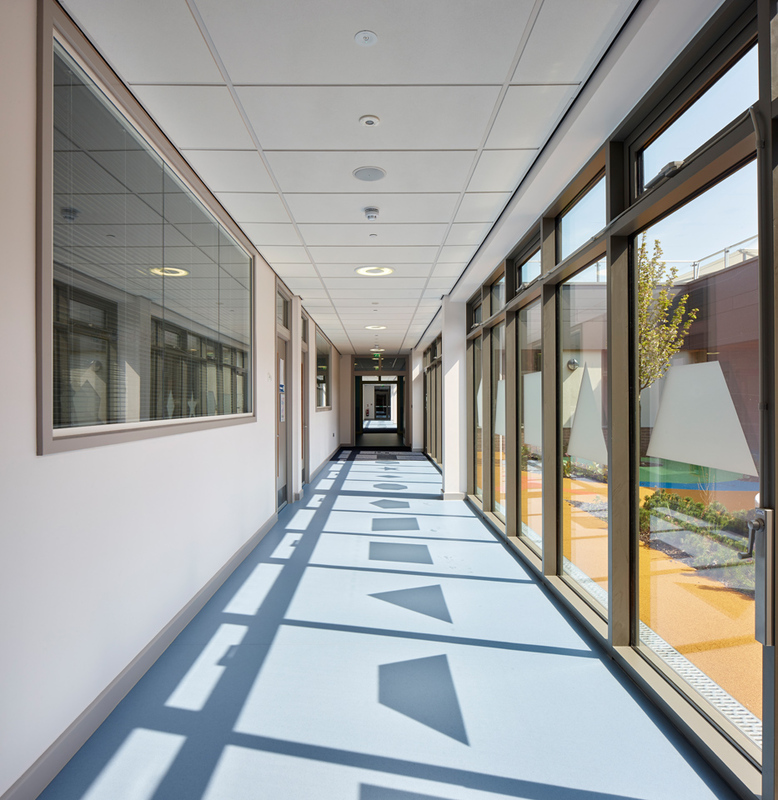 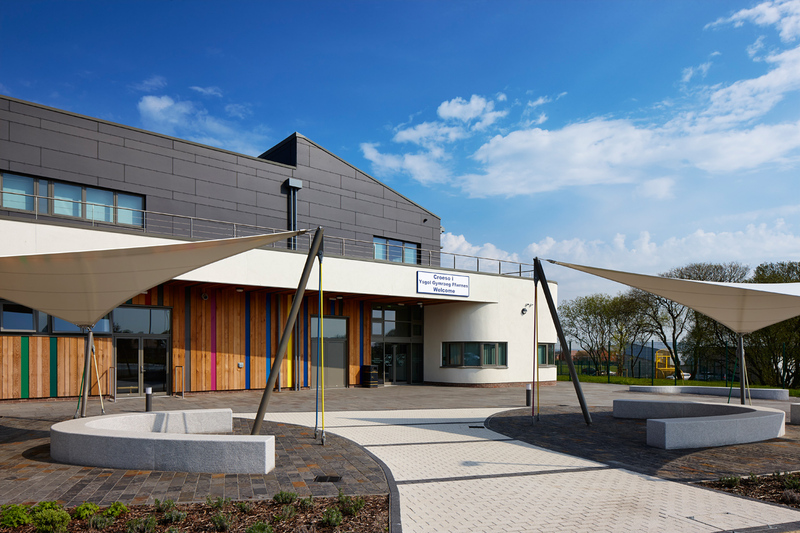 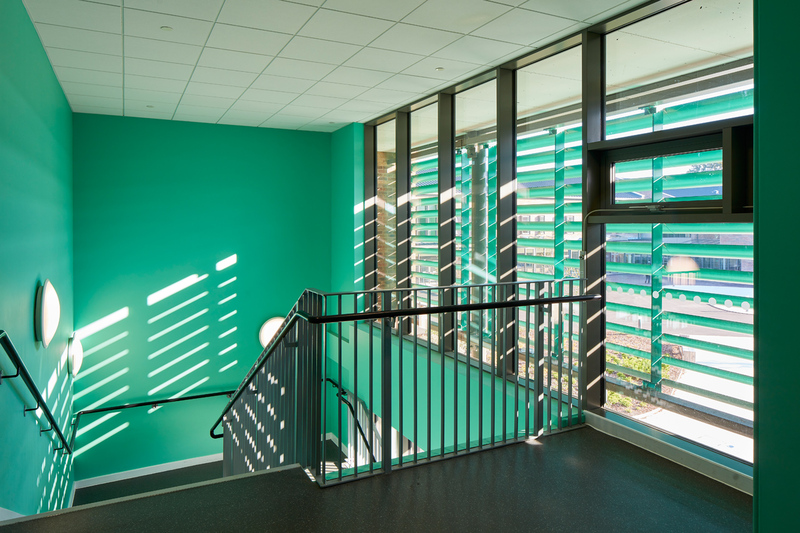 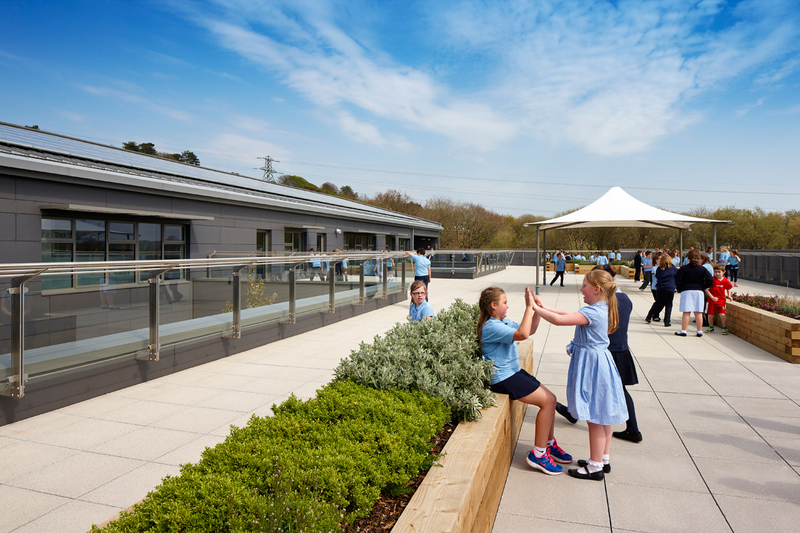 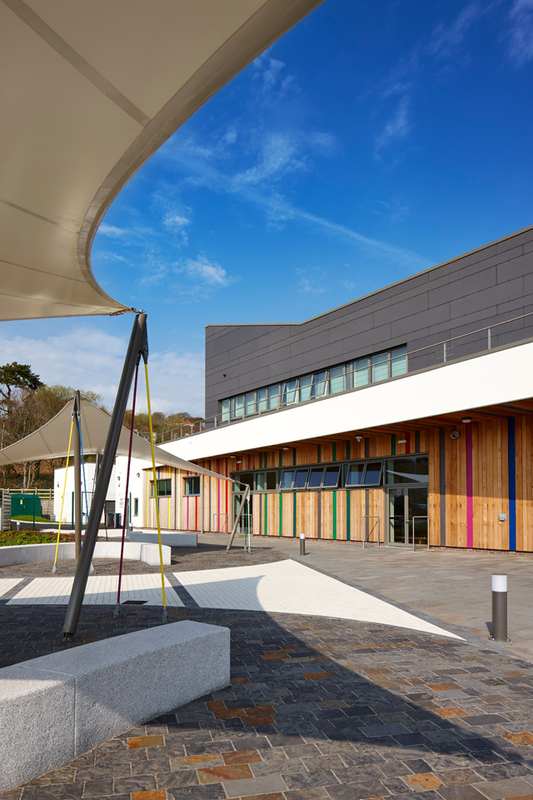 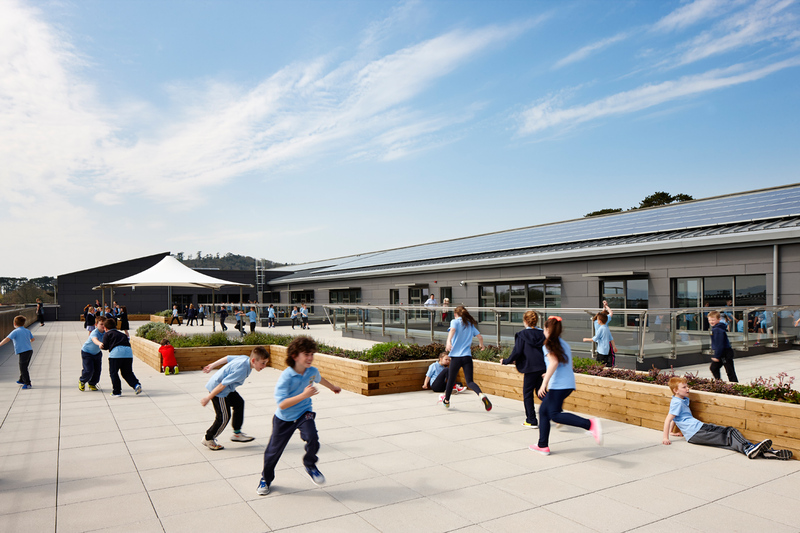 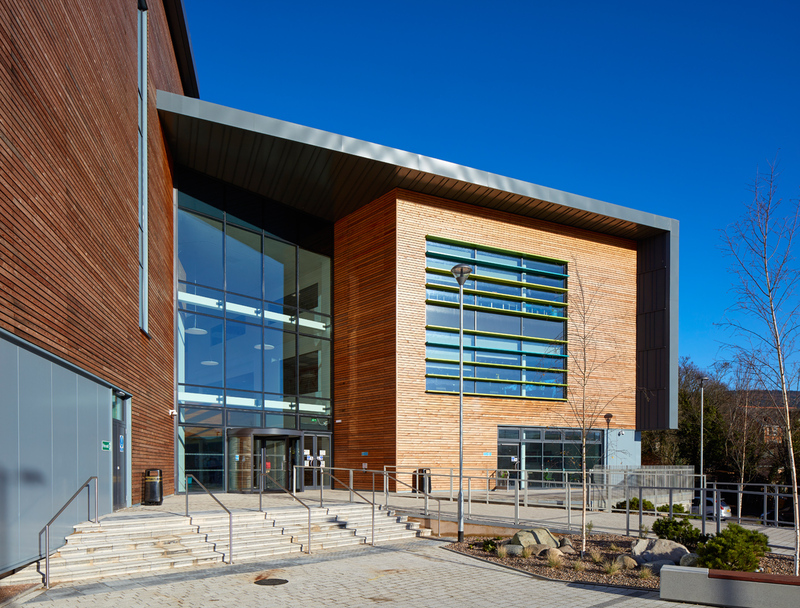 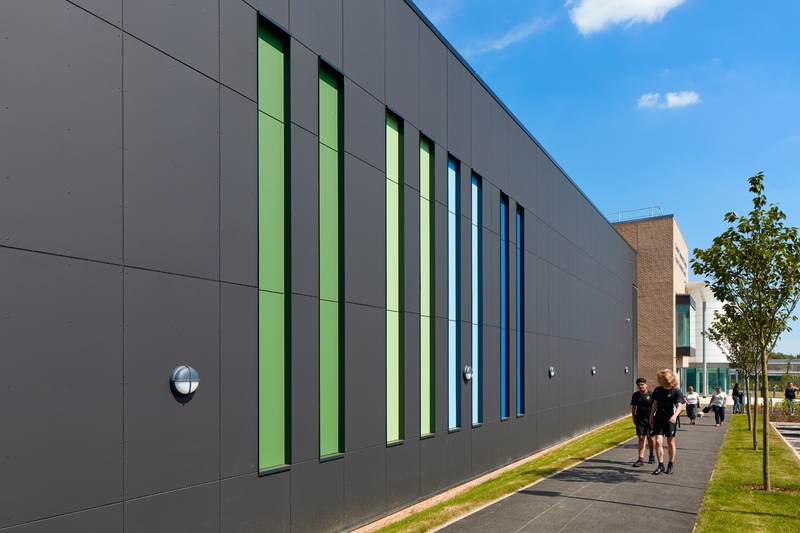 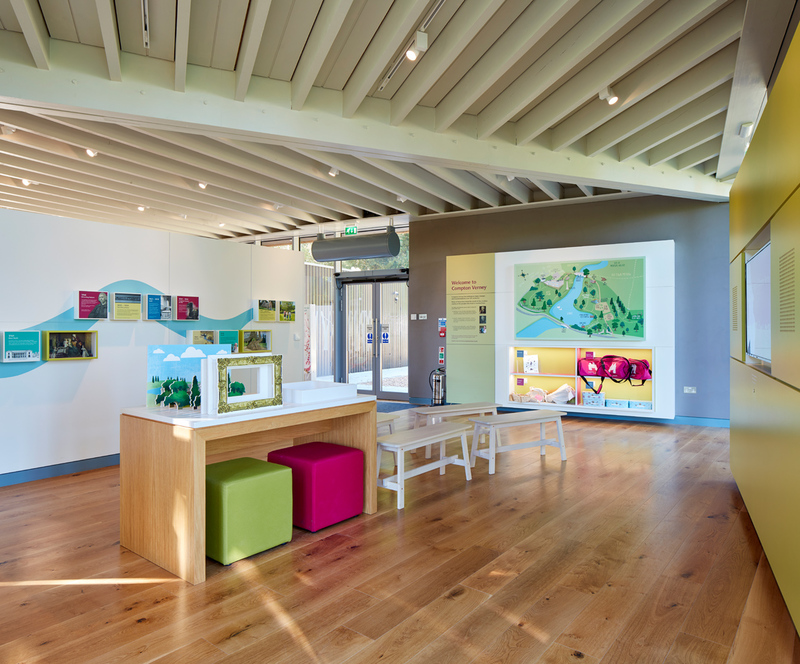 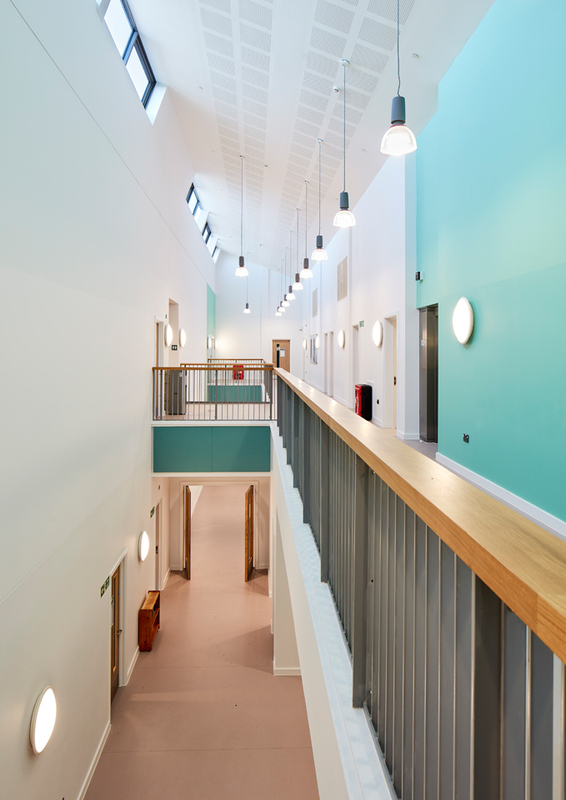 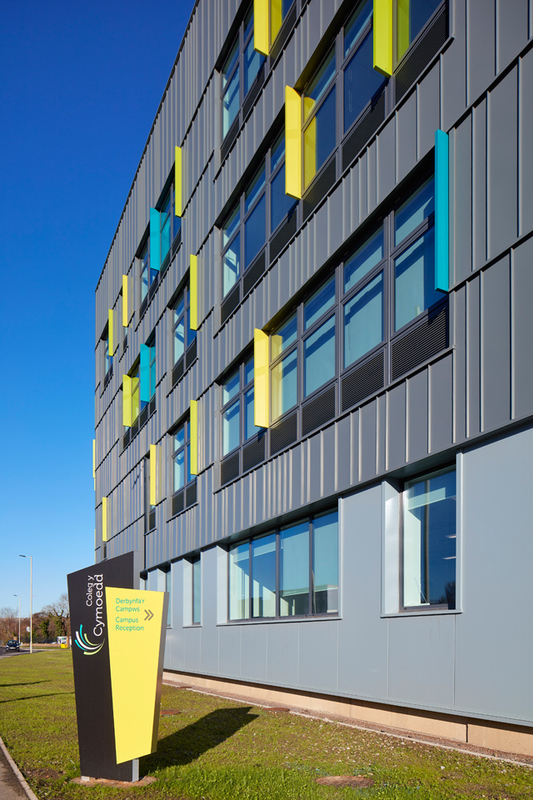 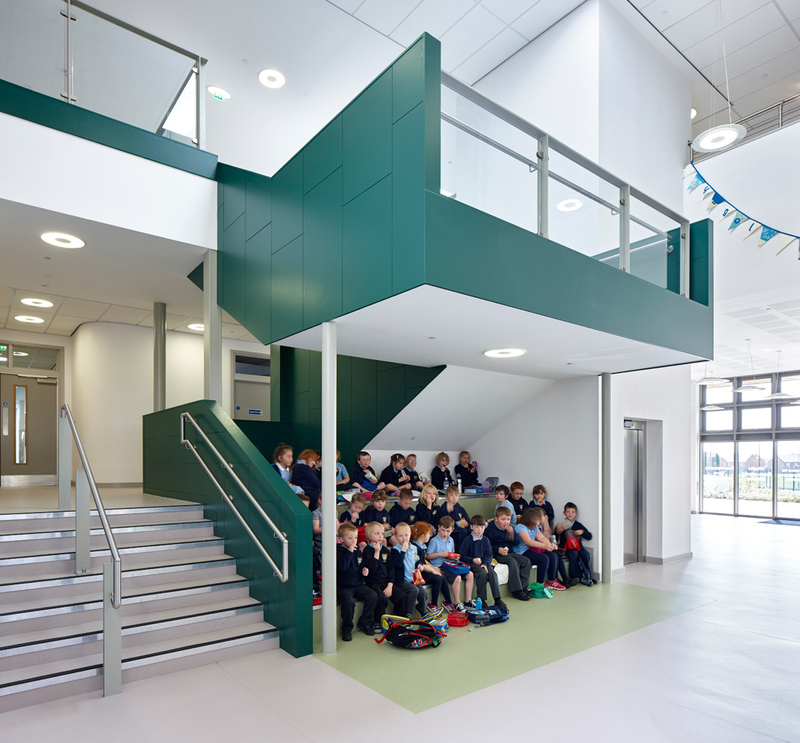 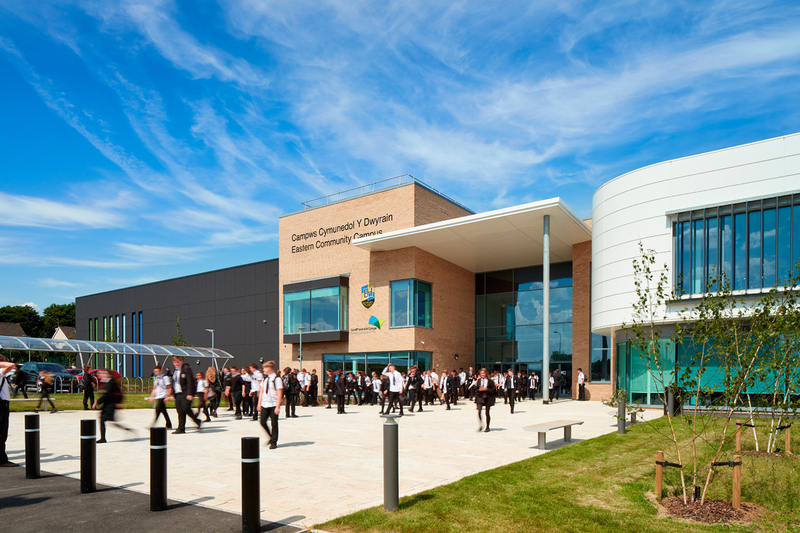 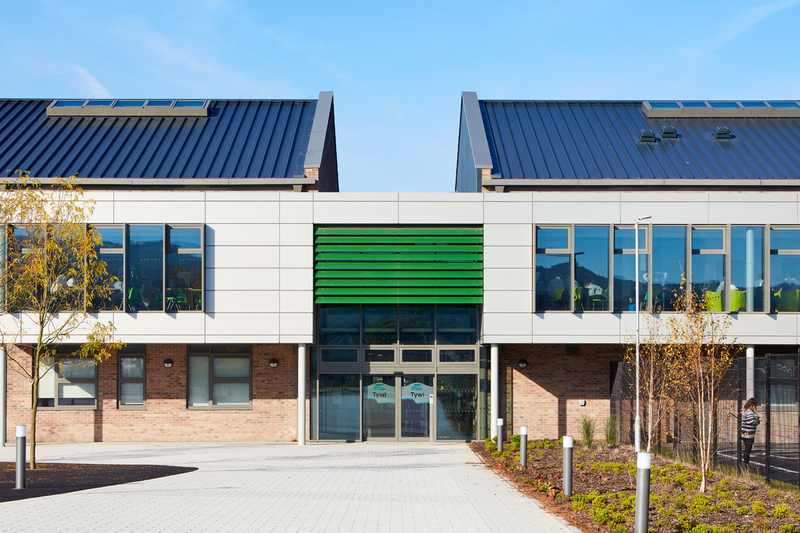 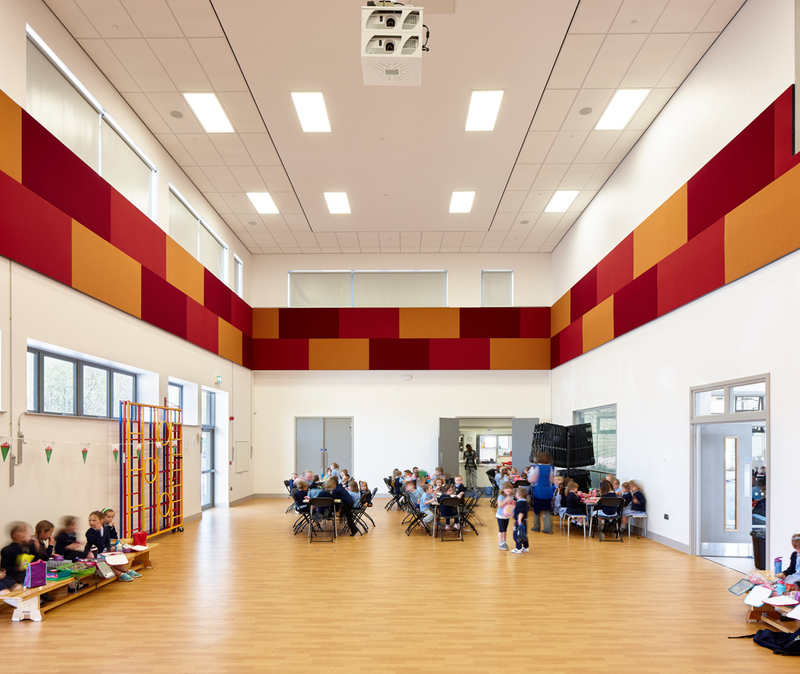 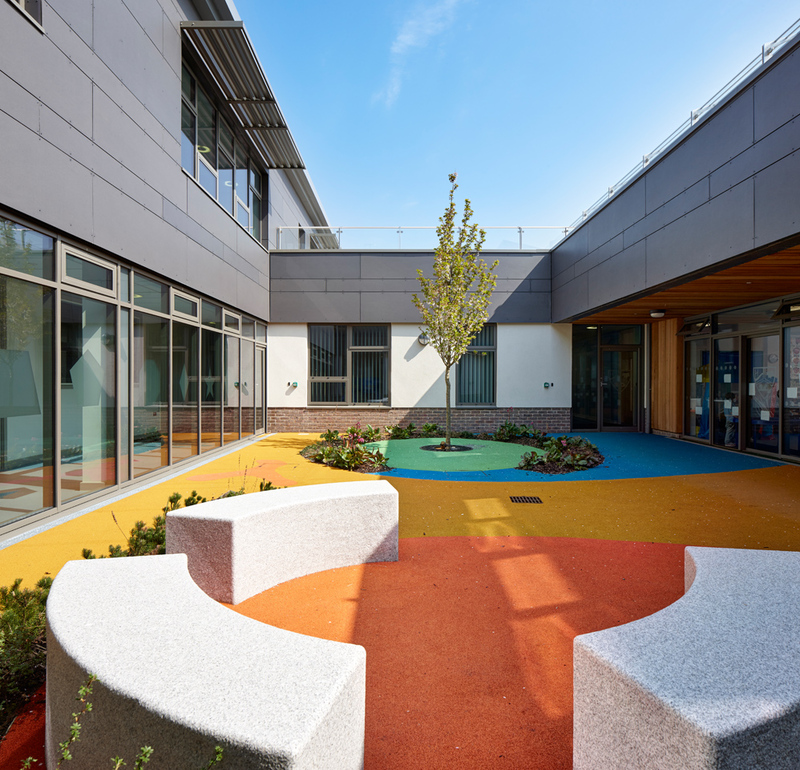 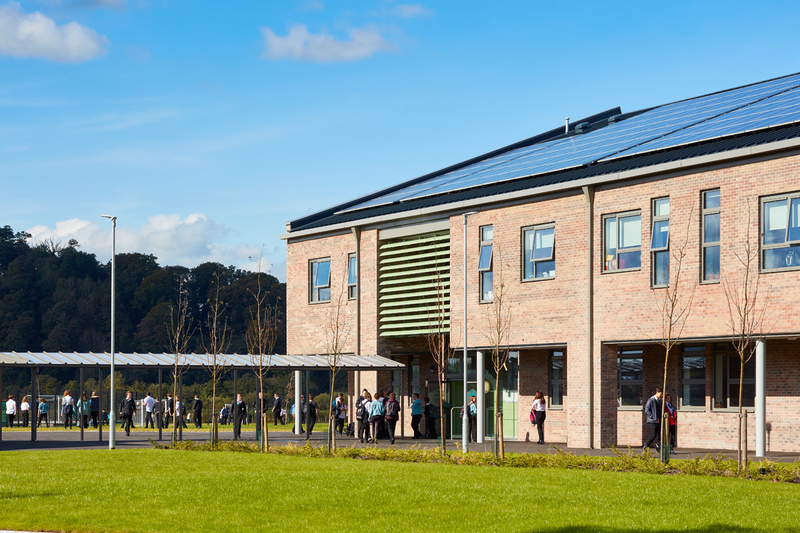 Commission by the architects to photograph Ysgol Ffwrnes, a new BREEAM Outstanding 472 pupil combined Nursery and Primary Welsh medium School in the Furnace area of Llanelli.